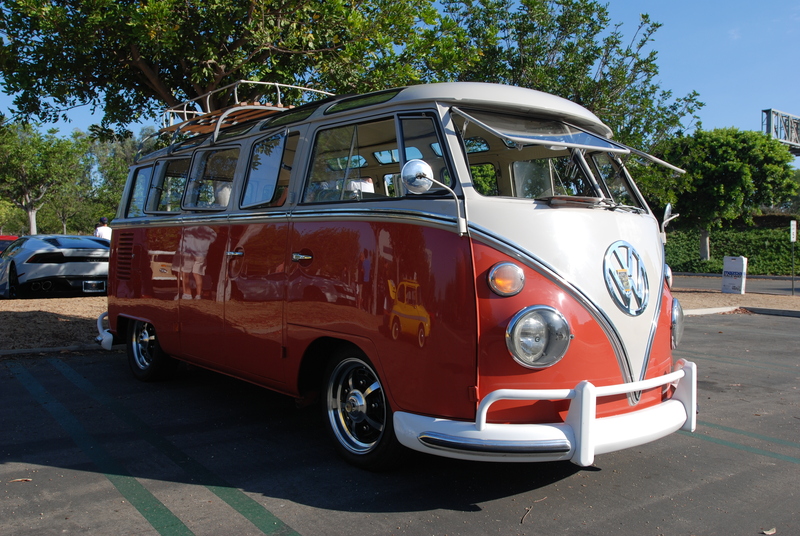 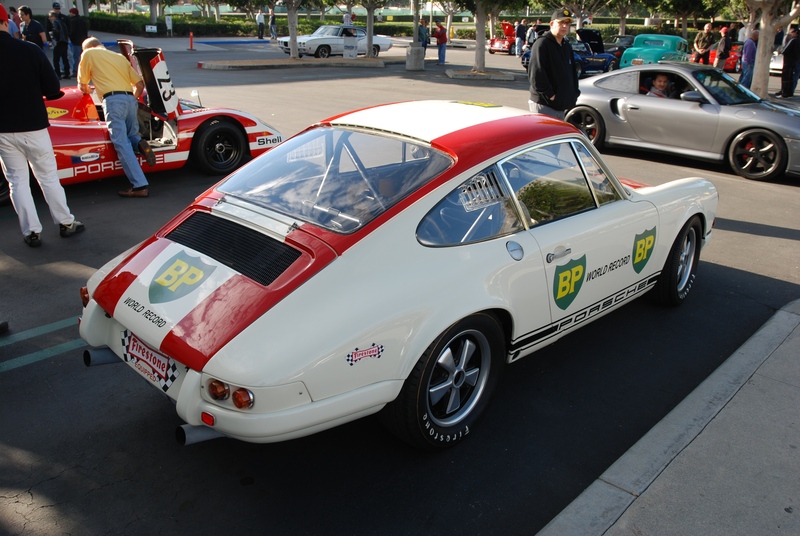 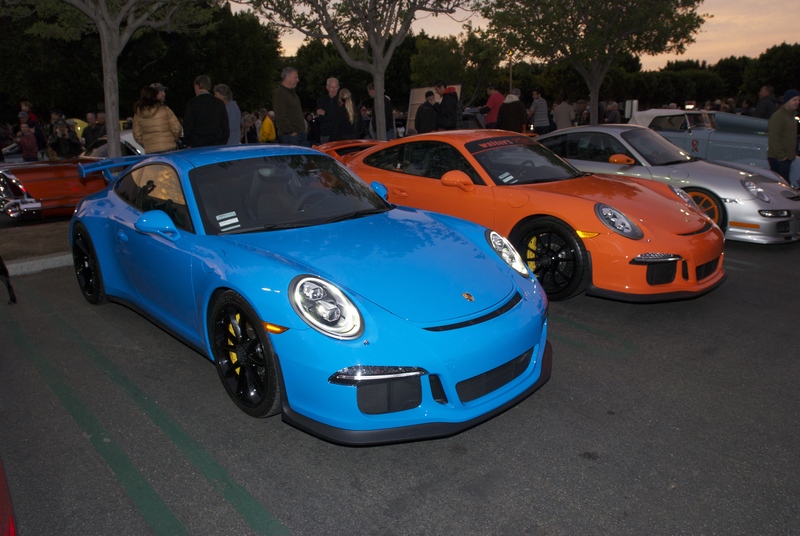 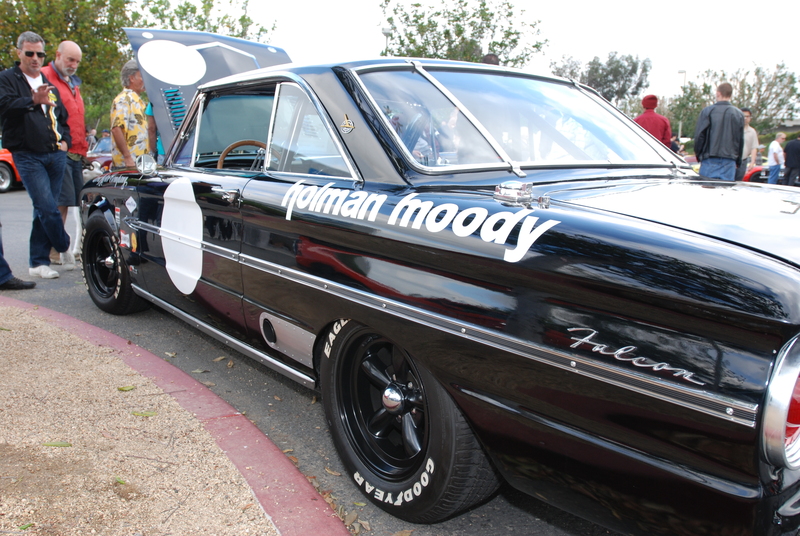 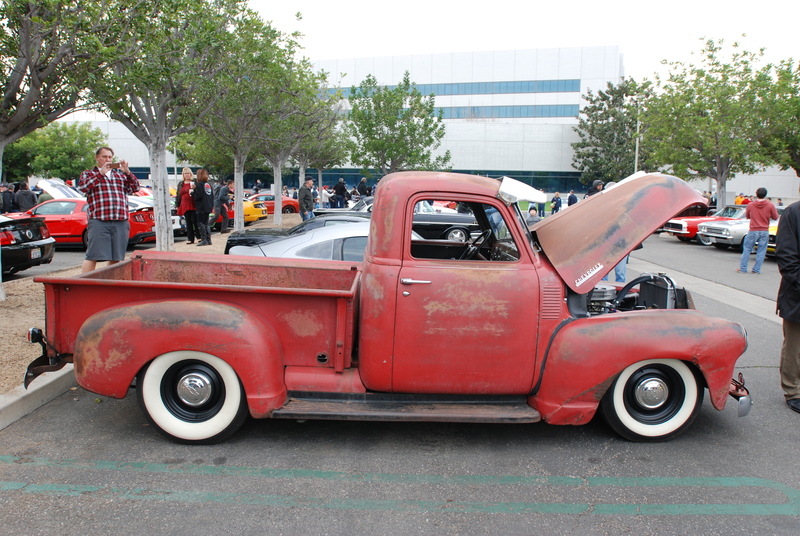 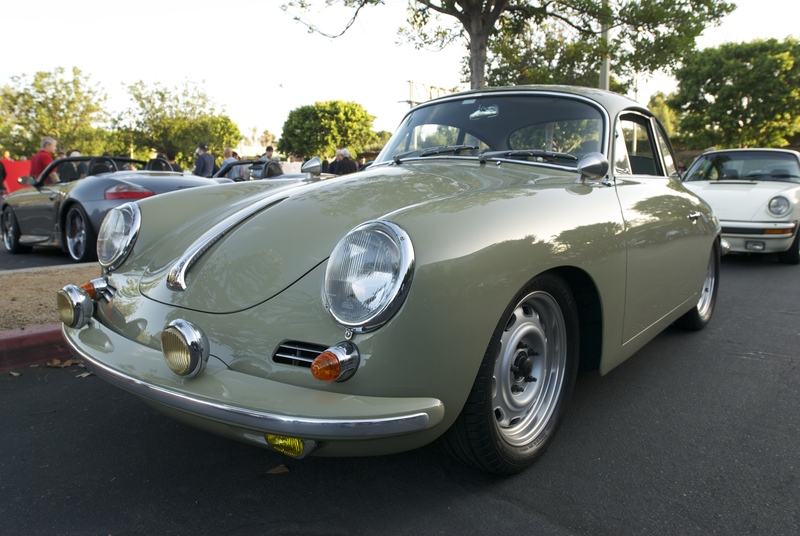 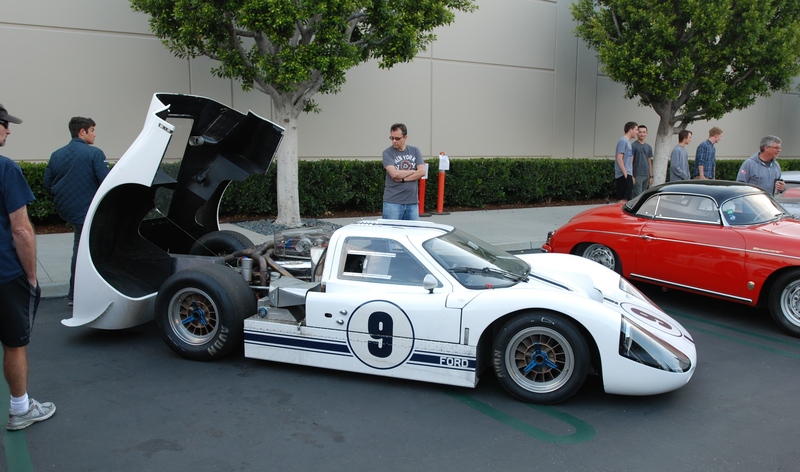 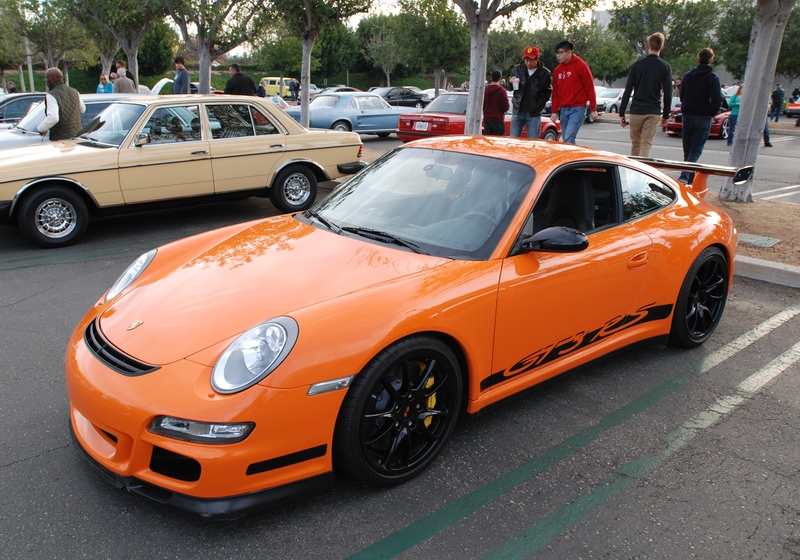 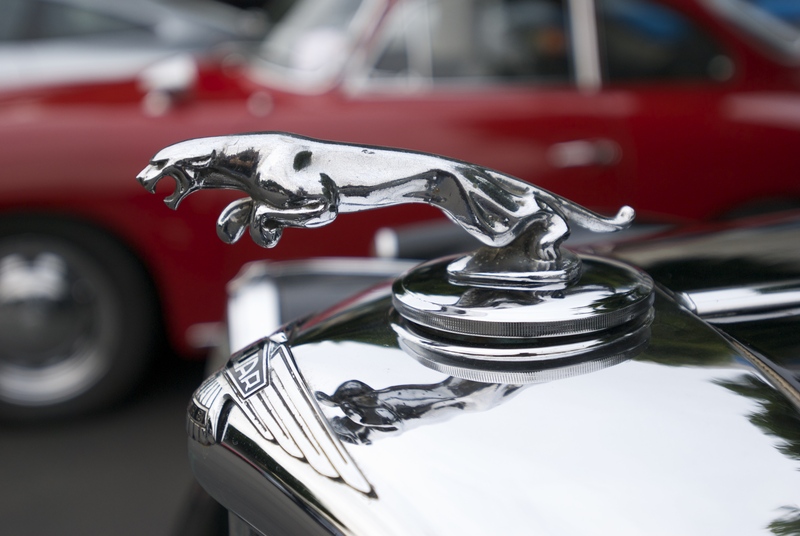 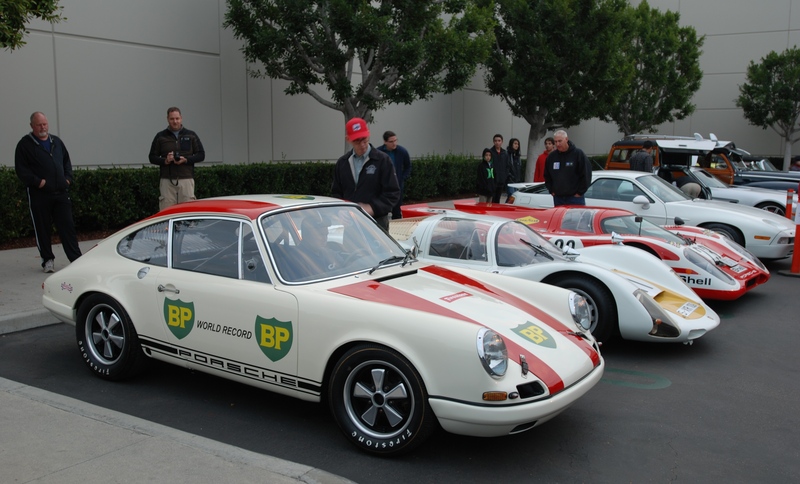 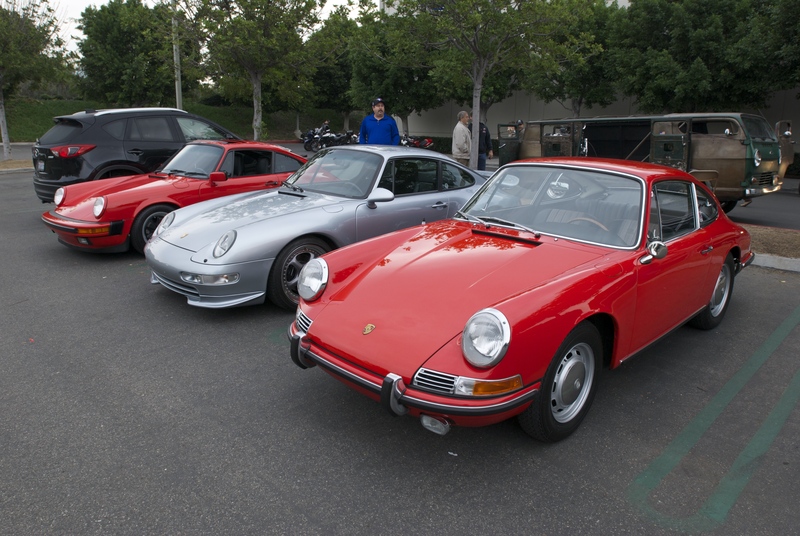 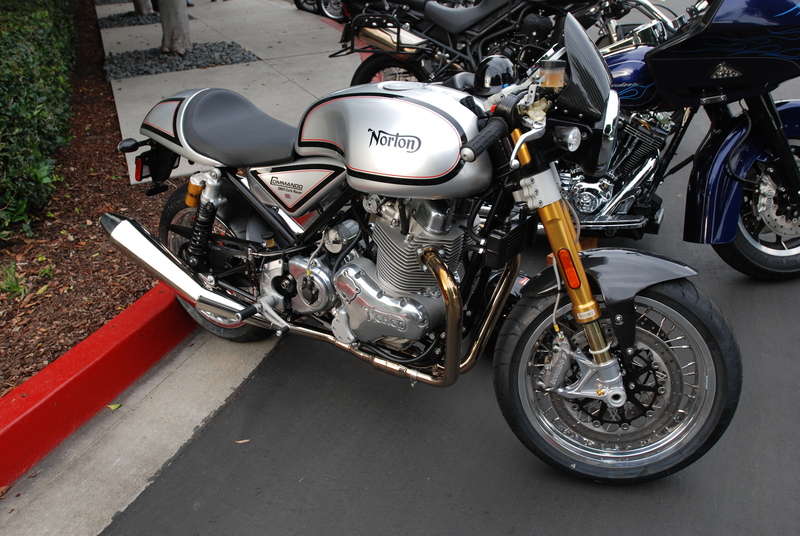 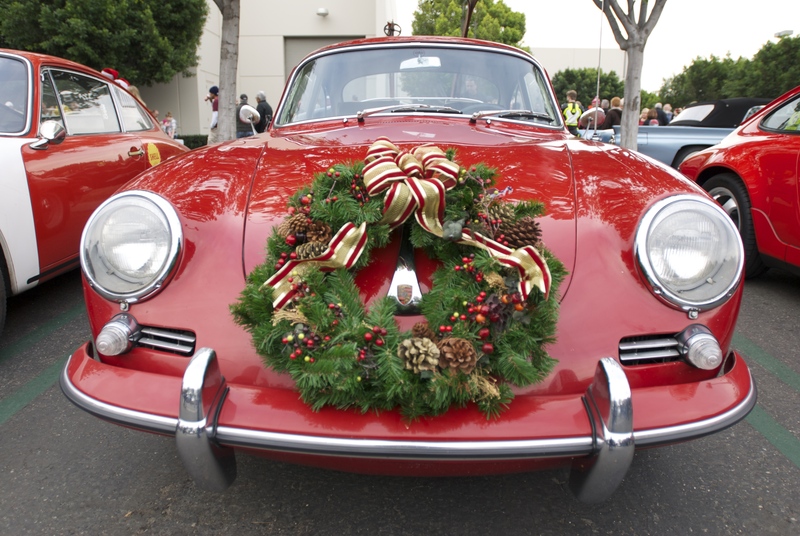 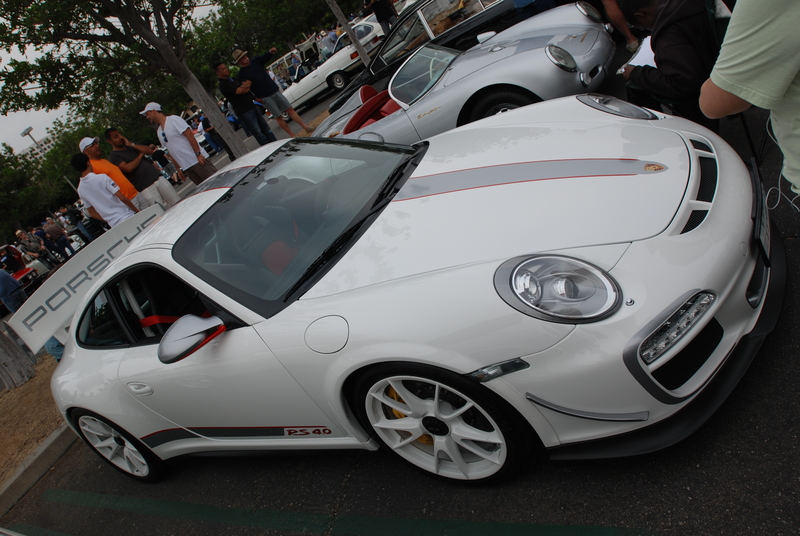 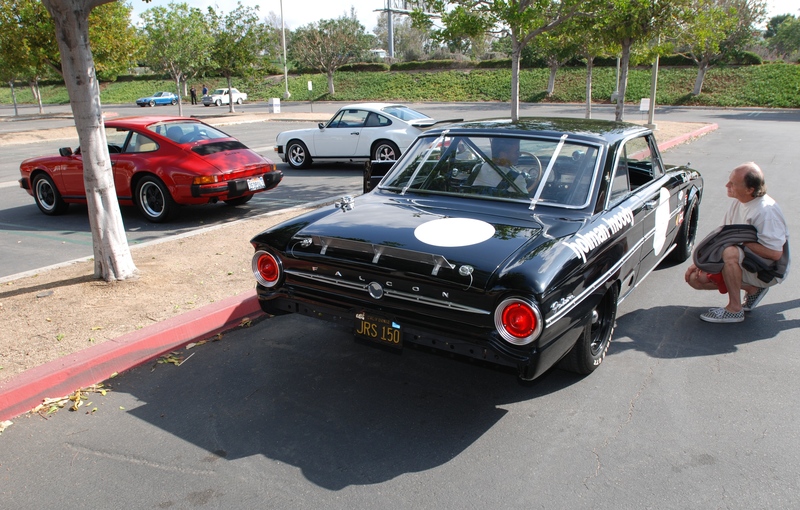 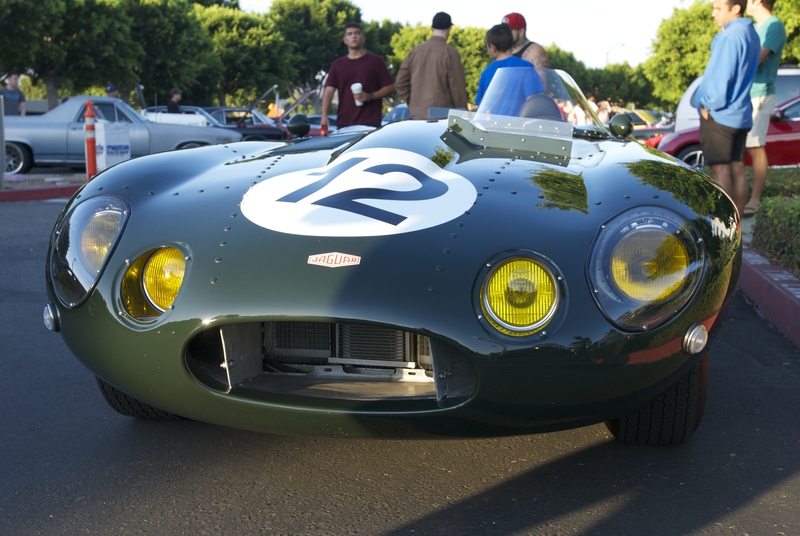 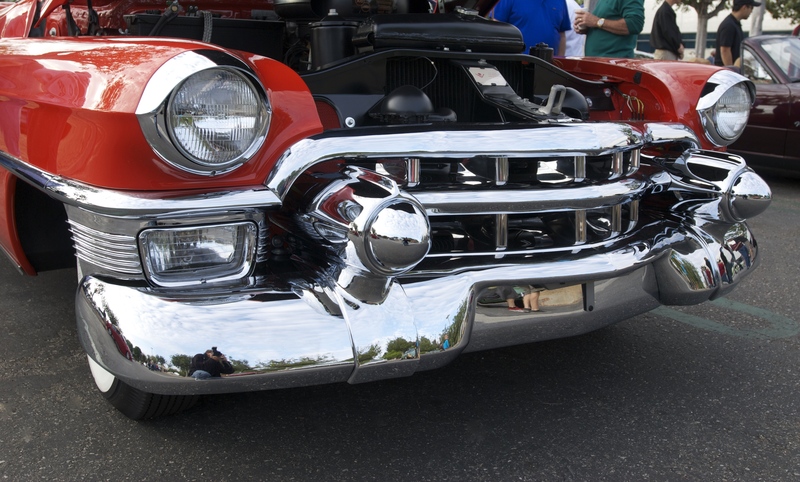 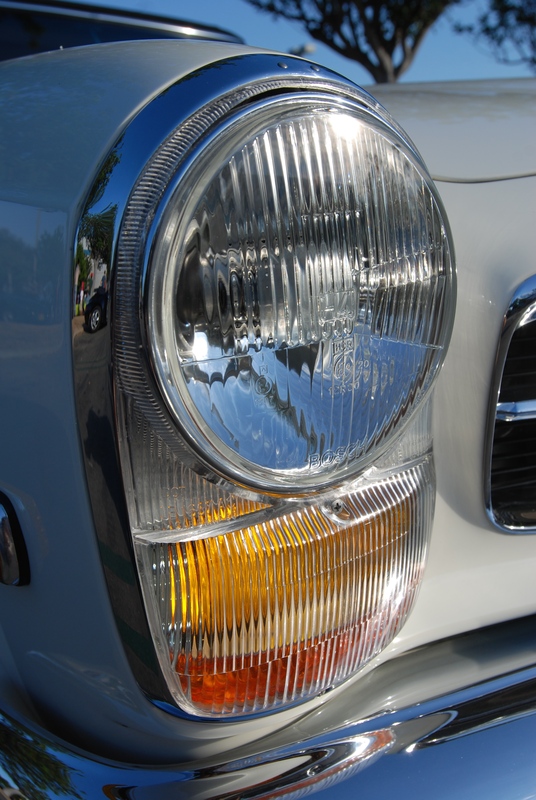 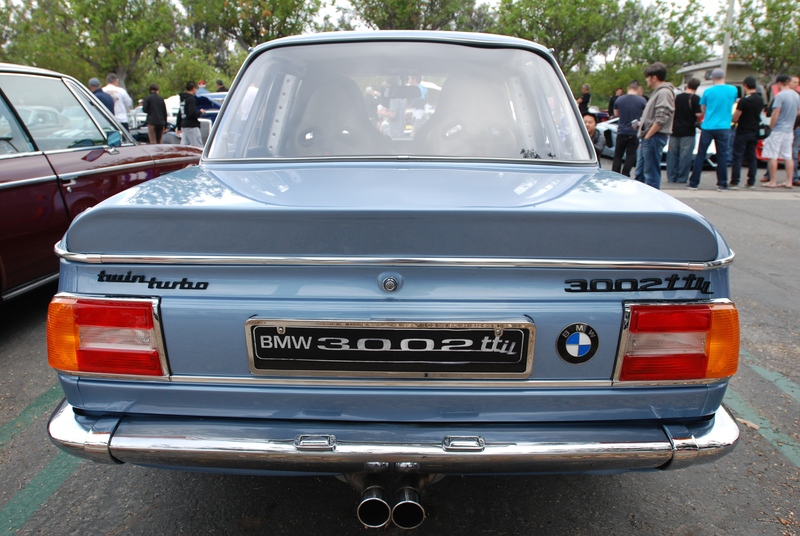 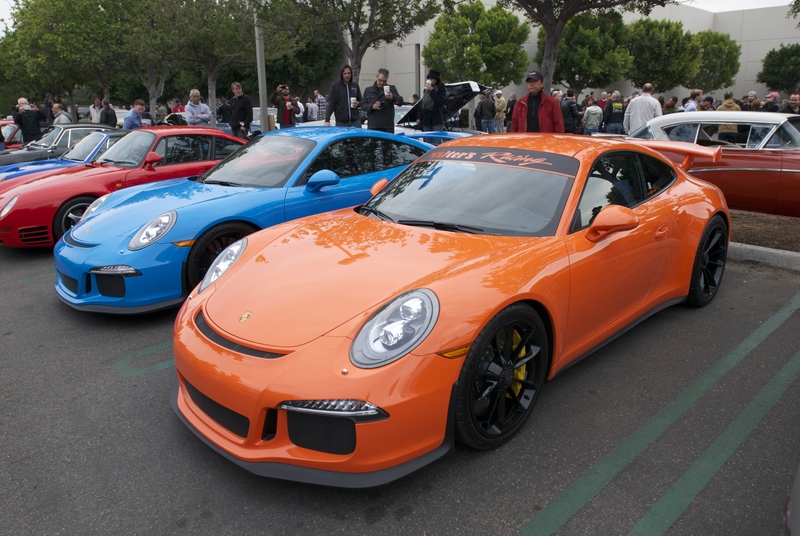 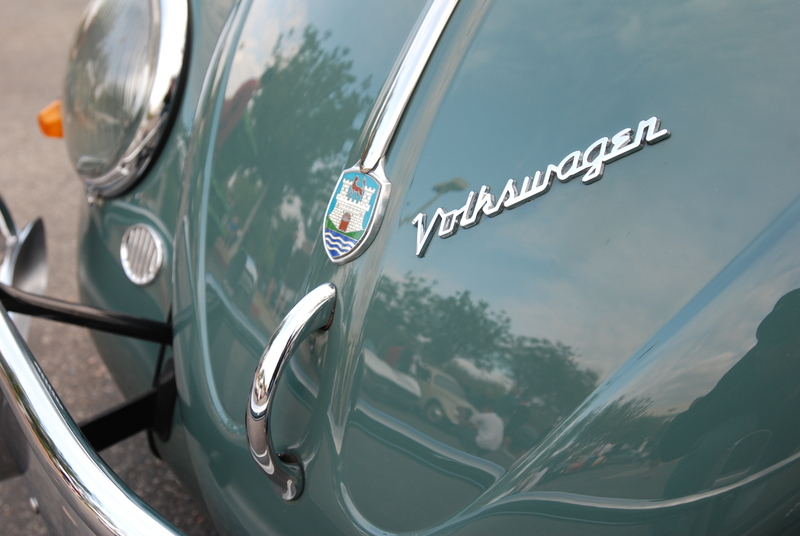 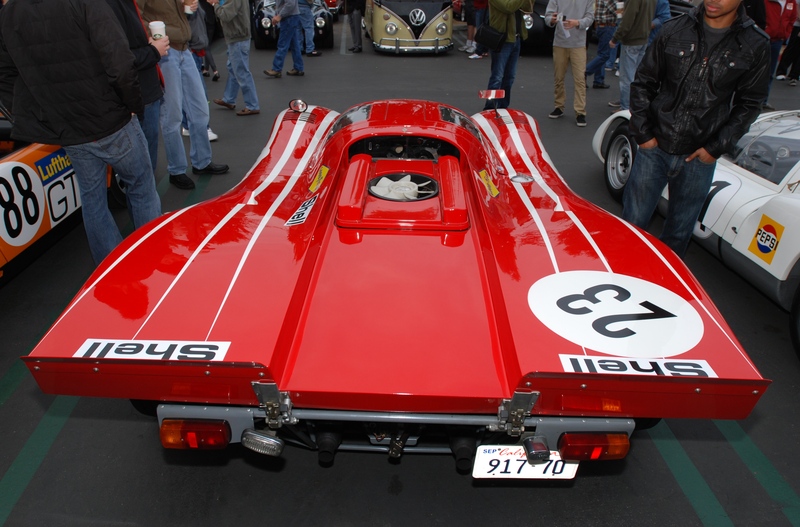 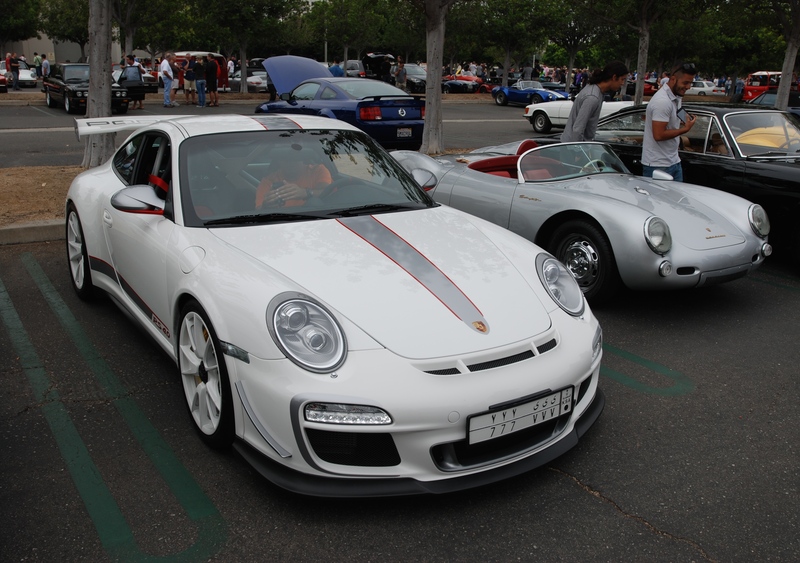 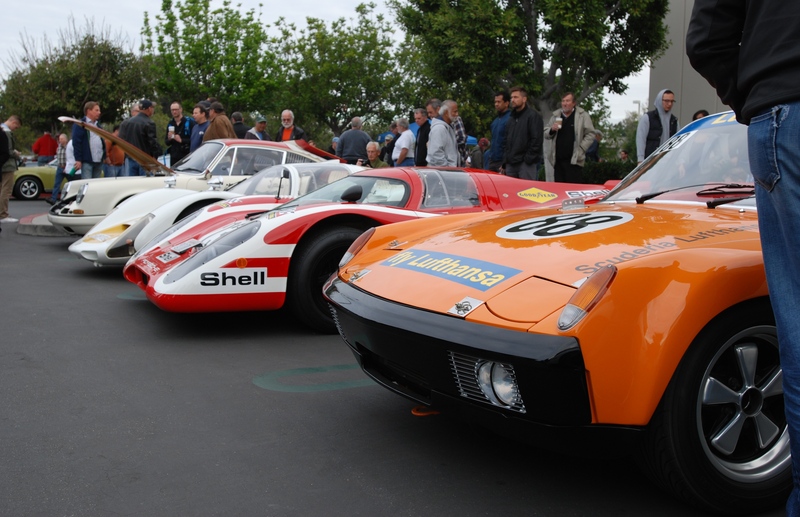 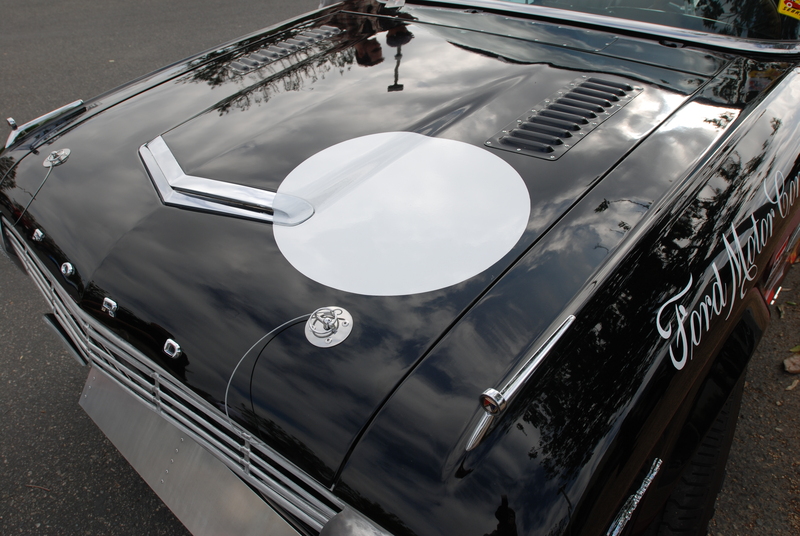 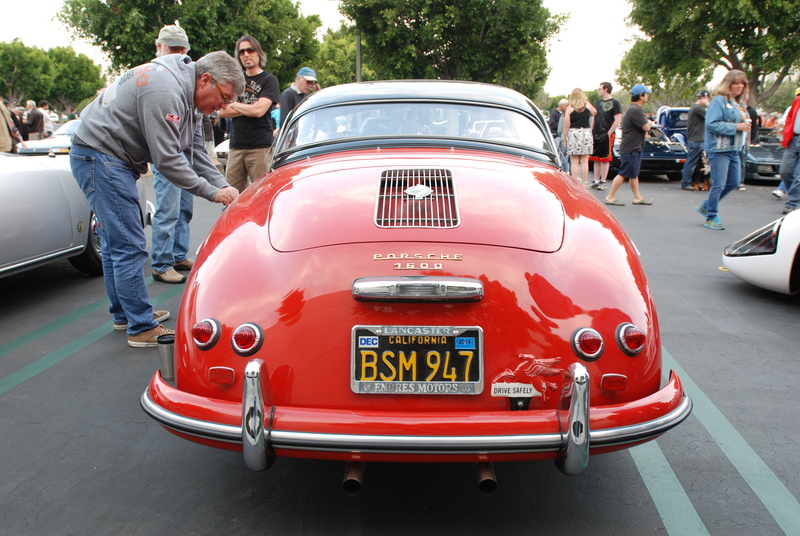 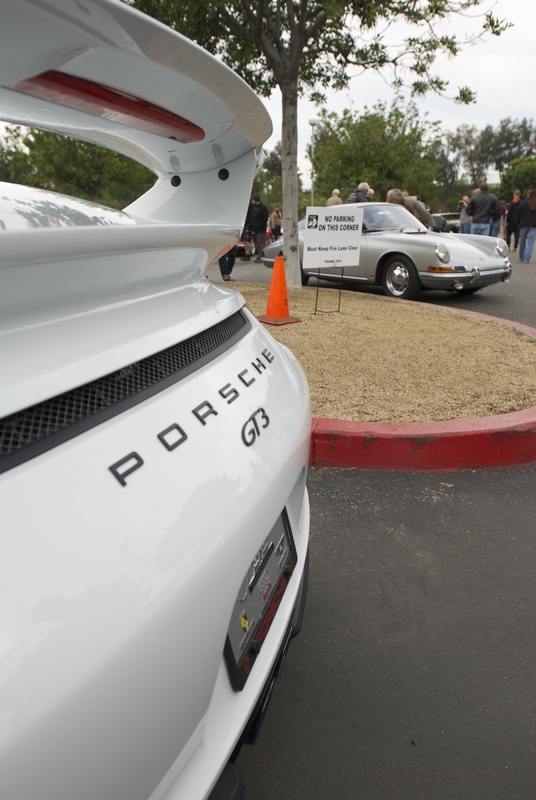 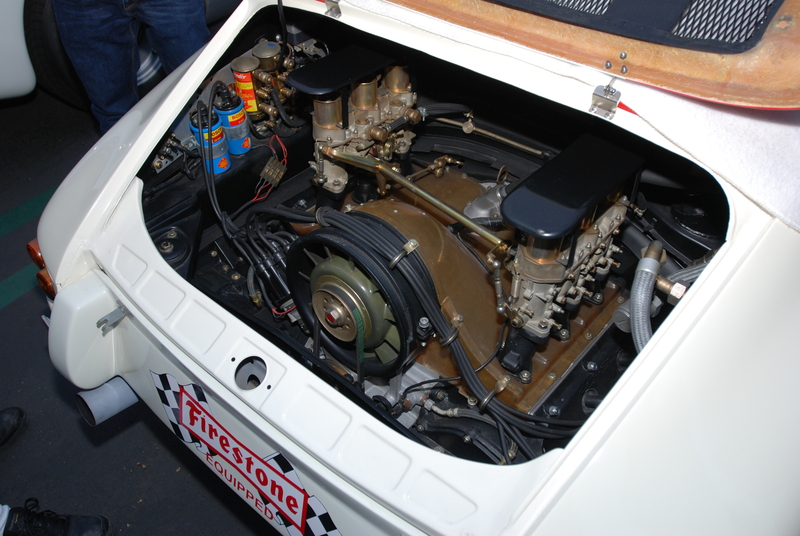 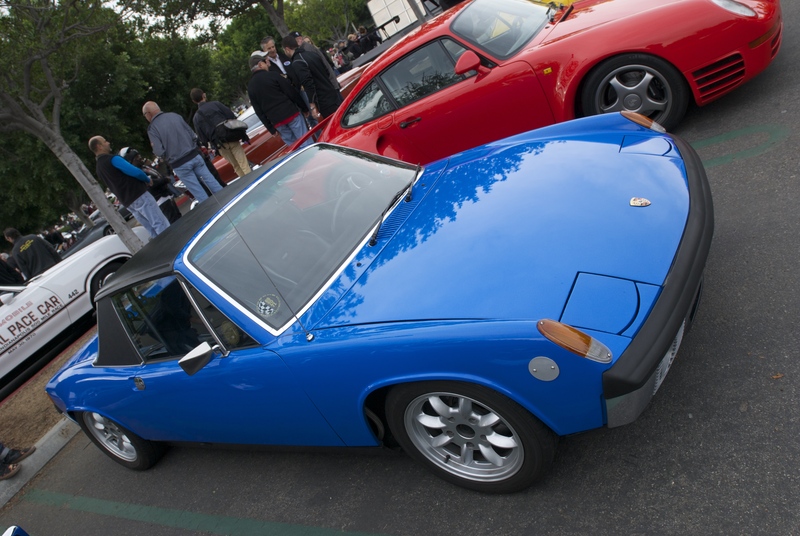 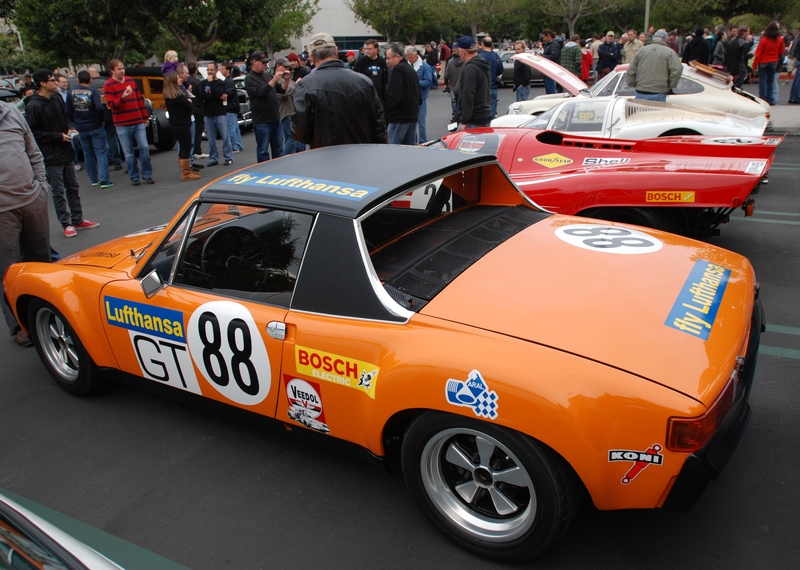 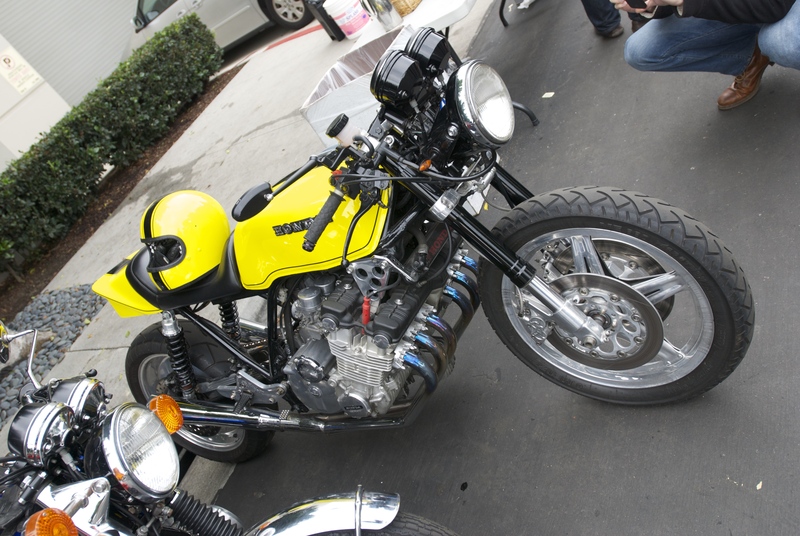 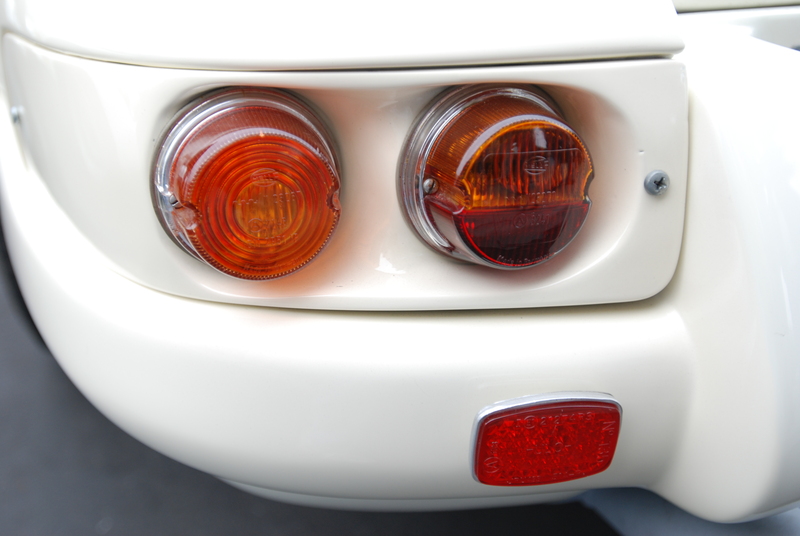 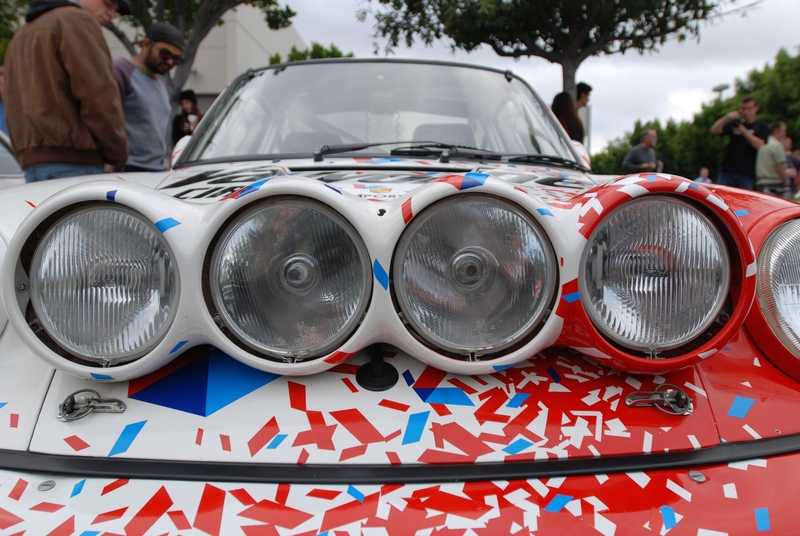 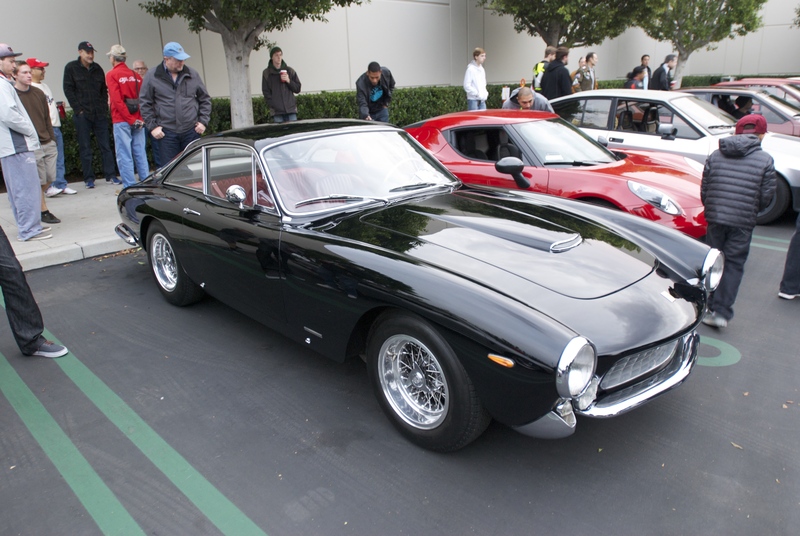 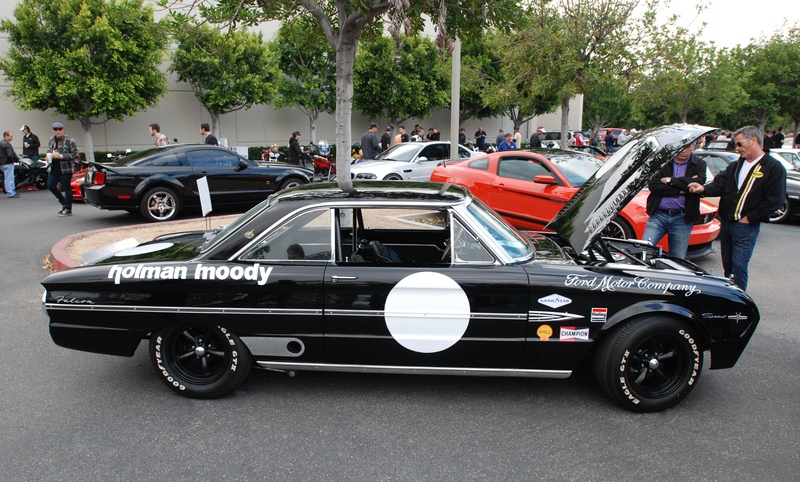 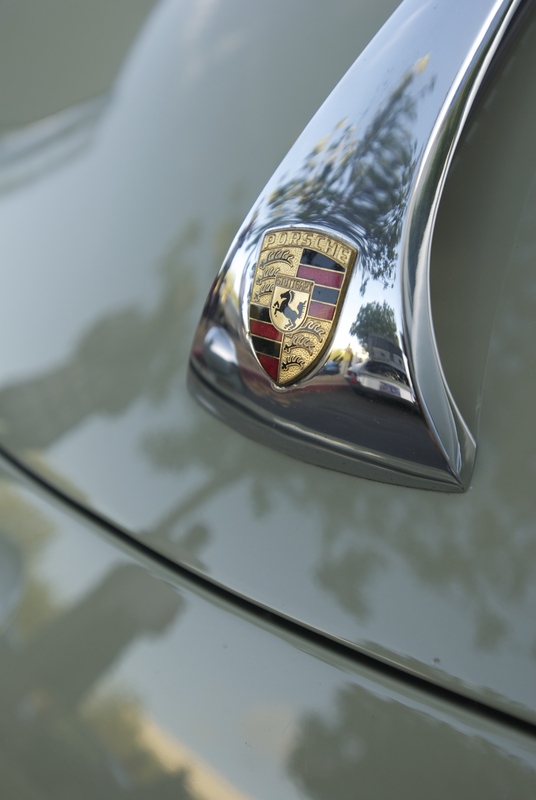 Celebrating the classics was an underlying theme recently at Cars&Coffee / Irvine. 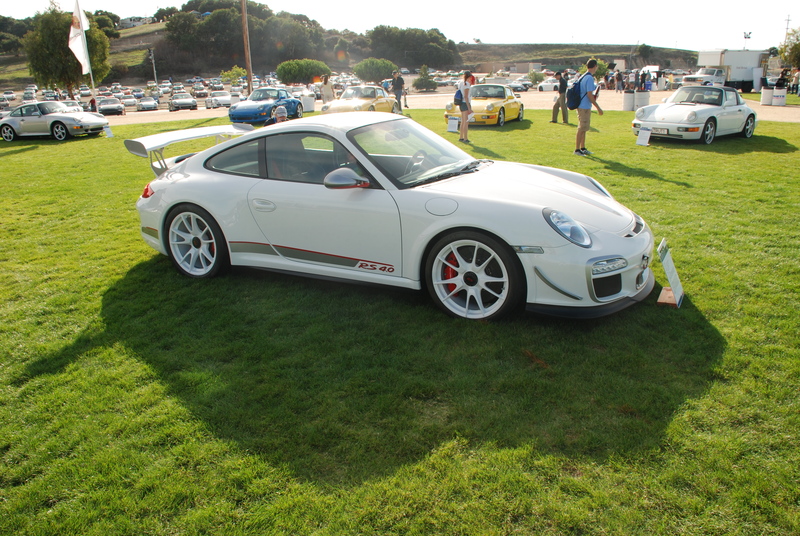 This fact became quite obvious as I pulled into Porsche row just behind the Type 964 / C4 Pikes Peak rally car seen below. 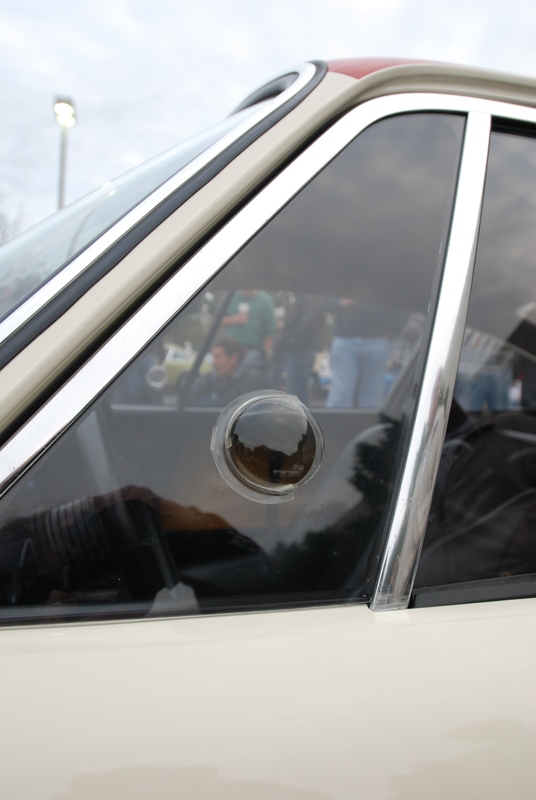 Driving and navigation duties were carried out by two young women, who just happened to be the daughters of the owner. 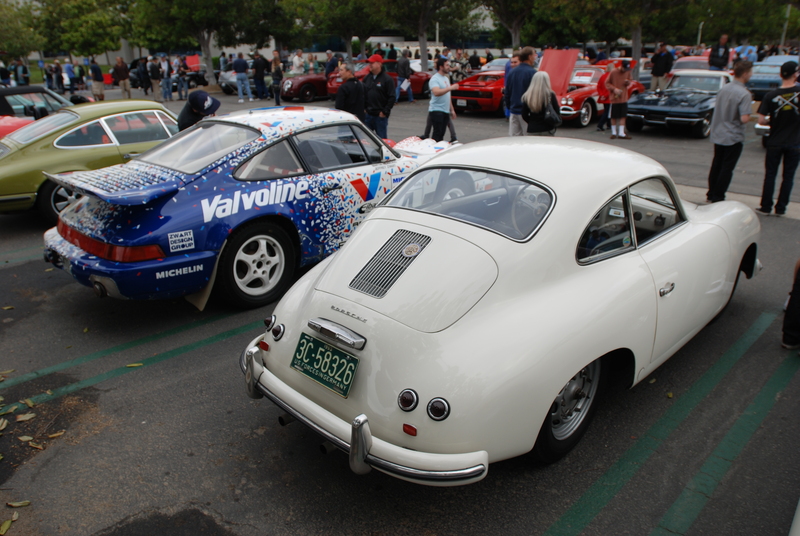 With a deft hand, the 964 was backed into its space, parked beside their father’s 1953 Porsche 356A coupe. 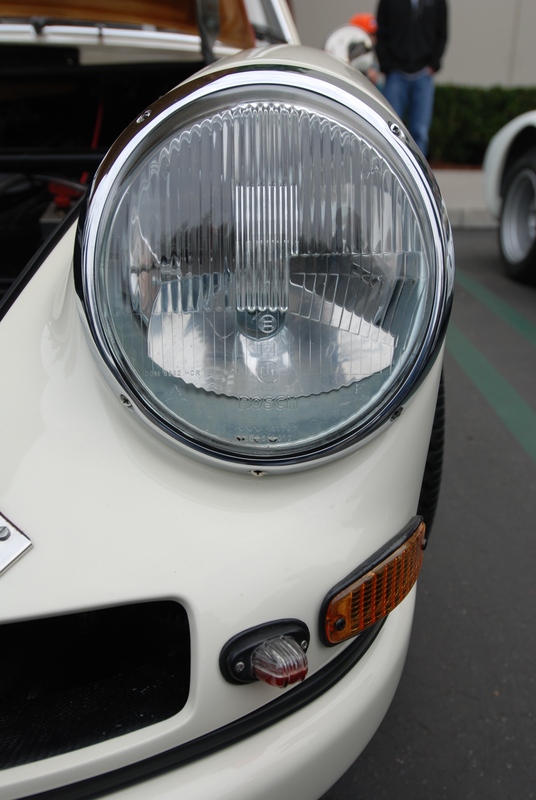 “If two lights are good, then four should be even better”. 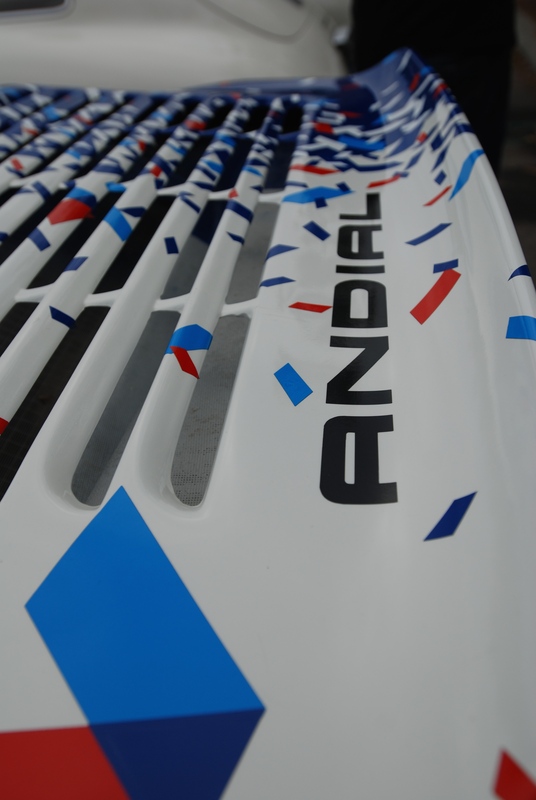 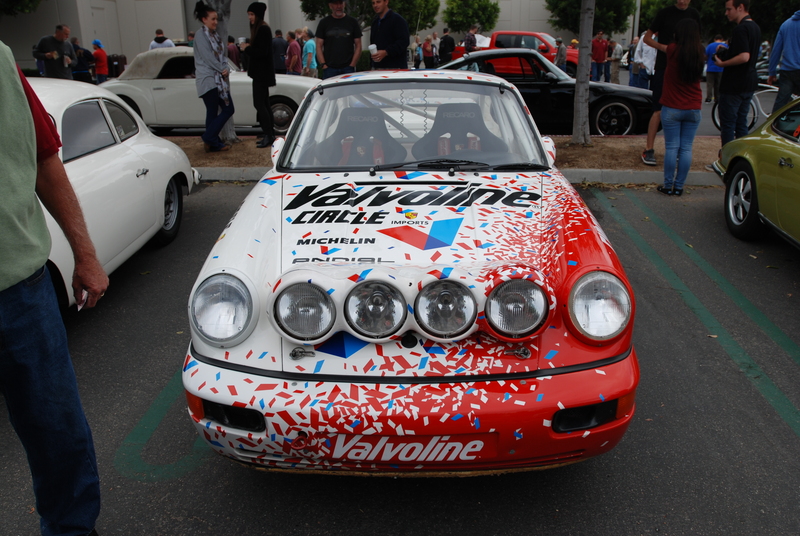 Rear whale tail, covered in Valvoline themed confetti and Andial graphics; a winning combination (below). 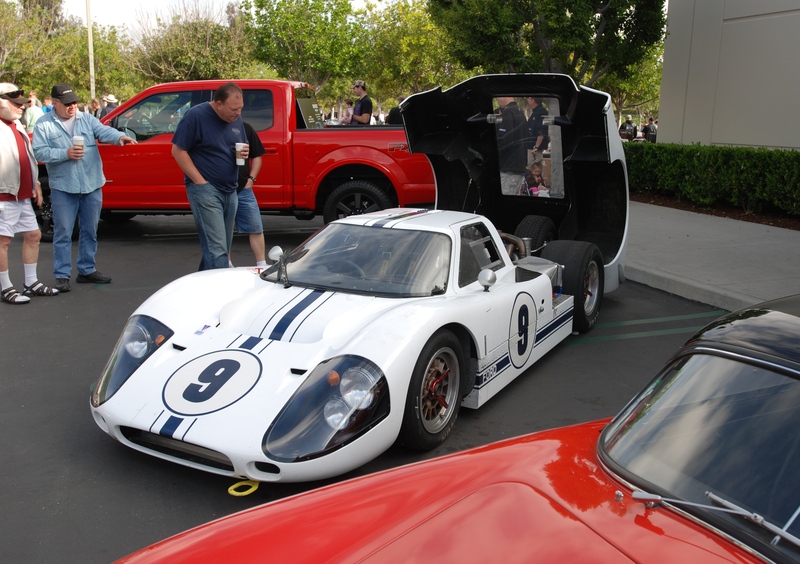 Continuing with the classics theme, was a 1960s vintage race car, making its presence known by the quickly gathering crowd as witnessed in the “featured parking lot”. 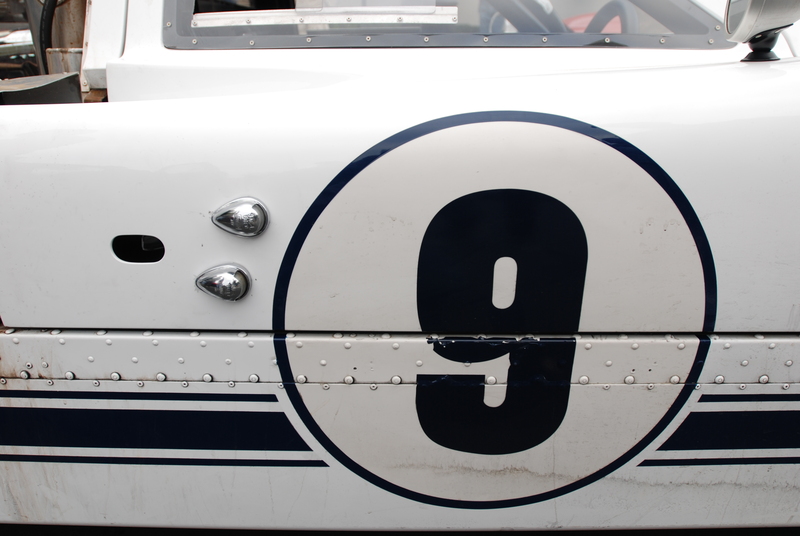 For anyone growing up during the 1960’s and who followed auto racing, it was obvious as to the identity of this low slung, white race car with black striping. 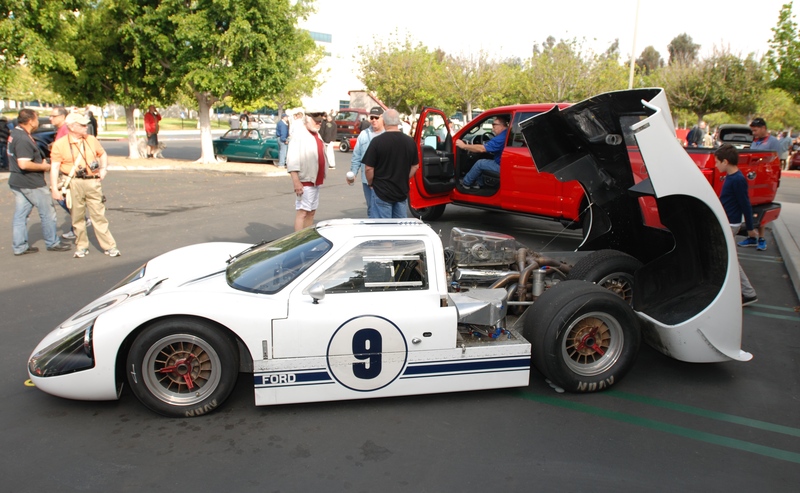 Hard to mistake this race car for anything but the iconic, American built factory backed race car that it is; a 1967 Ford GT MK IV. 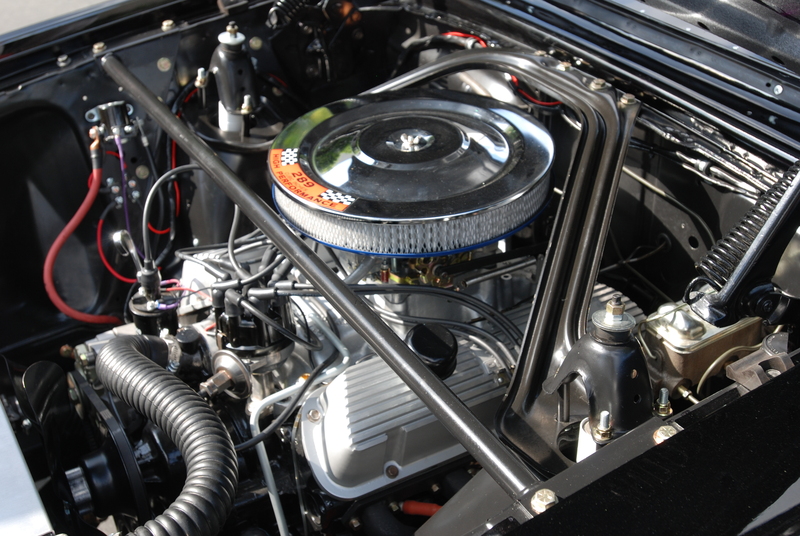 and out back, a close up view of another classic component; the premier Ford race motor of the 1960’s, the mighty 427. 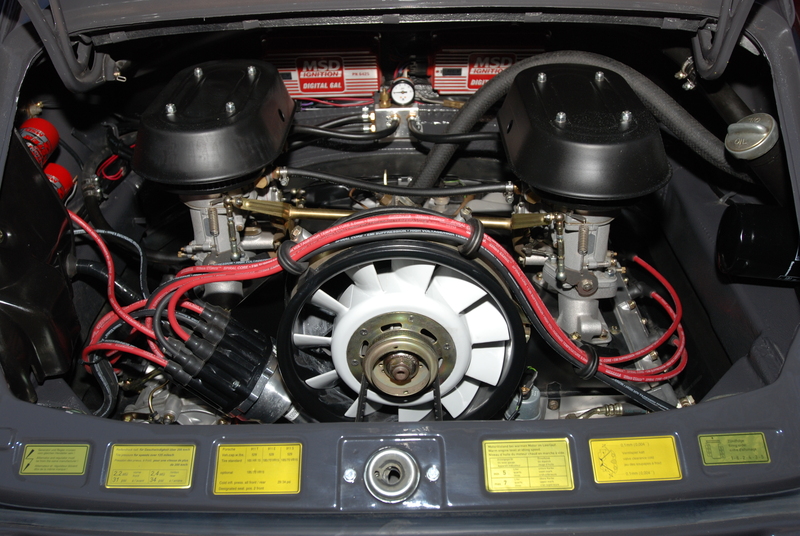 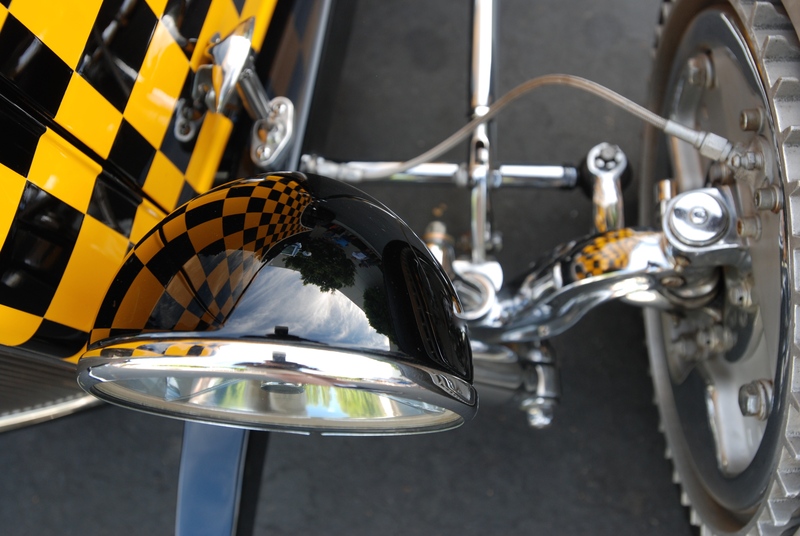 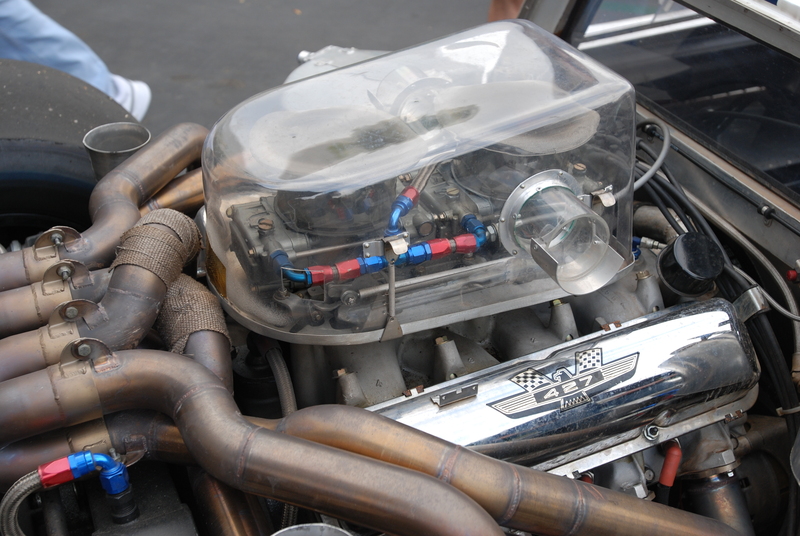 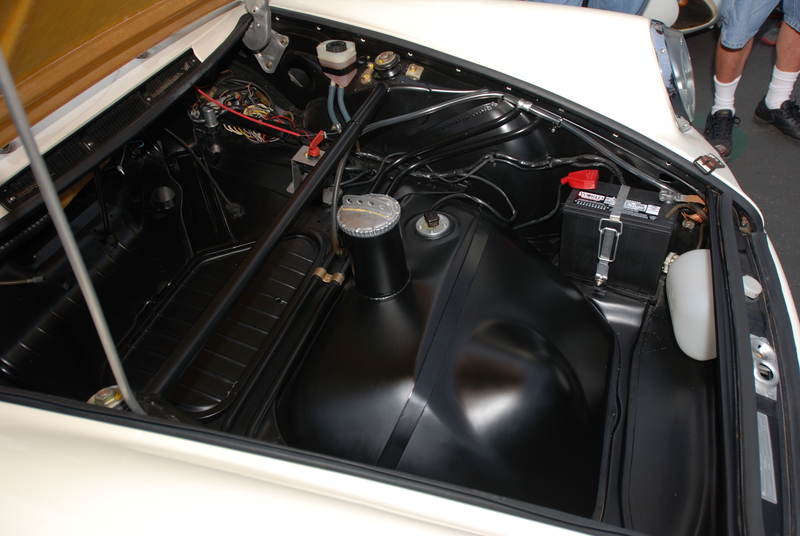 And as seen on this car, a motor with its dual carburetors housed within a clear polycarbonate chamber, allowing the motor to be force-fed fresh air by dual NACA air ducts, each located on the rear deck, atop the rear fenders. 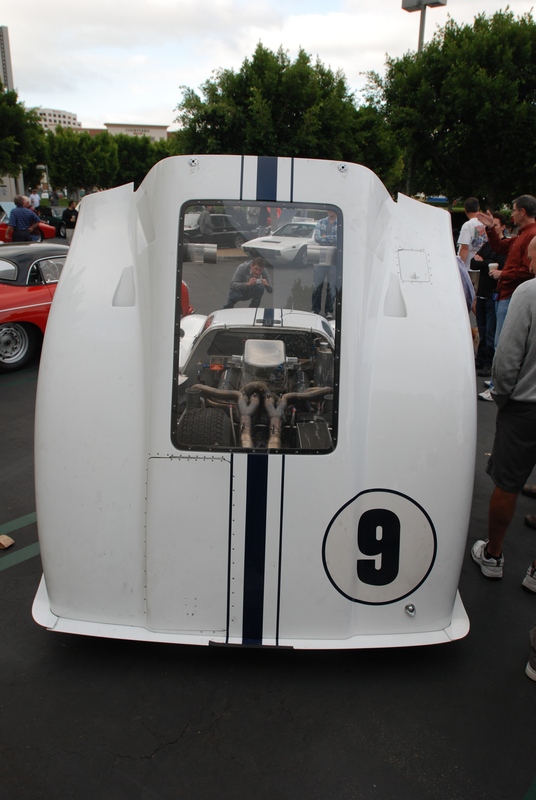 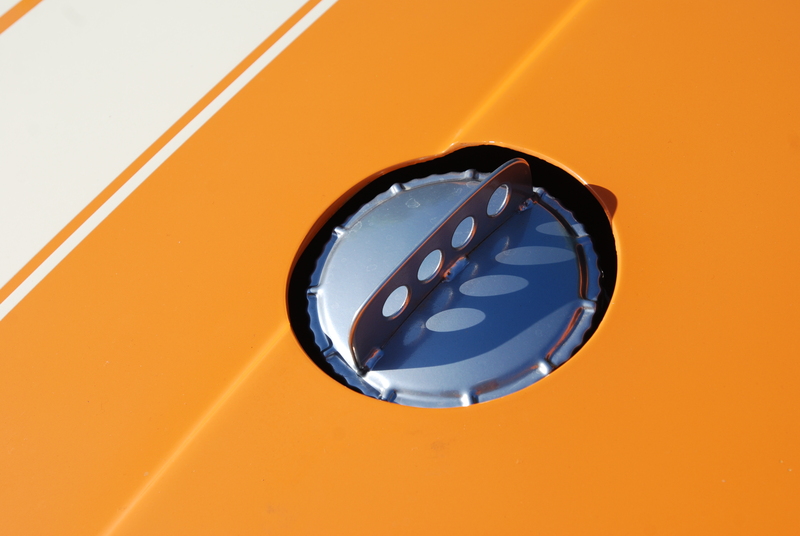 Visible through its rear window (below); the single, treaded “spare tire” and immediately to its right, the fabricated aluminum “luggage box”. 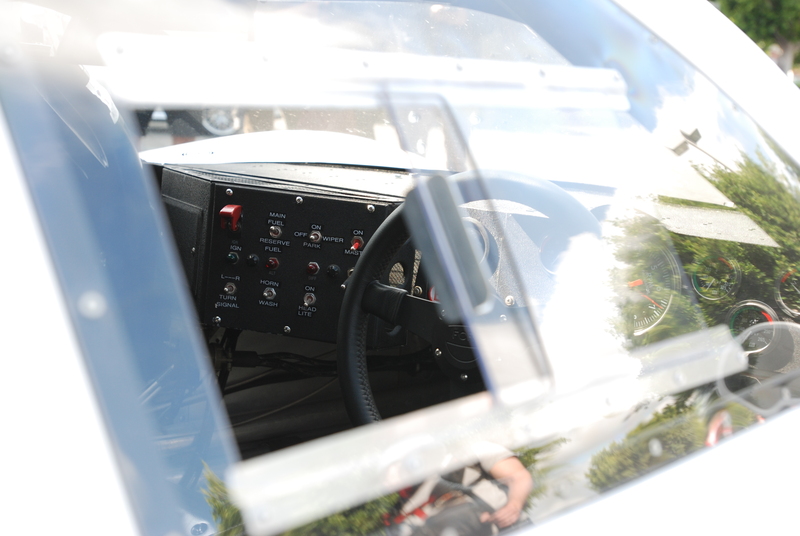 A requirement mandated for all competitors in the Prototype Endurance class, per F.I.A. 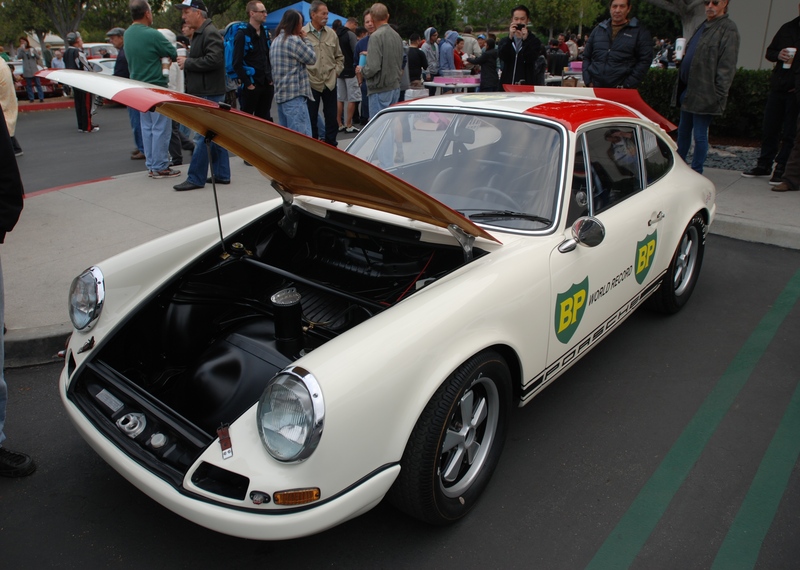 competition regulations that remained in effect into the 1970’s. 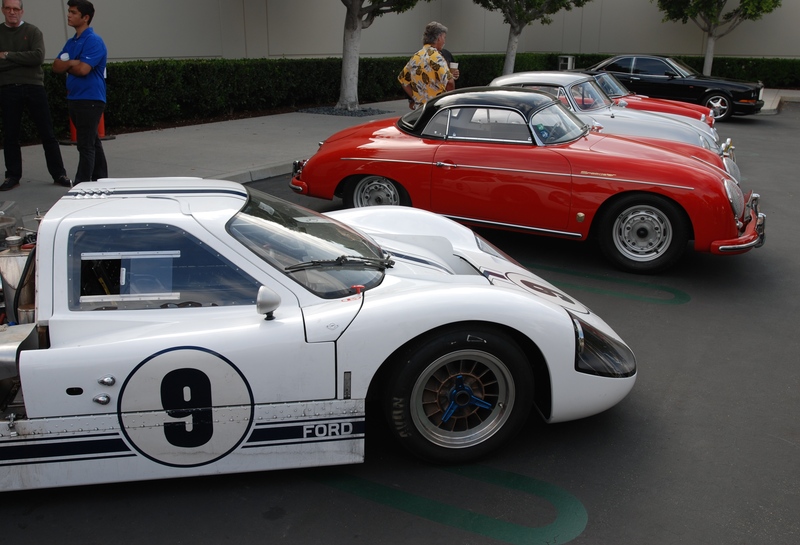 Sharing space; the 1967 Ford GT Mk IV and its neighbor, the red Porsche 356A Speedster. 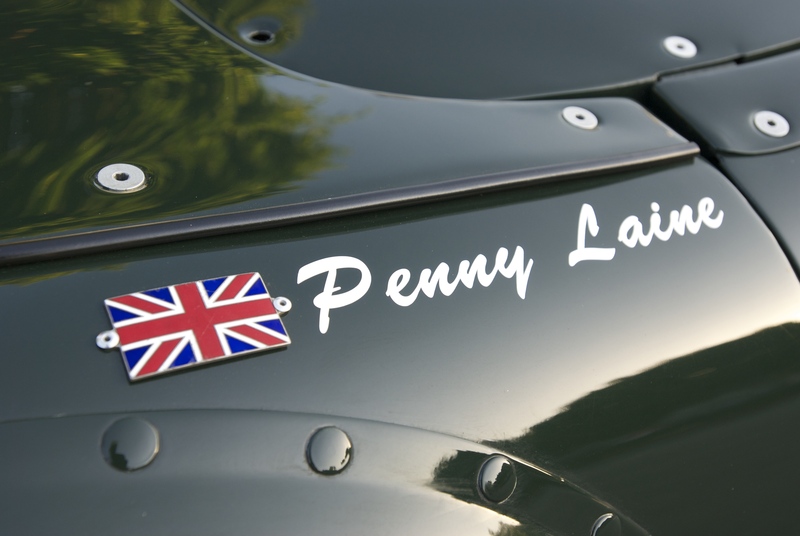 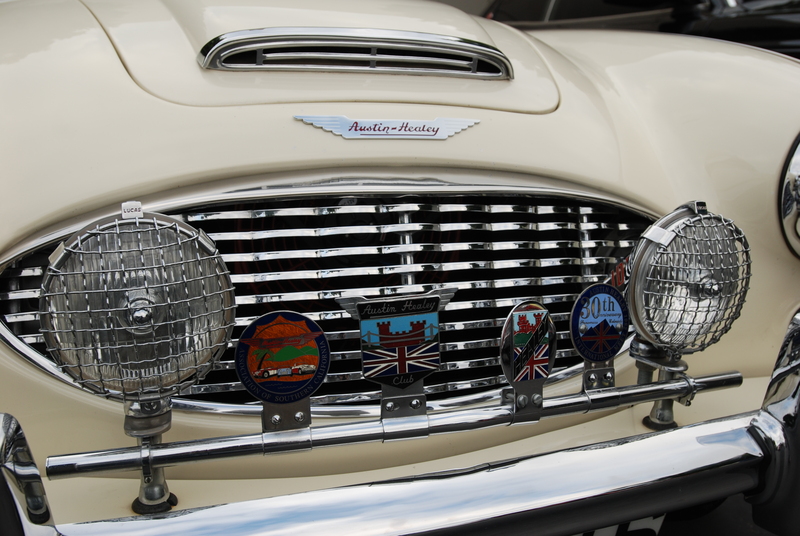 Further down the row, awaiting discovery by fans of english sports cars, was this beautifully restored Austin Healey 100, adorned by an assortment of rally badging, and flanked by a pair of driving lights complete with stone guards. 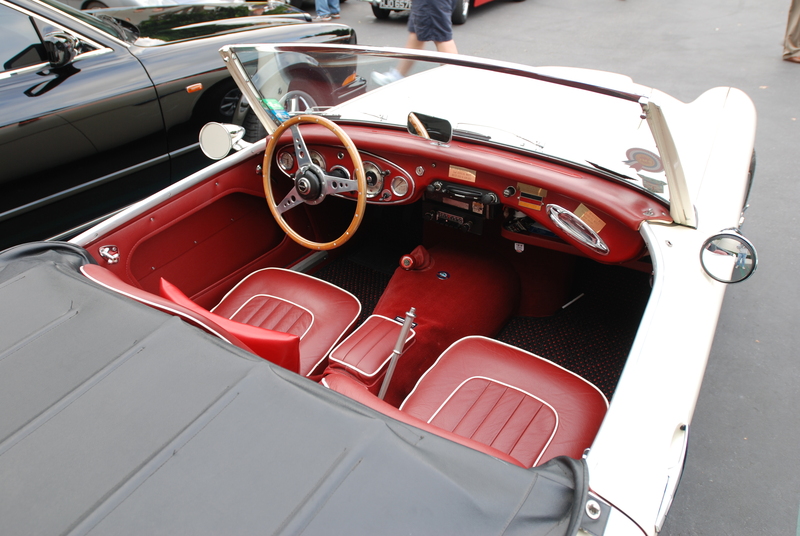 The Healey’s highly detailed interior. 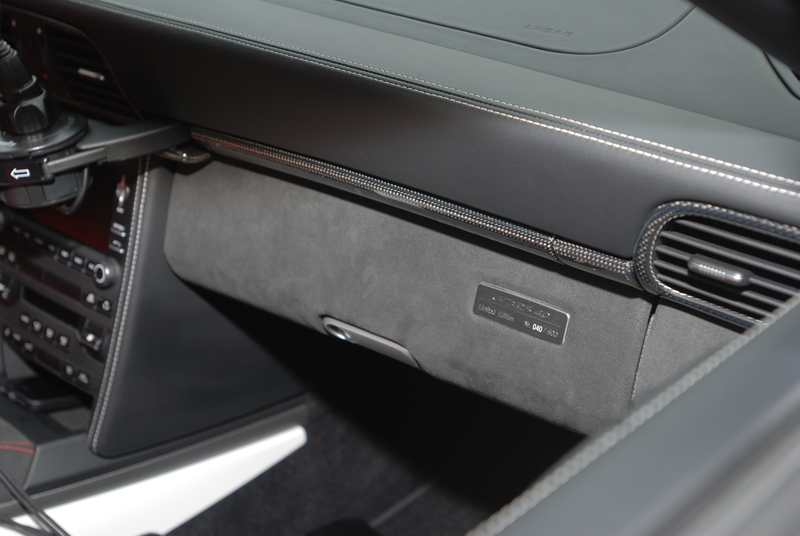 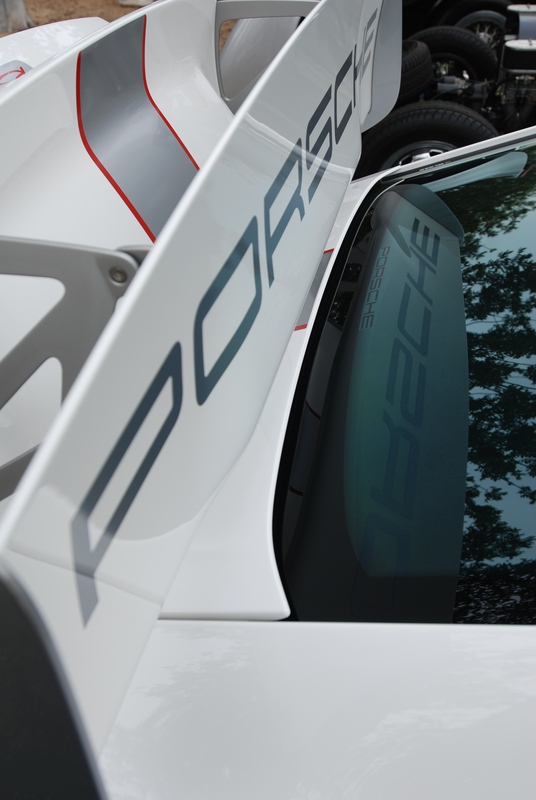 Equal in quality and attention to detail, on par with its exterior. 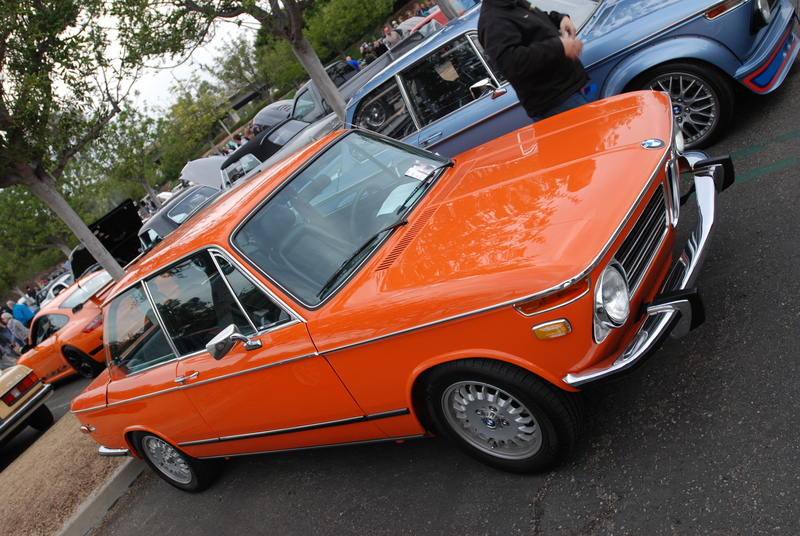 Another European classic encountered, parked amid a cluster of BMW’s. 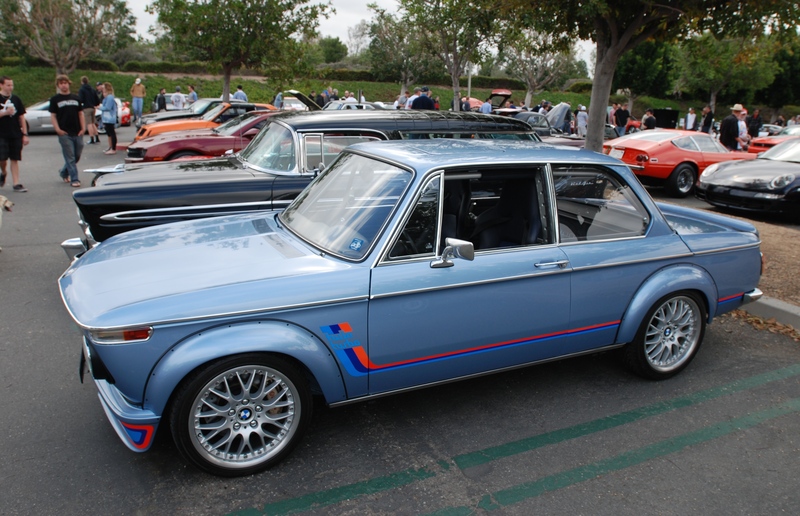 A spectacular, highly modified example of a mid 1970s vintage BMW 2002. 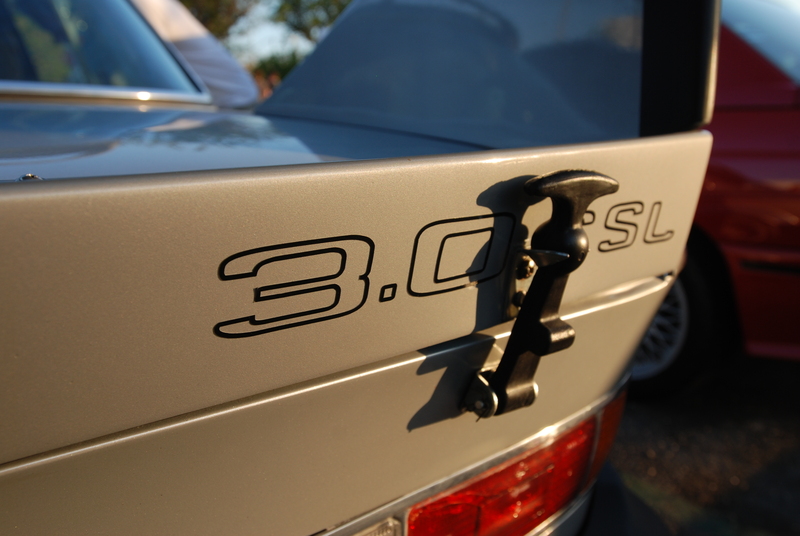 And as the fender graphics proclaim, a twin turbo, updated to the owners specifications, with a hint to its true potential revealed by the rear badging; “3002 ttii / twin turbo”. 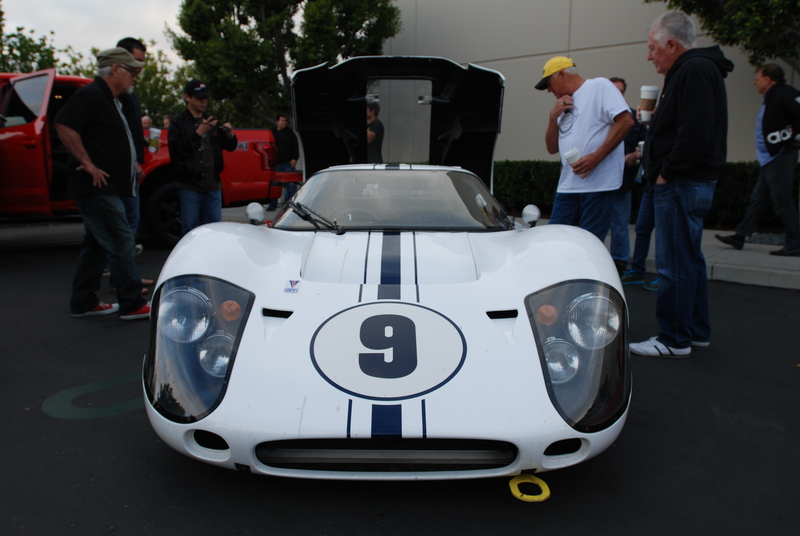 Another classic Ford present on this morning, and making what I believe to be its debut at cars&coffee. 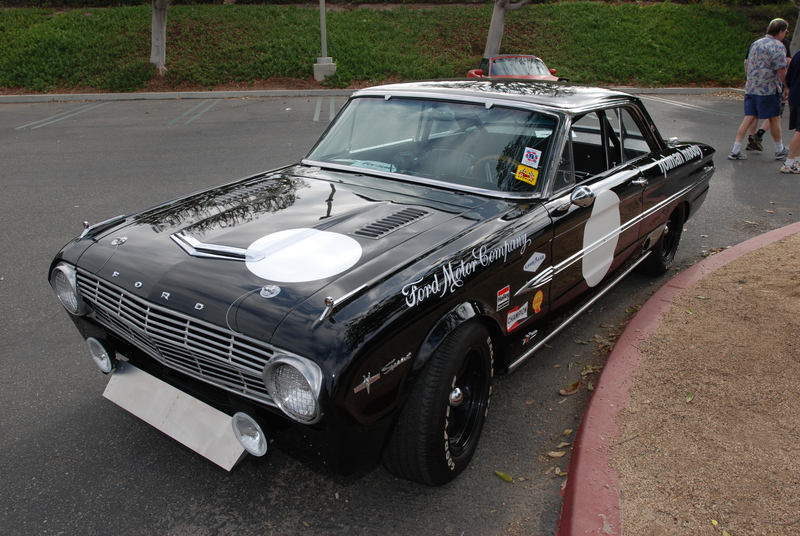 As seen below, a 1963 Ford Falcon Sprint, built by the firm VinRacer, as their interpretation of a period correct “Trans Am Racer”. 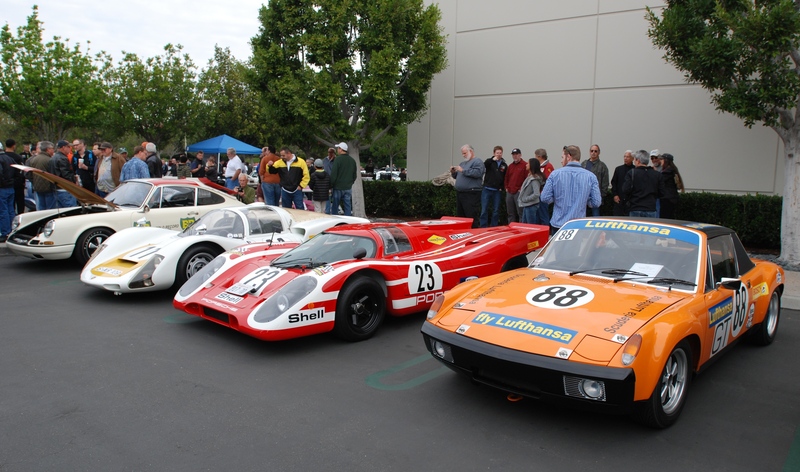 Vin Racer describes themselves as creators of “vintage speed”, dedicated to the building of high performance, pre-1969 vehicles specific to a client’s desires. 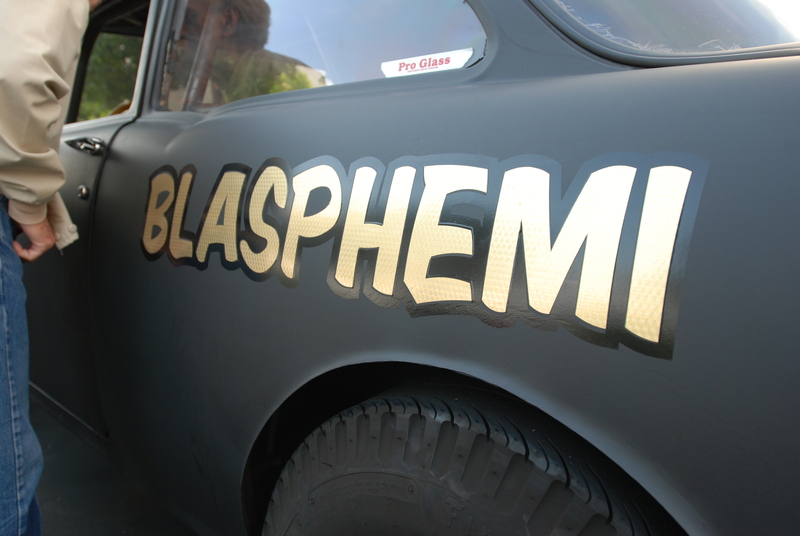 For anyone interested, please use the link above to check out their website for a full description of their services. 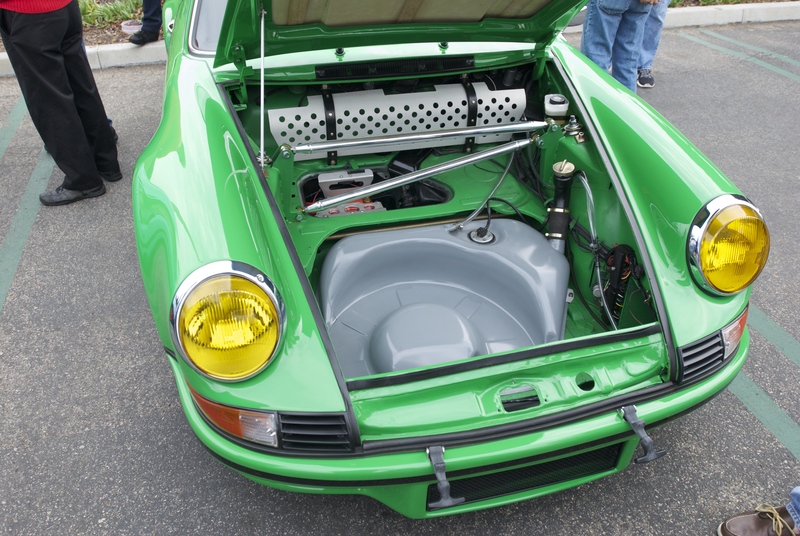 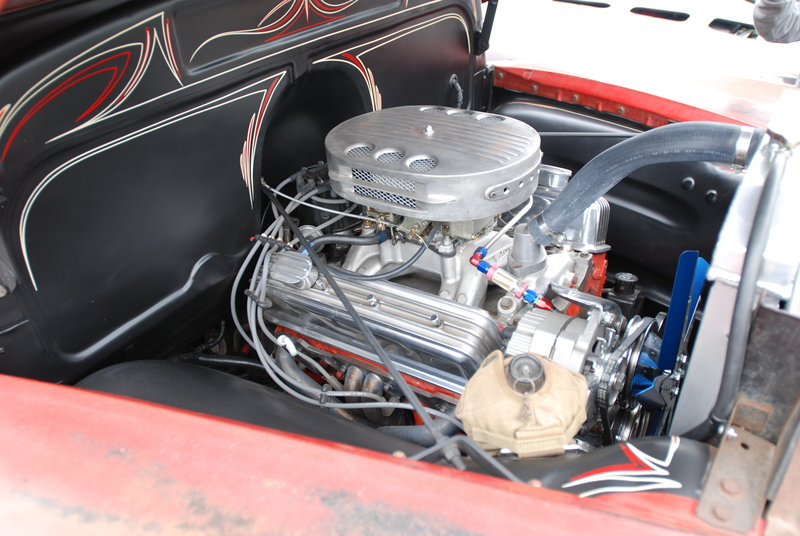 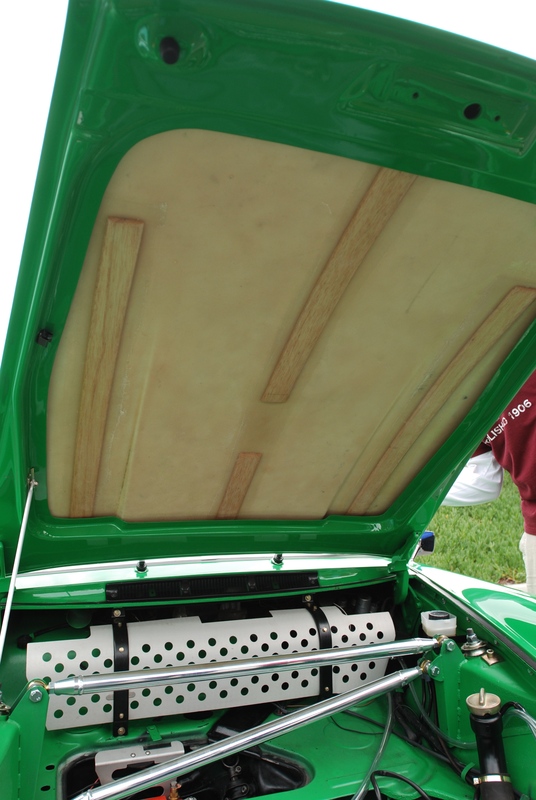 Even the engine compartment was as impressive as the exterior. 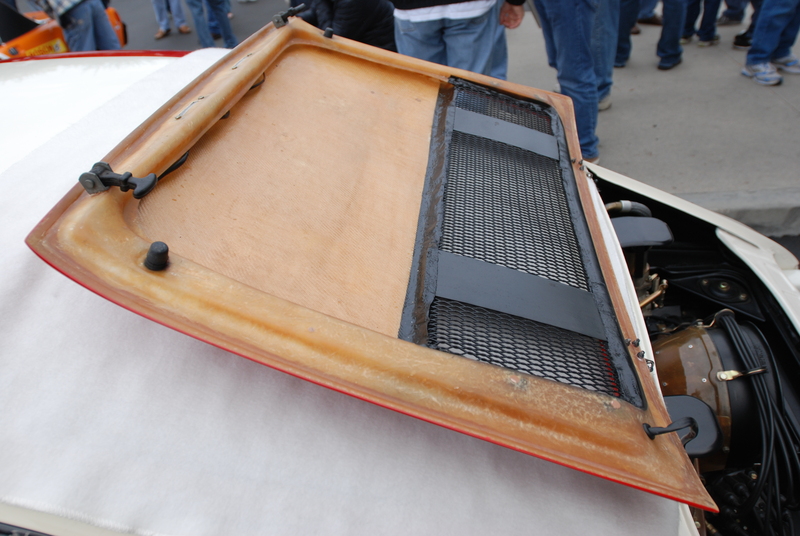 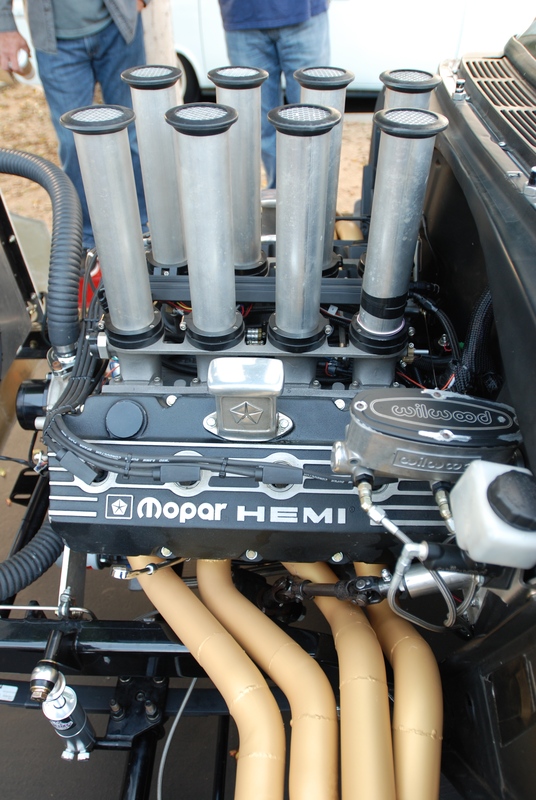 Hidden beneath the louvered hood and braced within its spartan engine compartment, was home to the impressive, HI-PO 289 cubic inch motor, good for a reported 300 horsepower. 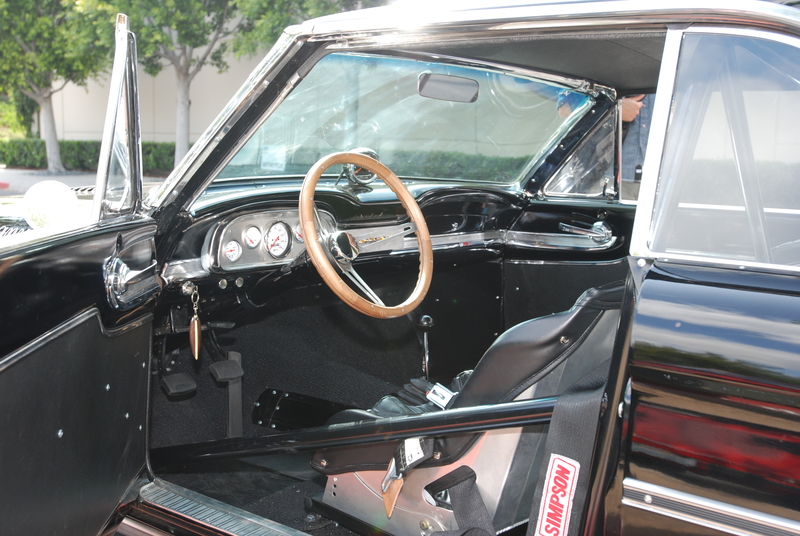 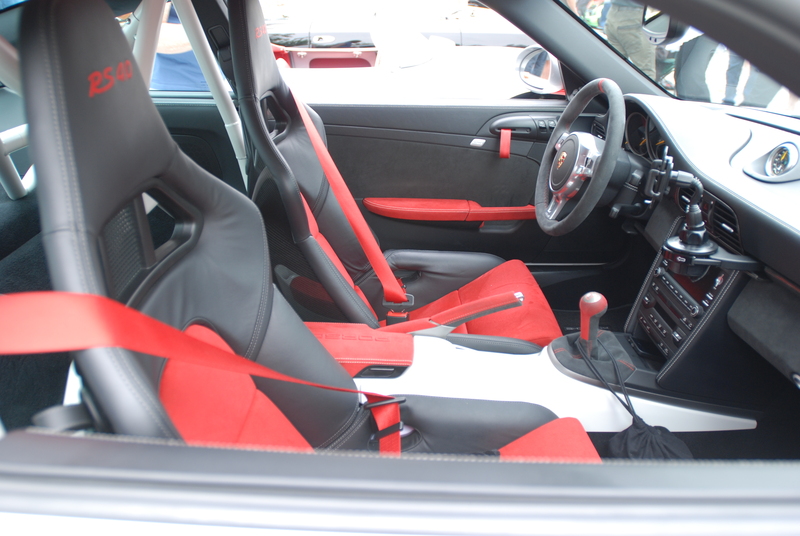 The competition inspired interior, complete with dual racing bucket seats, Hurst 4 speed shifter, Simpson harnesses and roll cage. 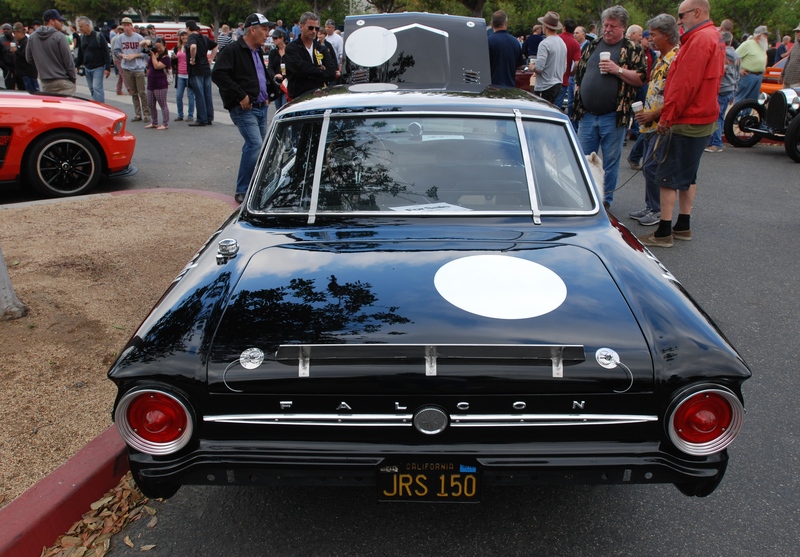 One of the last cars to leave the event that morning, yet still fielding questions from visitors interested in the Falcon. 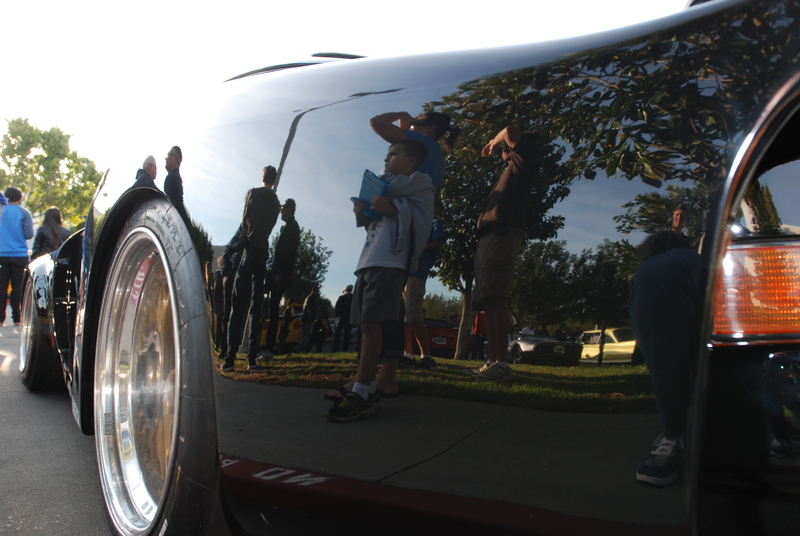 Another example of why attending this show on a weekly basis is so rewarding. 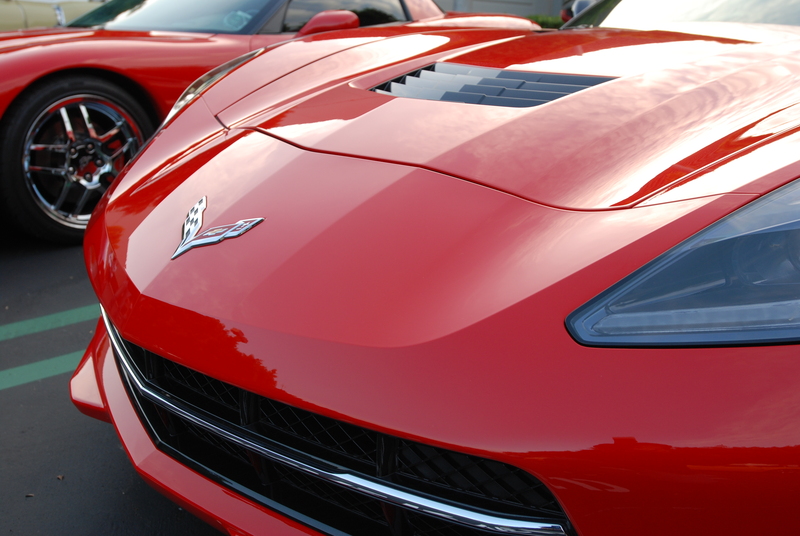 Surprises abound, and regardless of your favorite make or model, you’re assured of finding a vehicle to capture your interests. 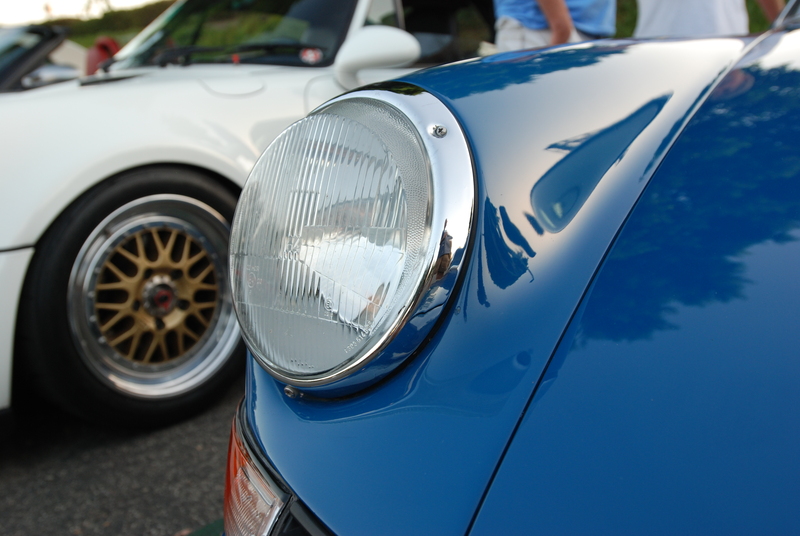 “Sky Blue and Black”; An unexpected visit by #00, Interscope Racings 1978 Porsche 935. 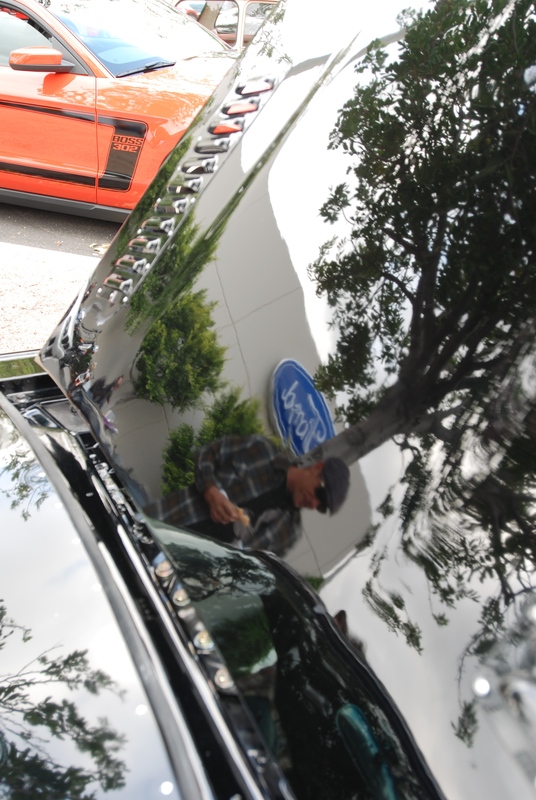 And what a surprise it was. 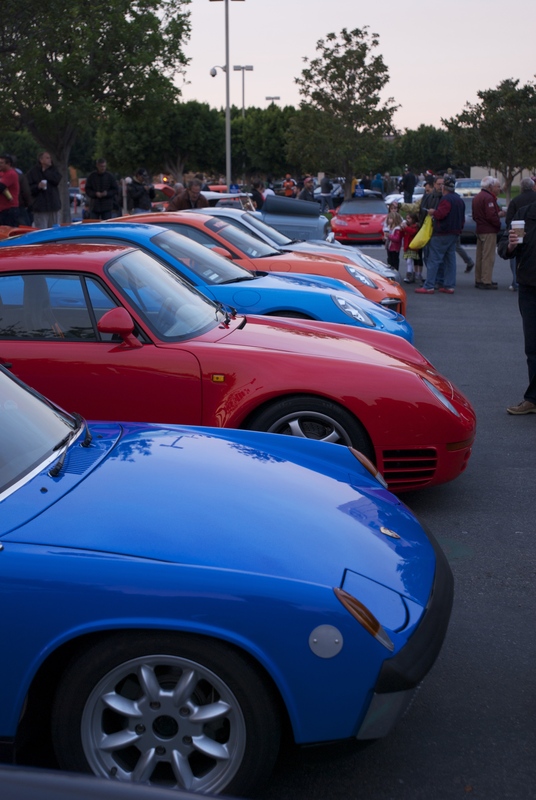 As the sun began to rise, word spread quickly that someone brought a Porsche 935 to the event, and now it was parked near the entrance to the overflow lot. 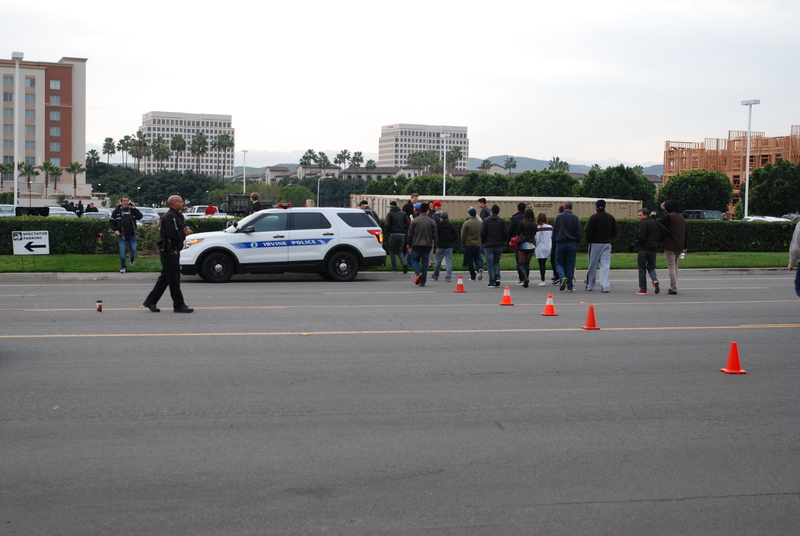 It became obvious as to the car’s location, judging by the gathered crowd. 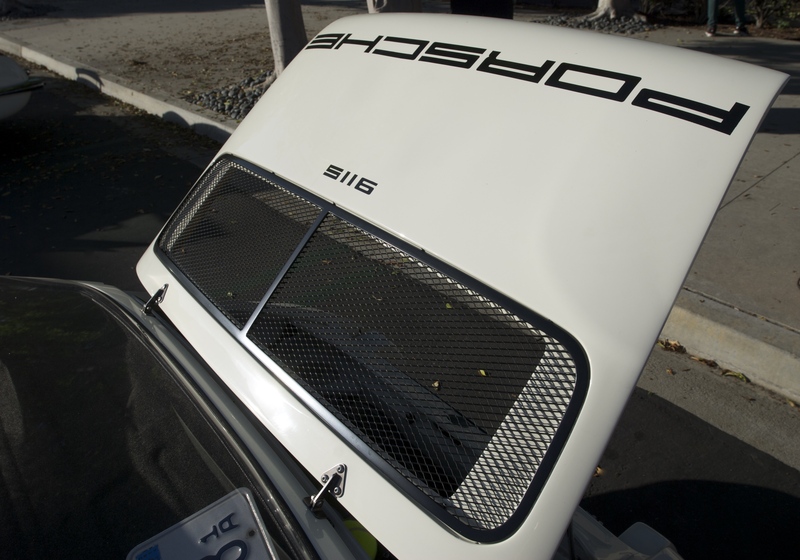 Being a big fan of Porsche 935s, I was eager to check out the mystery Porsche. 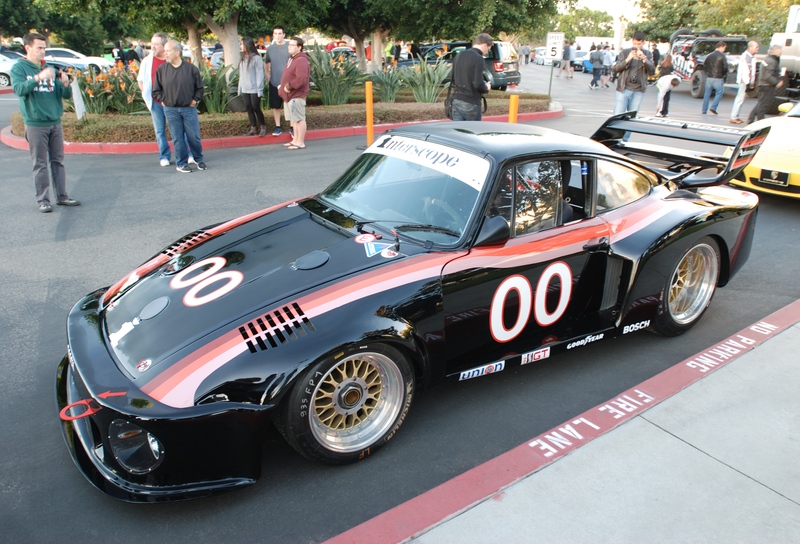 As I approached, I immediately recognized this particular 935, having chased it through the viewfinder of my camera at IMSA races throughout the late 1970s and into the 80s. 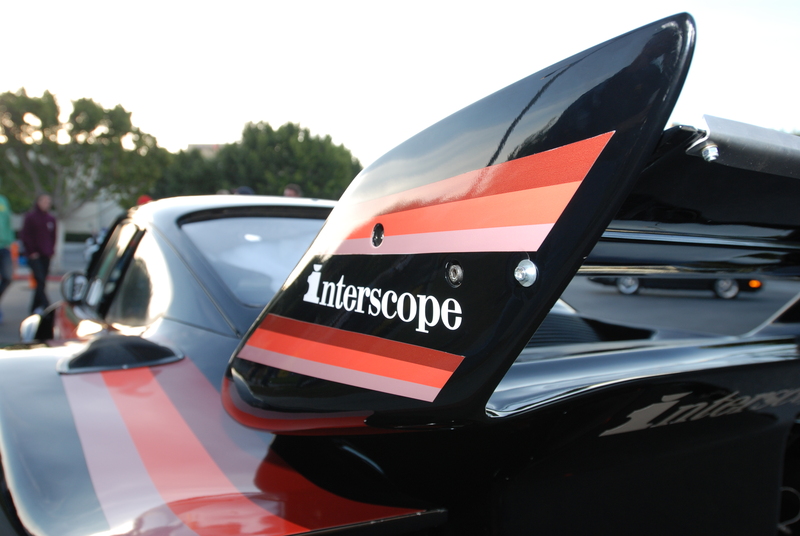 Interscope Racing… Southern California’s own and Newport Beach, California-based race team, which successfully fielded a pair of Porsche 935s from 1977 to 1982. 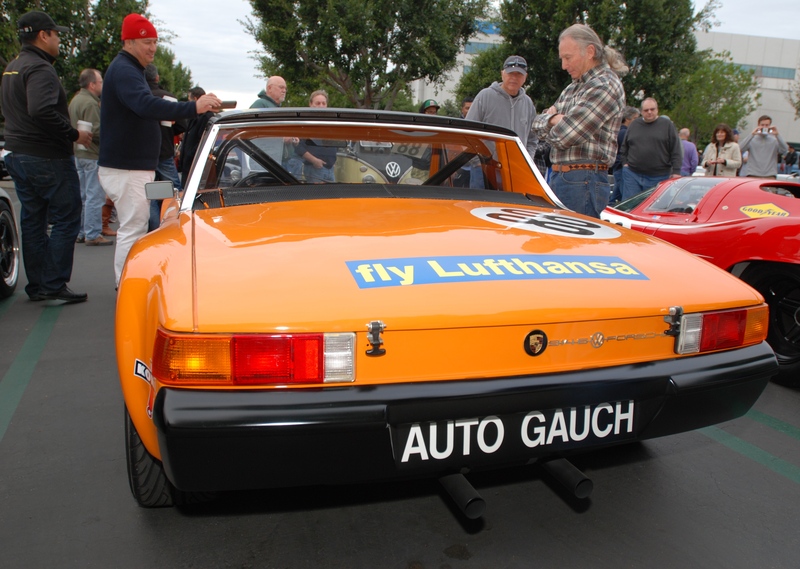 The two car team consisted of car #0, piloted by team owner Ted Field, with the second car (#00) driven by teammate Danny Ongais. 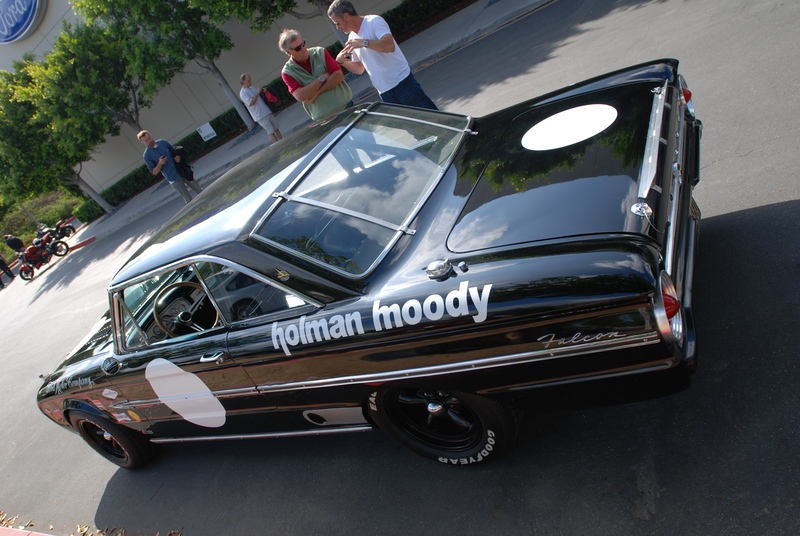 Danny “On the gas” Ongais was no stranger to motorsports, having started out in the NHRA, driving top fuel dragsters in the mid 1960s. 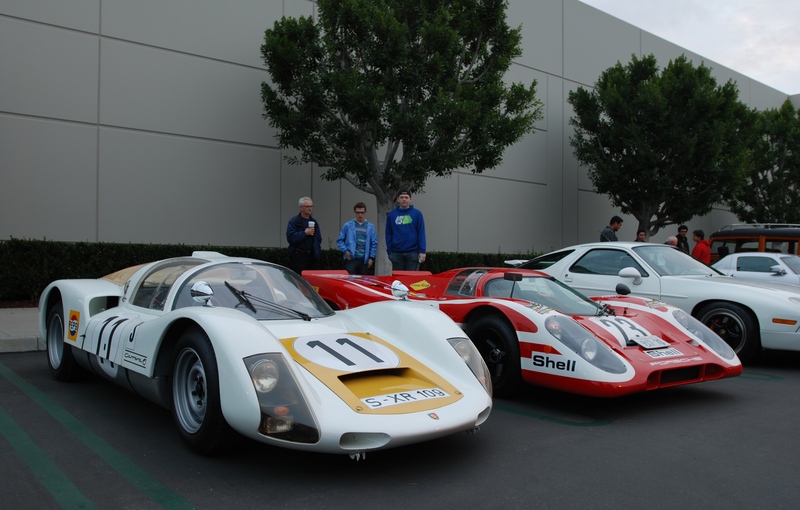 From there he graduated to racing Indy cars, and then in 1977 began racing Porsches with and for Ted Field. 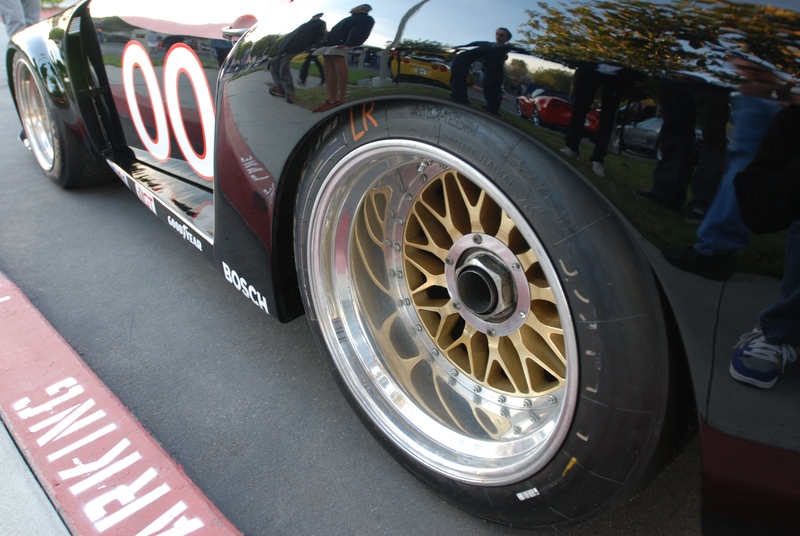 The Porsche 935 seen below was raced by Danny Ongais in 1978 in the IMSA series as part of the Interscope team. 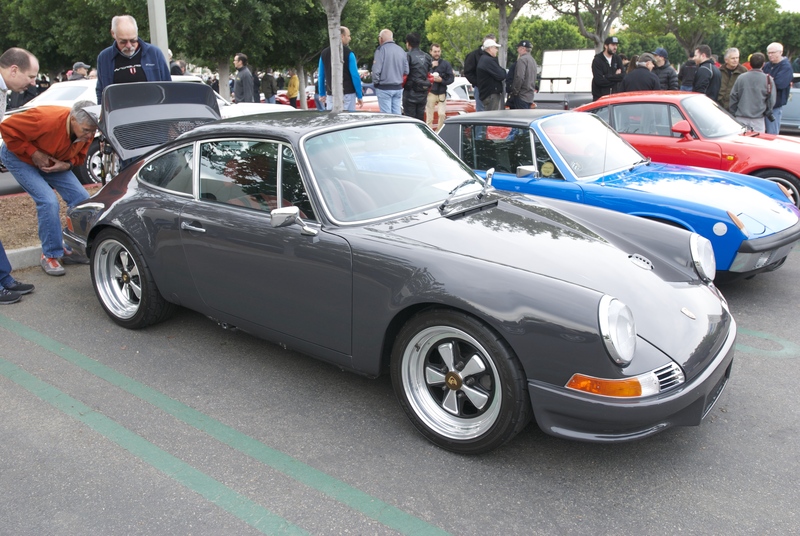 It is currently owned by one of the partners at TruSpeed, a local Costa Mesa, CA based Motorsports company, and here it was, making its debut at cars&coffee, showcasing its recent restoration. 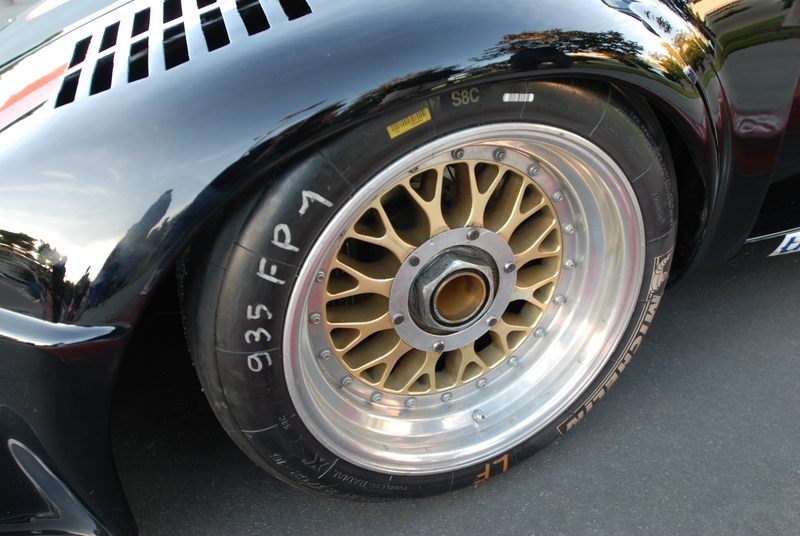 Standard issue on the Porsche 935; Gold, three piece modular center lock BBS race wheels, in this case shod with present day Michelin race rubber (Goodyear tires having been the dominate brand raced back in 1978). 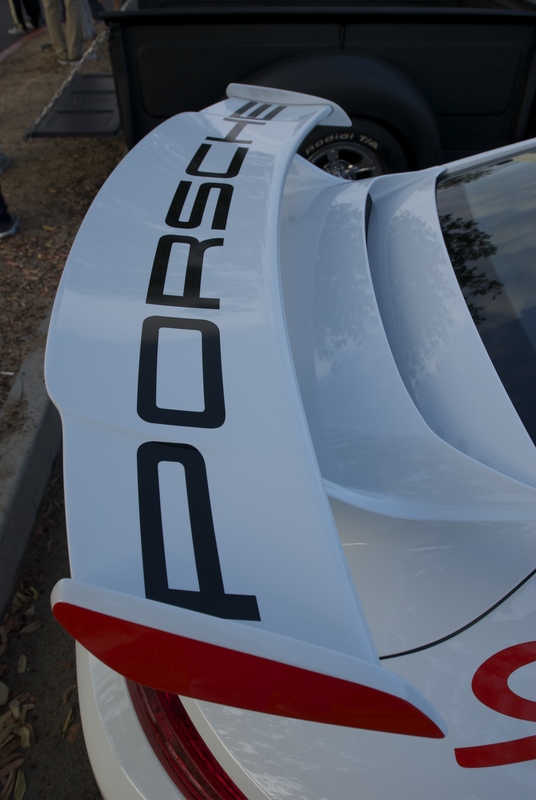 In talking with the staff from TruSpeed, I learned that the car had spent time the previous week being put through its paces at the Chuckwalla Valley Raceway, in Desert Center, California. 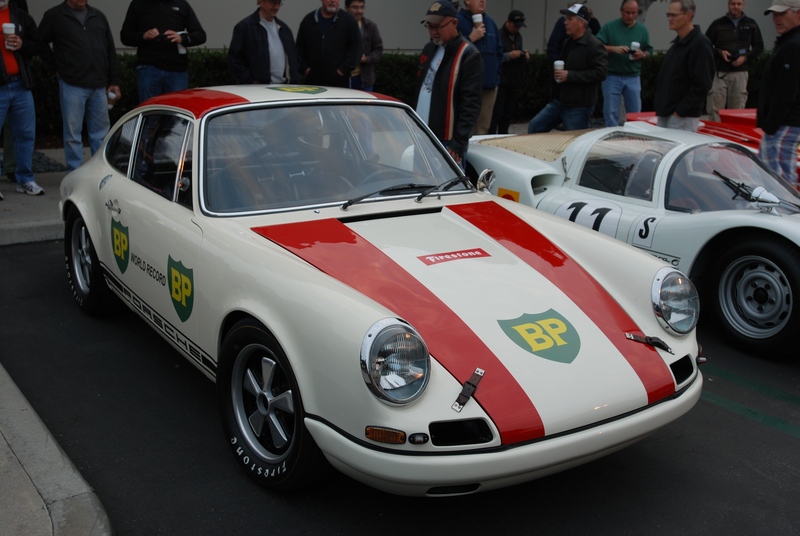 Present for this shakedown, and handling tuning duties, was none other than Dieter Inzenhofer, one of the three founding partners of Andial, which became the premier race shop for building winning 935 motors for the IMSA series through the 1970s and 1980s. 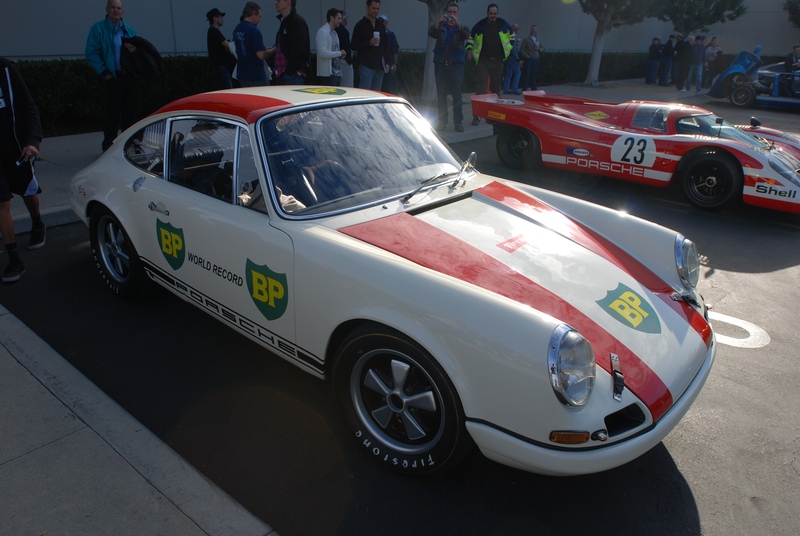 All of this work was in preparation for a trip to Sebring, Florida, to compete in an upcoming historic / vintage car race scheduled to take place in early March. 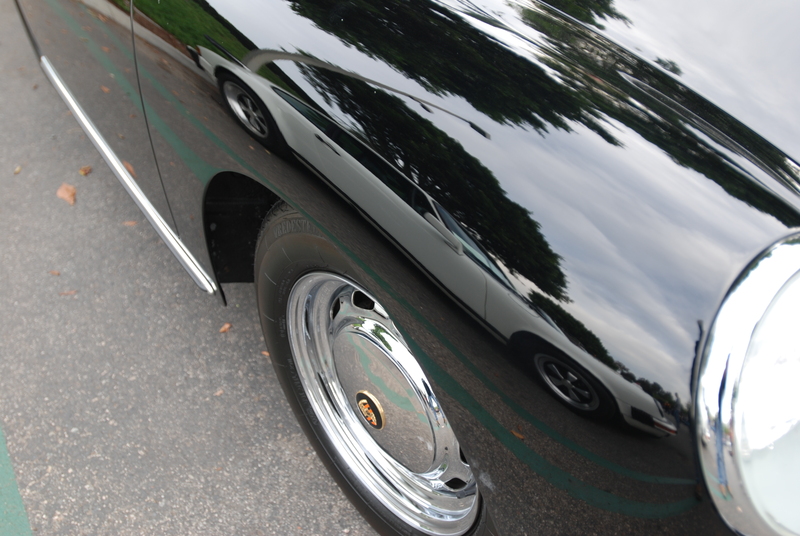 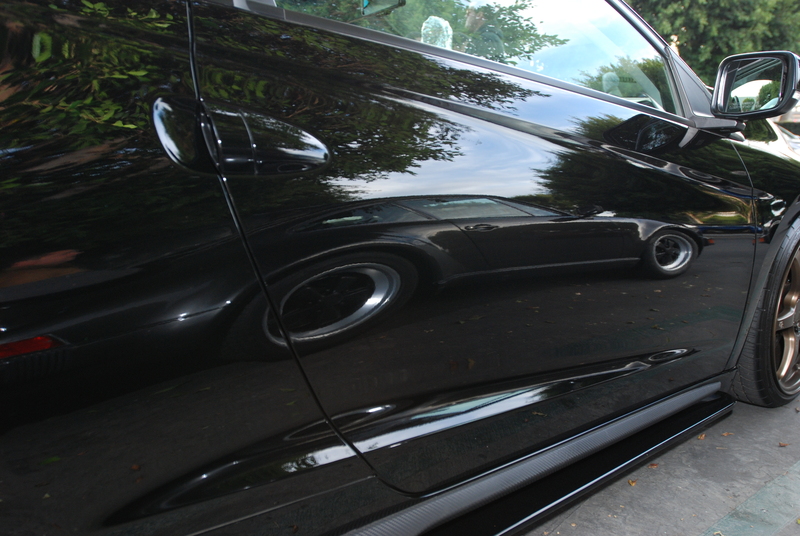 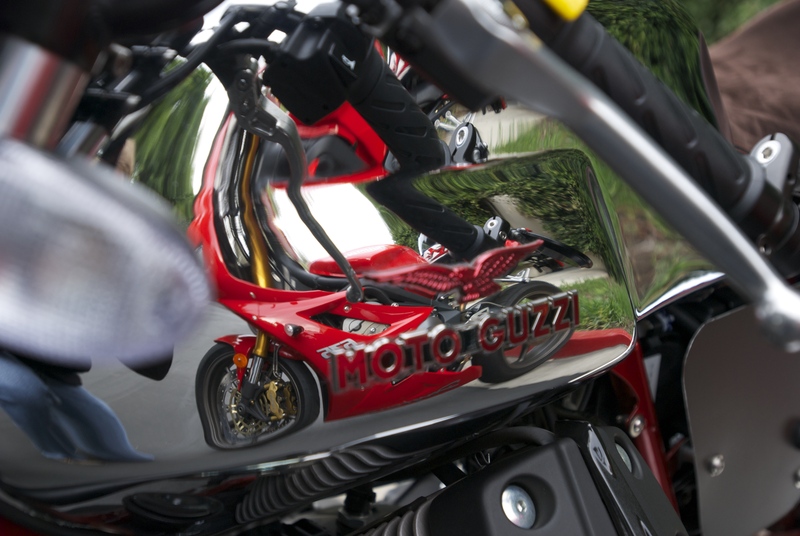 Flawless, concours quality paint finish, perfect for reflecting one’s surroundings. 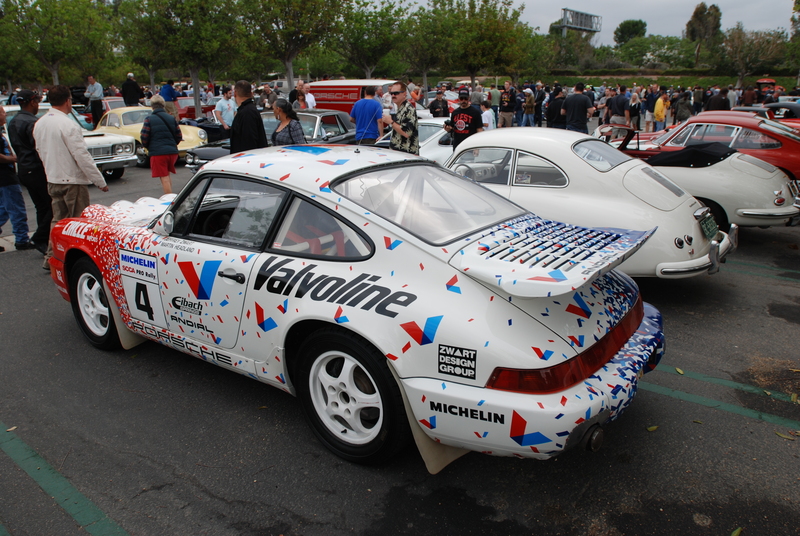 Bi- level, Porsche 935 specific rear wing and fender, complete with trademark Interscope tri-colored graphic striping. 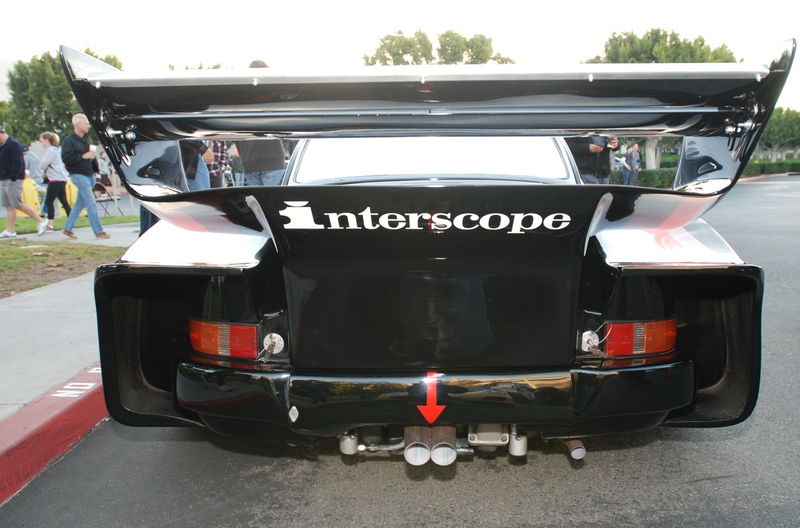 (Below) A view familiar to its many competitors back in the day; the full width, rear wing complete with Interscope graphics, massive Porsche 935 rear fenders, and centrally located, dual exhaust and peripheral waste-gates. 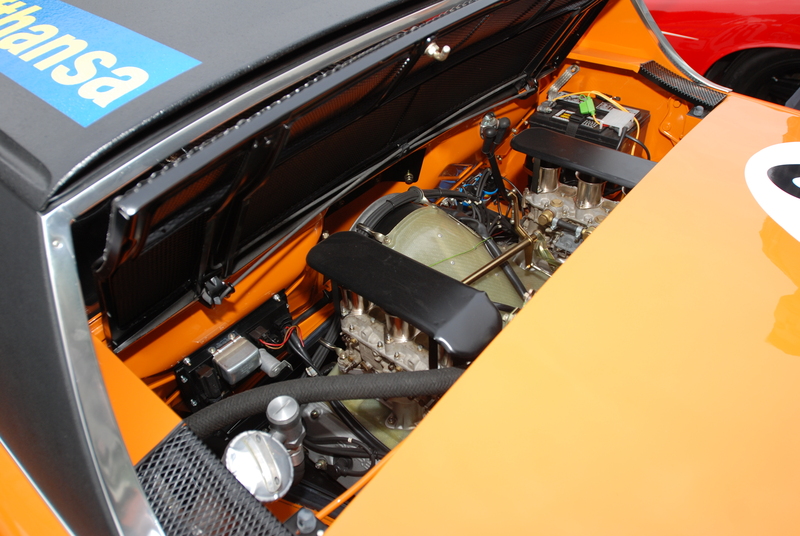 A bugs-eye view of the twin turbo set-up, with centrally located, converging dual exhaust and the laterally positioned, dual boost wastegates. 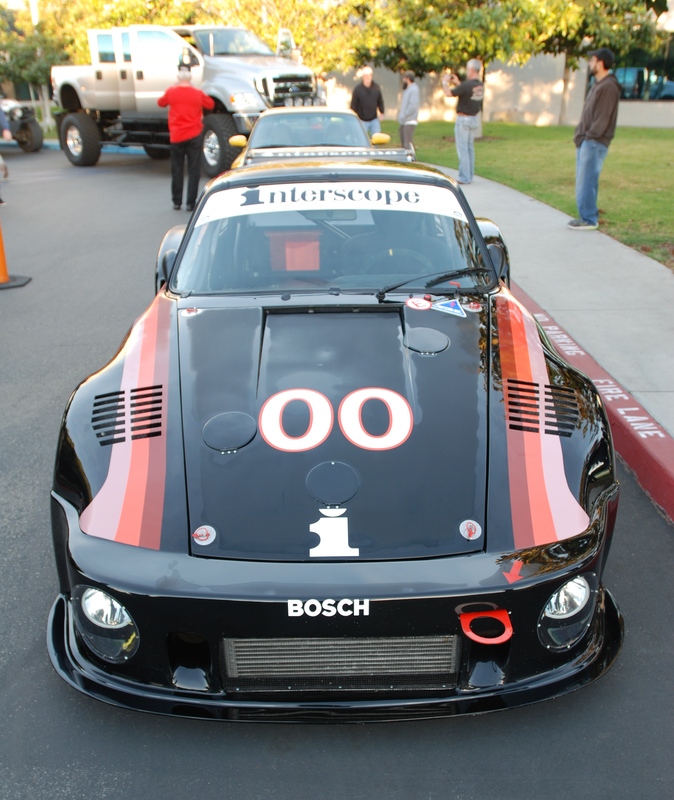 The classic silhouette of the Porsche 935, and the iconic tri -colored striping of Interscope #00, restored and ready to once again compete with its rivals within the ranks of the Historic racing community. 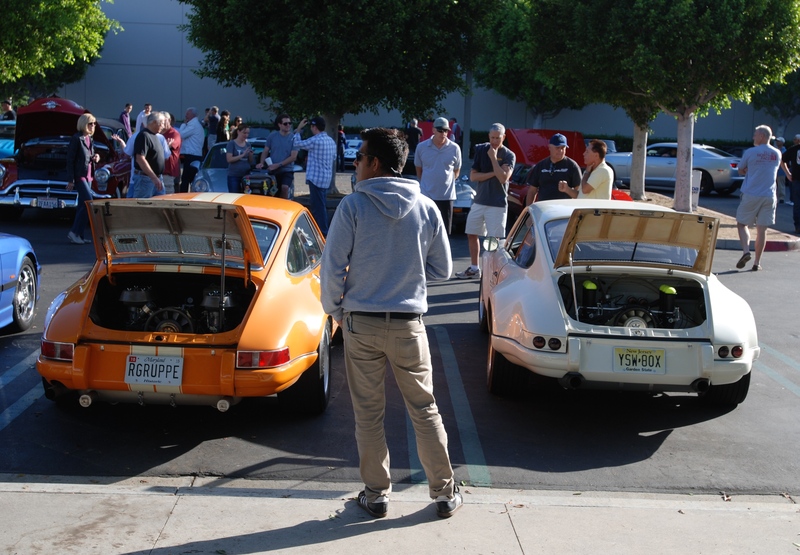 Best of luck to the entire TruSpeed team on your upcoming competitions. 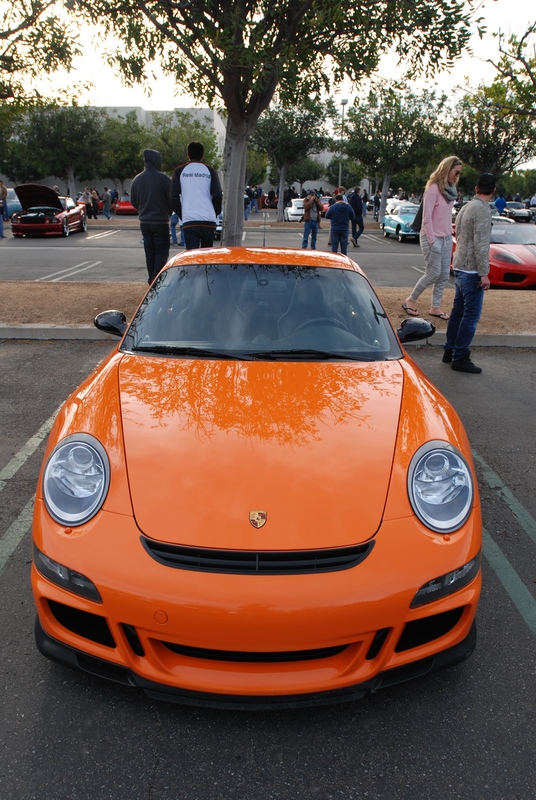 Saturday morning, January 4, 2014 dawned cool and clear, good weather I thought for the first cars&coffee of 2014. 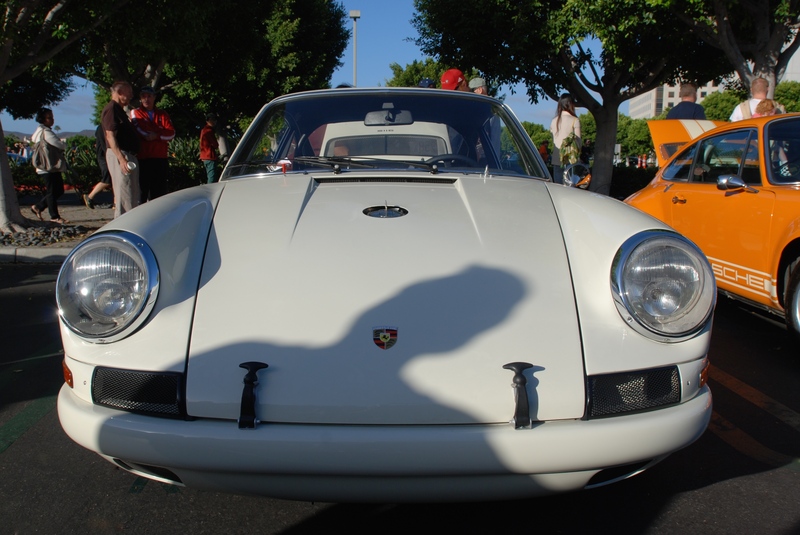 However, on my drive down to Irvine and just as I passed Anaheim, I was greeted by a dense fog bank that had descended across the freeway. 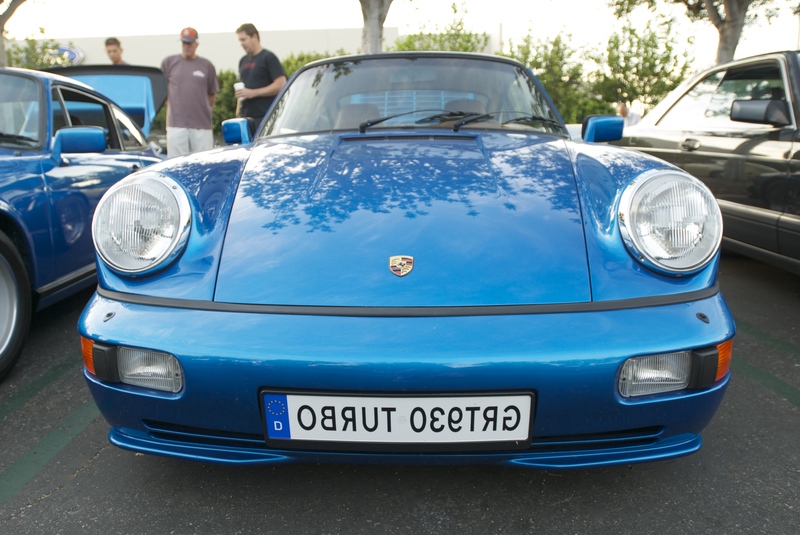 My immediate concern was that this fog was going to remain for the remainder of my drive. 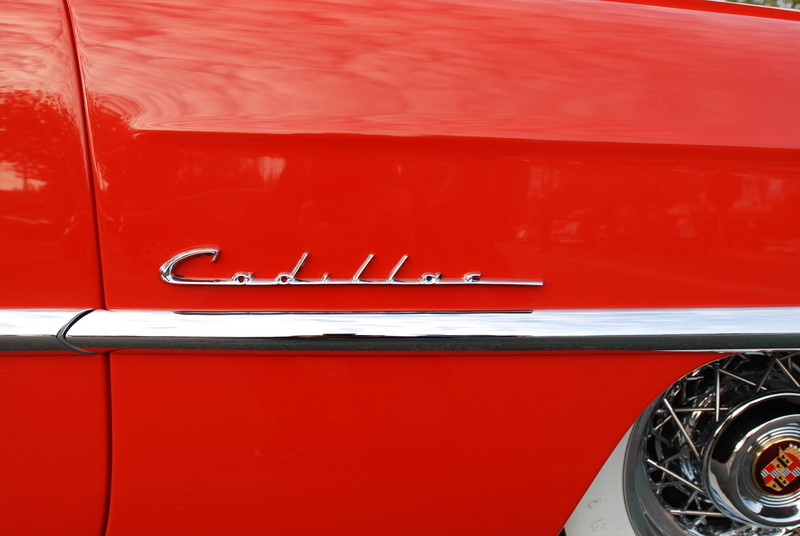 A couple of miles further south, the fog broke and once again I had a clear view. 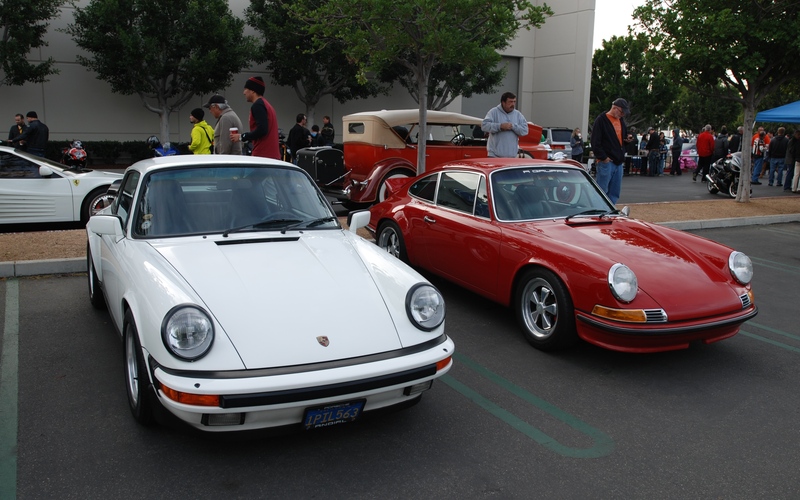 But unfortunately, as I approached Irvine, and starting at the Sand Canyon off ramp, the fog reappeared, now draped over the entire region. 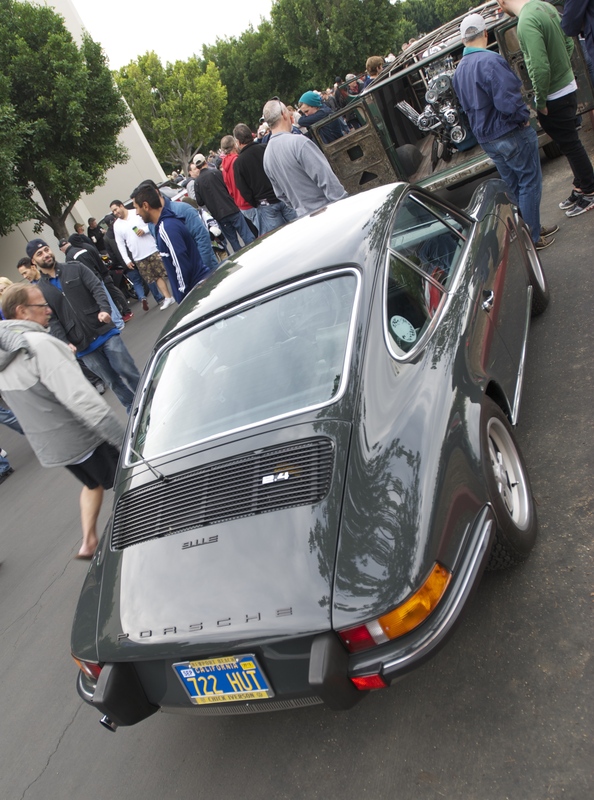 So under the cover of fog, I arrived at cars&coffee. 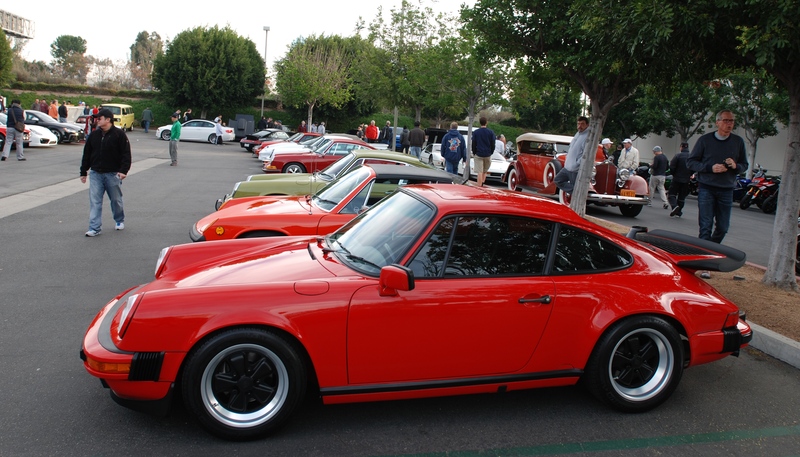 Much to my surprise, Porsche row was almost completely filled, and it was just 6AM ! 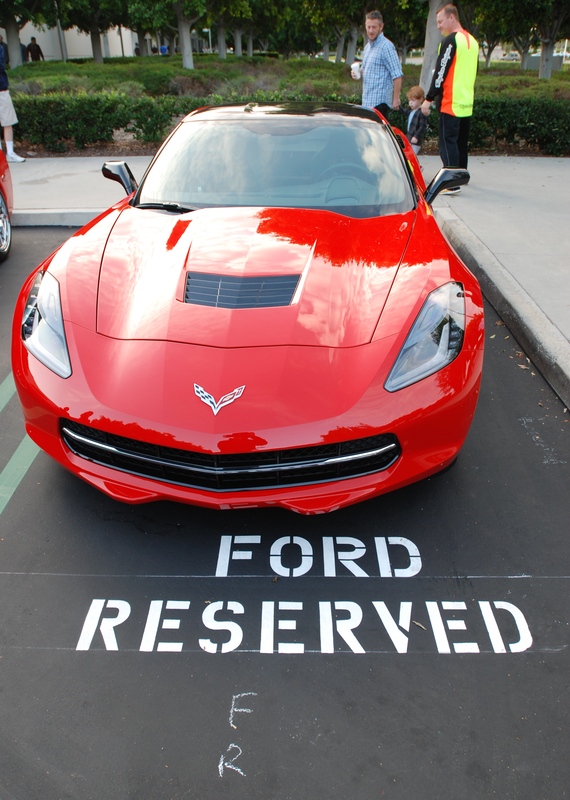 I was lucky enough to snag one of the last two remaining parking spaces on the row. 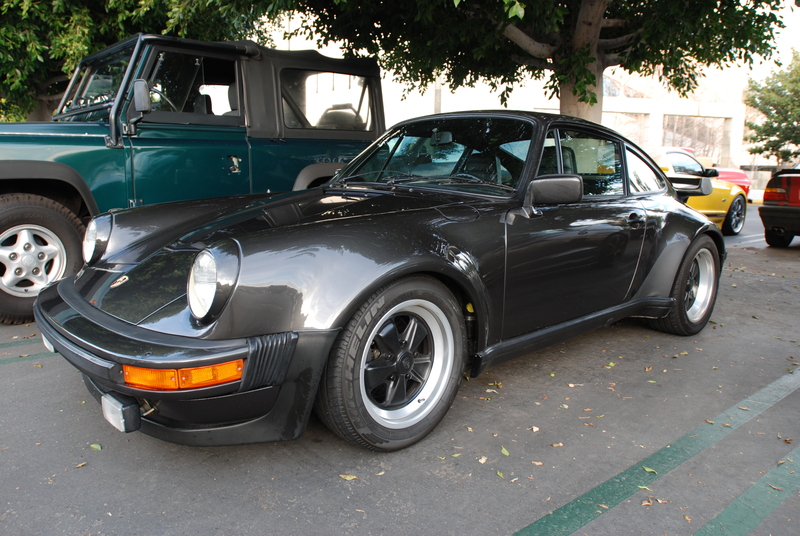 And keeping with tradition, my first stop was for my weekly donut and hot chocolate, and on this morning, hopefully it would be enough to fend off the damp, foggy morning. 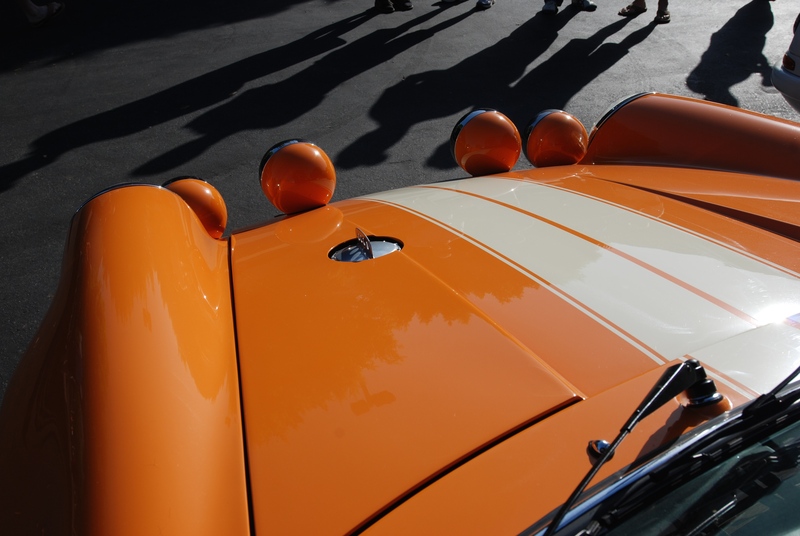 After grabbing my camera, it was time to begin my search for awaiting treasures. 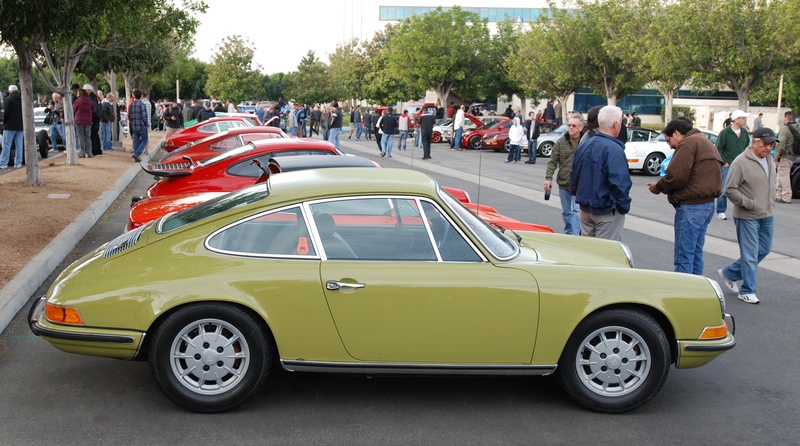 An extensive cache of Porsches assembled along Porsche row (below). 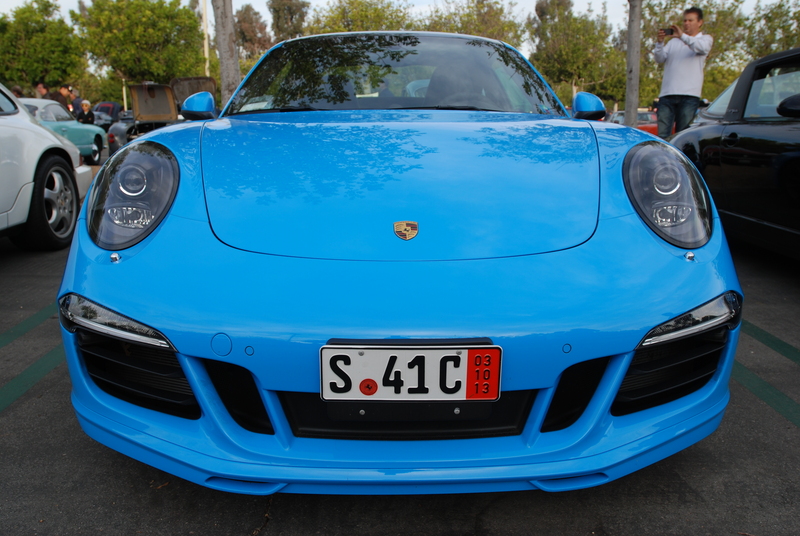 A return visit by the special order, Riviera Blue 2014 Porsche 991 coupe, wearing its Aerokit Cup option package. 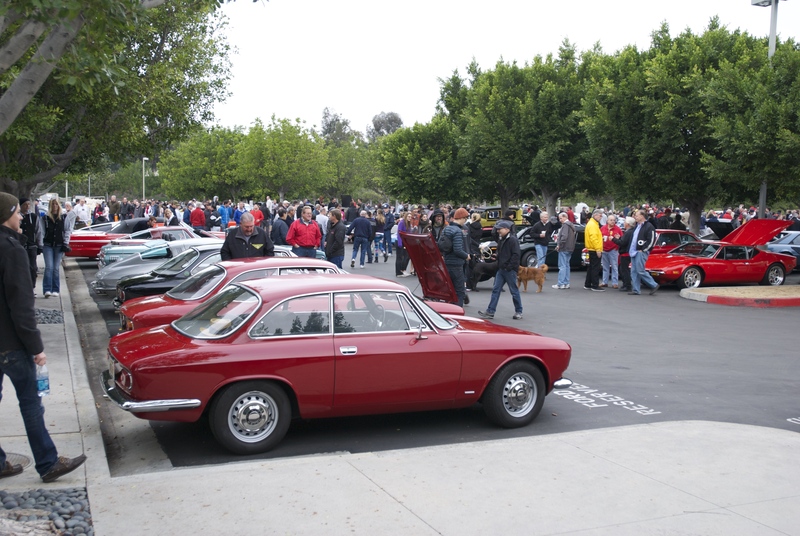 With the return of heavy crowds and no rain, those cars arriving late were relegated to the overflow lot. 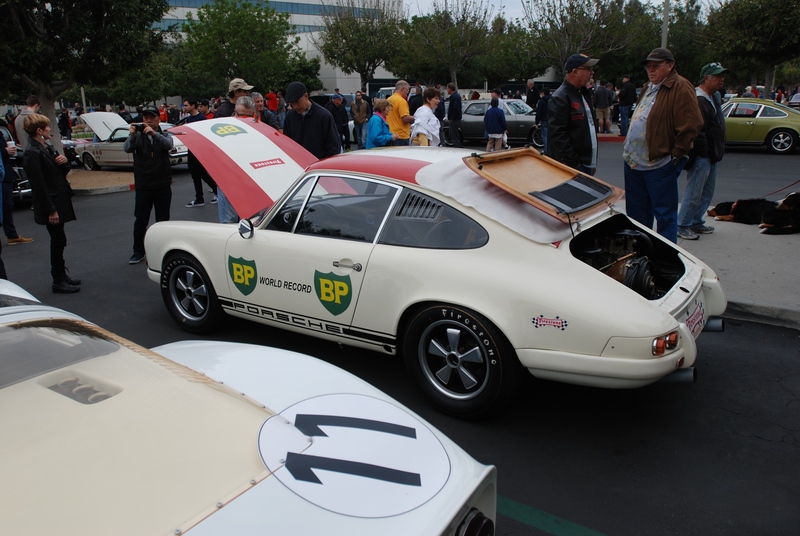 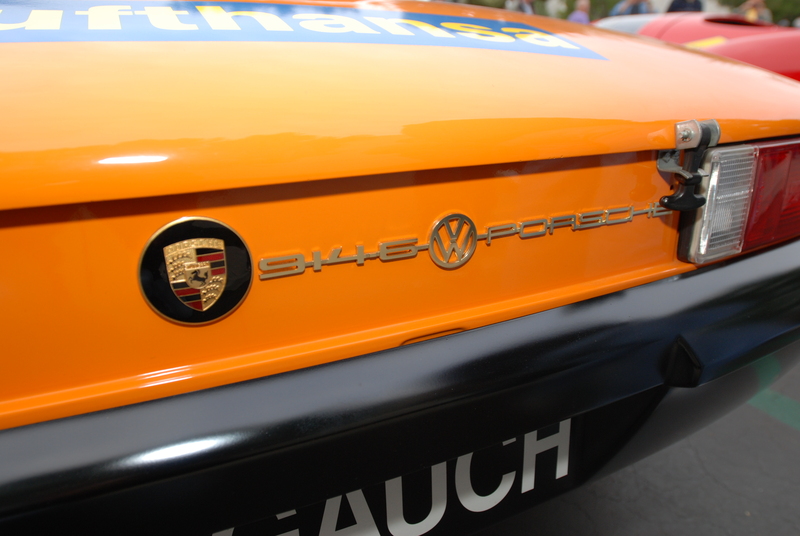 The following photos represent several very cool Porsches that found themselves redirected to the overflow space. 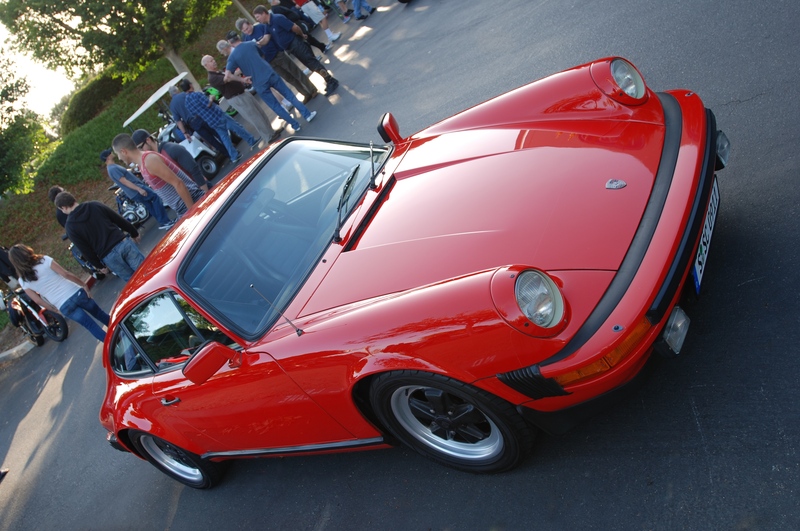 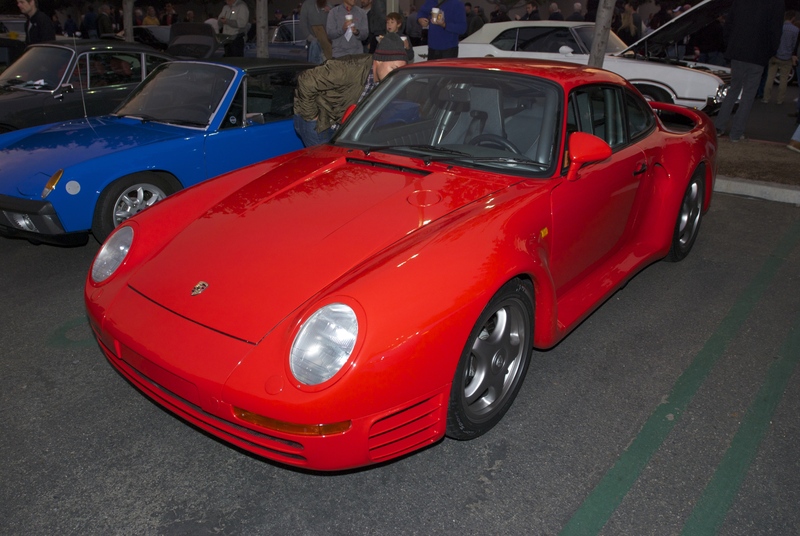 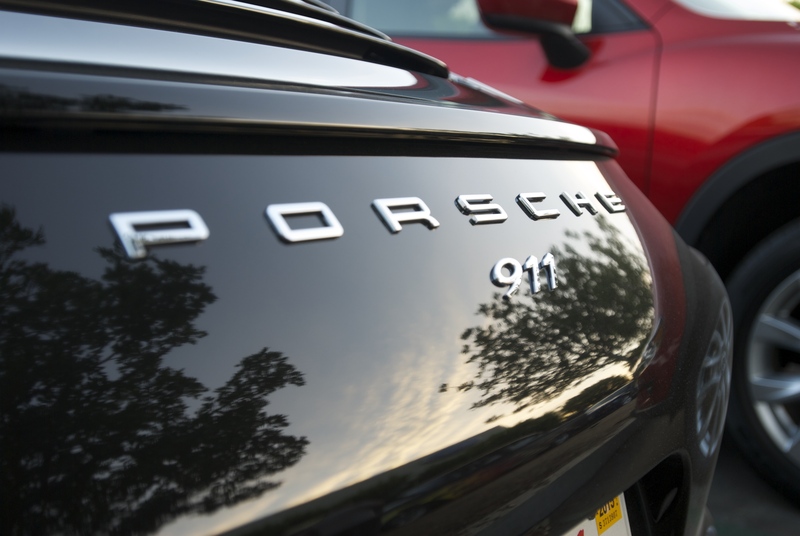 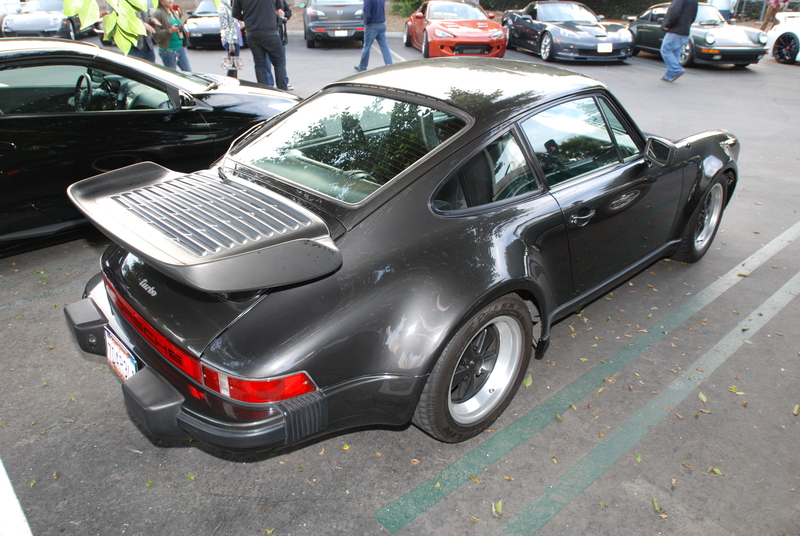 The first Porsche encountered was the charcoal gray 930 turbo below. 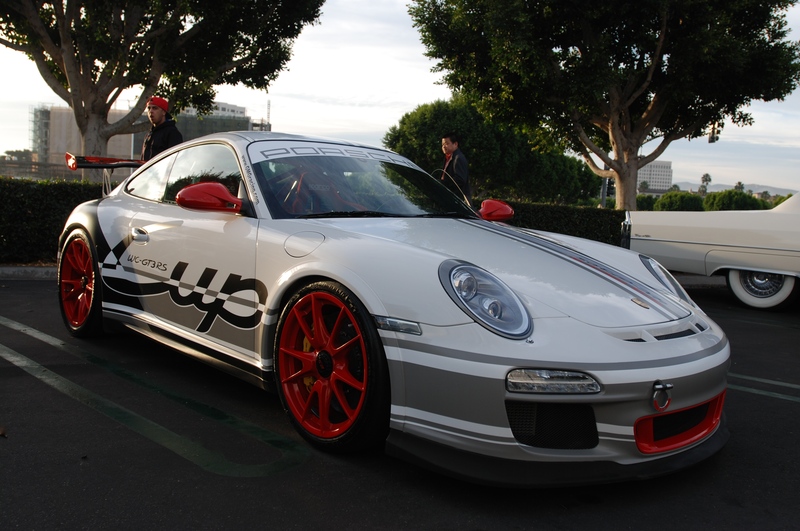 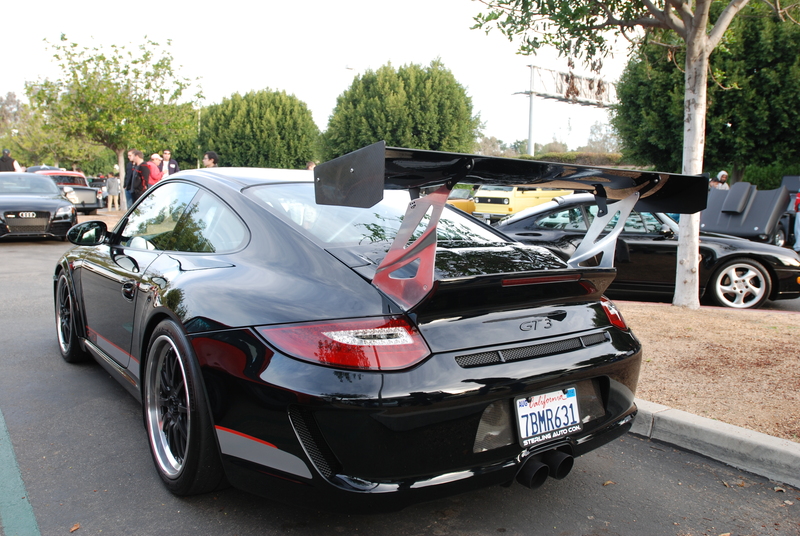 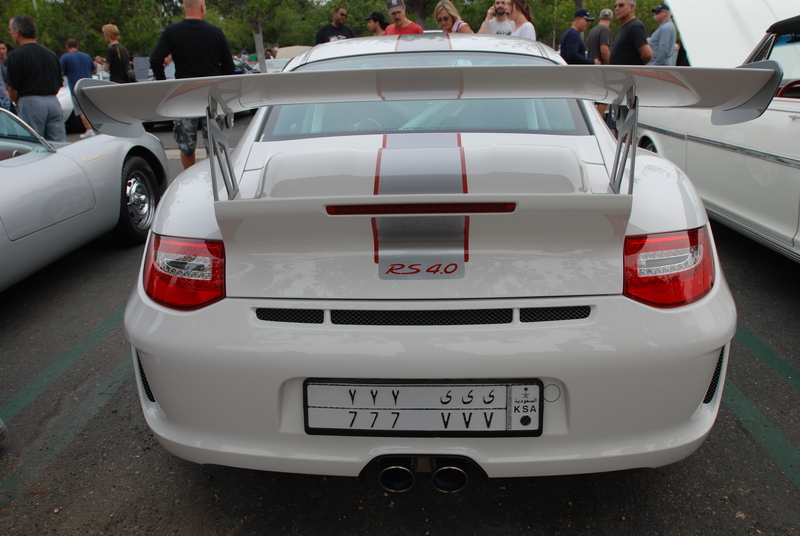 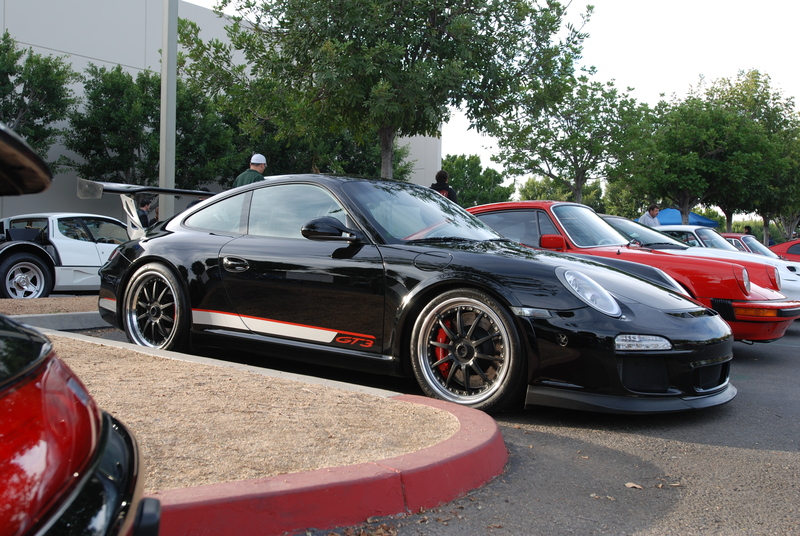 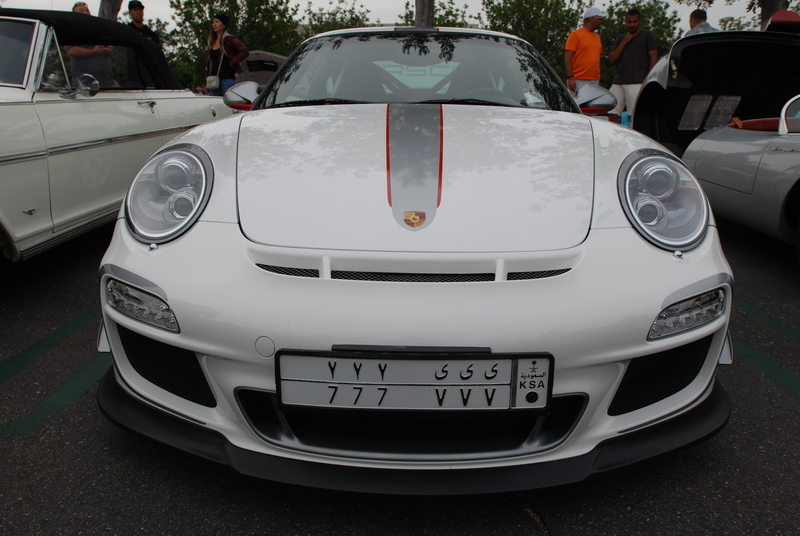 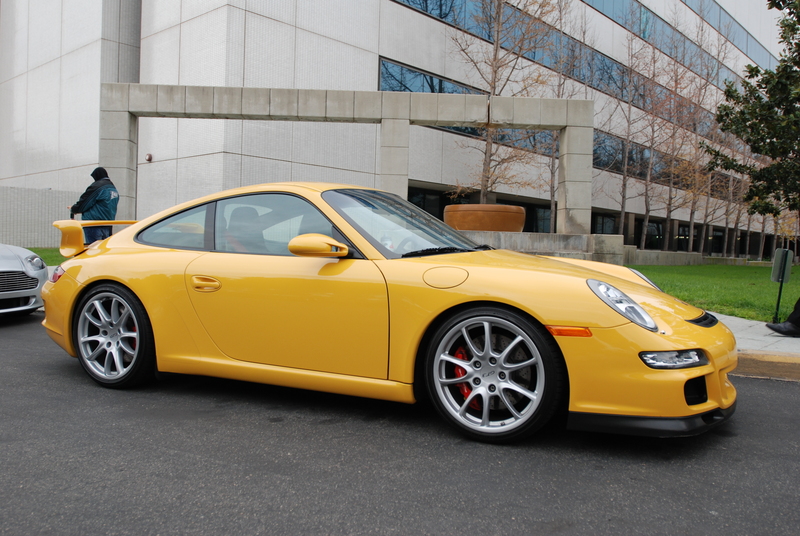 The second Porsche was the 997 GT3 seen below, complete with an extensive graphics wrap. 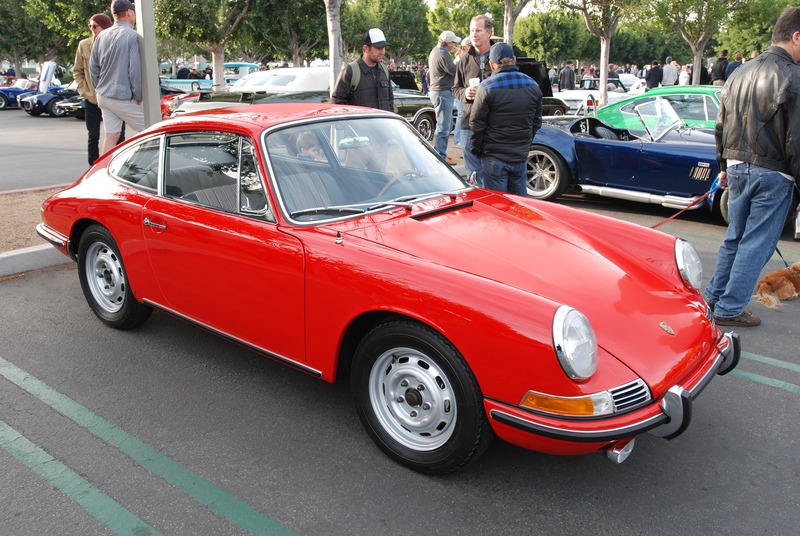 Back on Porsche row, a friends signal red 1966 911, having shed its Fuchs 5 spoke alloy wheels for a set of original issue, period correct 4 -1/2″ X 15″ steel wheels. 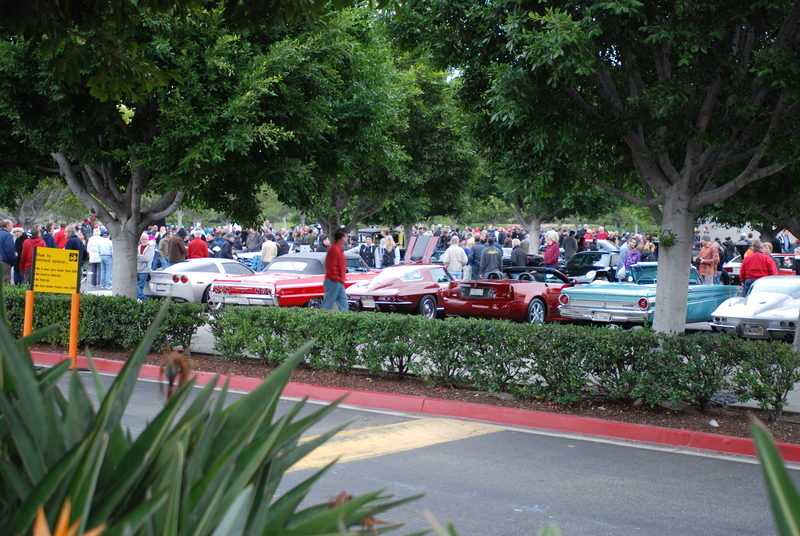 Given the number of cars assembled each week, it helps to have friends who walk the rows, and check out the cars present. 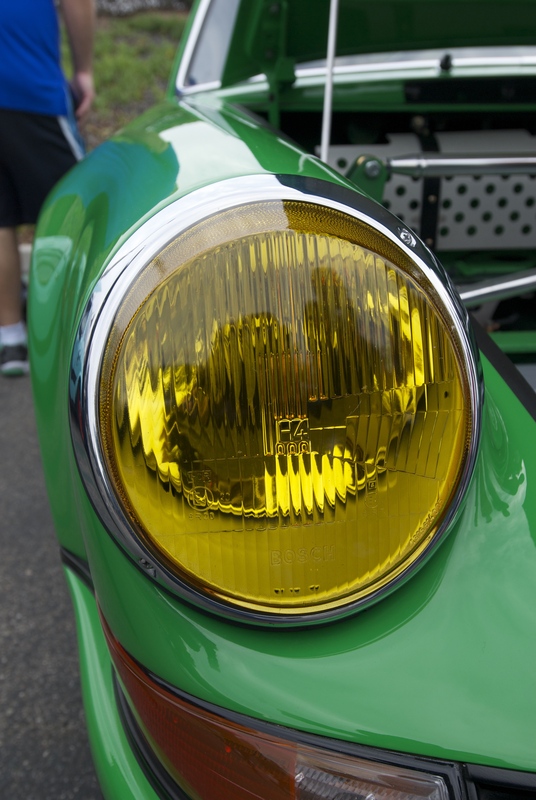 That way, if something really catches their attention, they are nice enough to share their discoveries with me for photographic consideration. 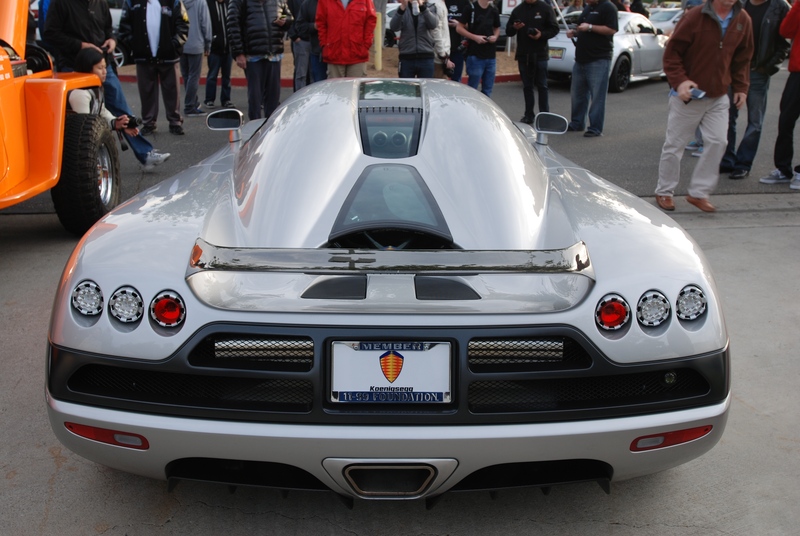 That was exactly how I learned of the Koenigsegg CCX, parked out in the back rows of the lot. 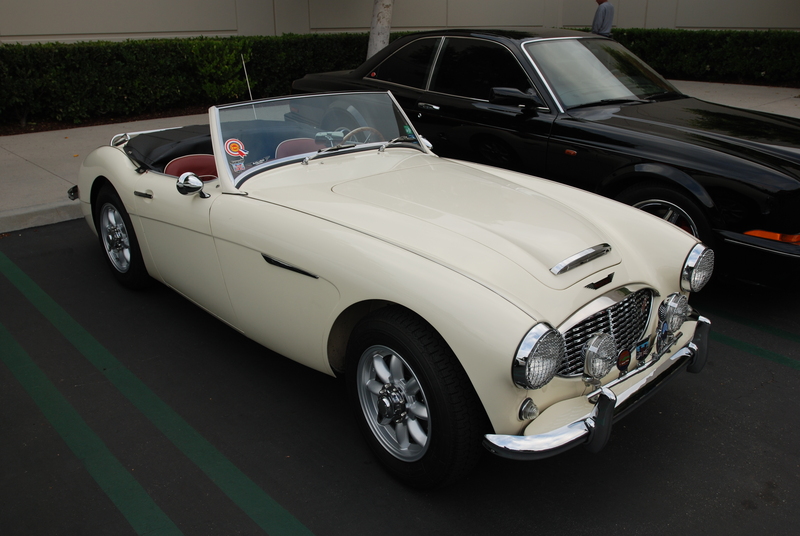 I had only seen the car in magazines, so this was my first time seeing one in person. 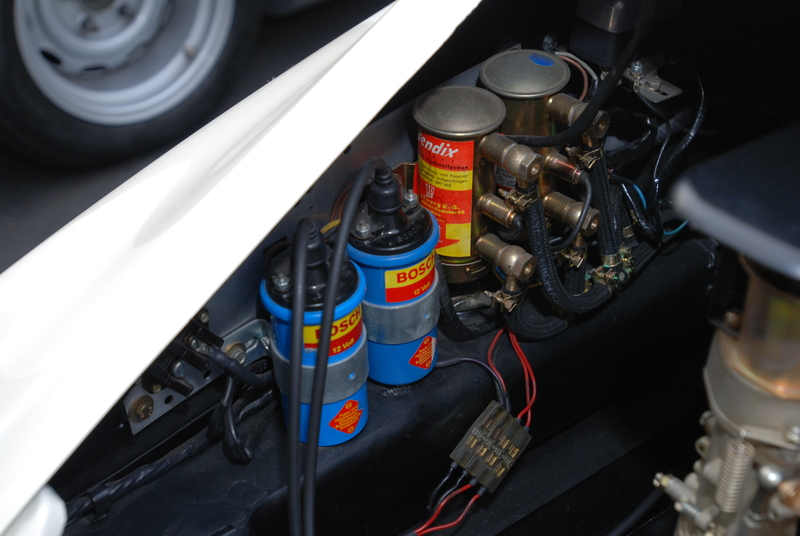 Not knowing much about the details relating to this car, I decided some research was in order. 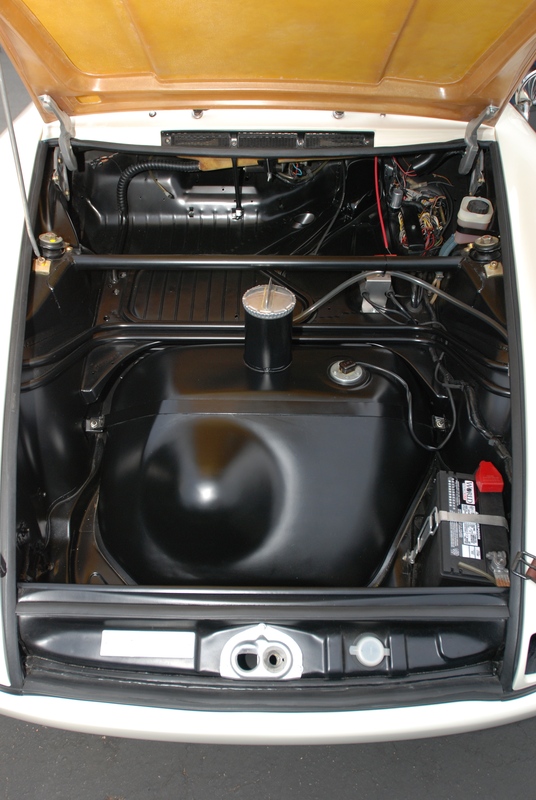 I quickly learned that the mid engined super car seen below was manufactured in Angelholm, Sweden and that this was a CCX model, and equipped with the optional rear spoiler. 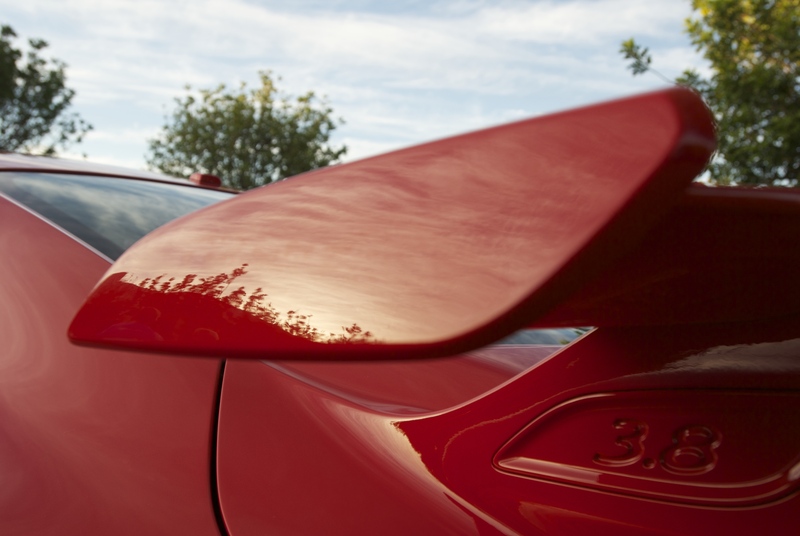 The CCX designation stands for “Competition Coupe 10”, celebrating the 10 year anniversary of the first Koenigsegg competition coupe produced. 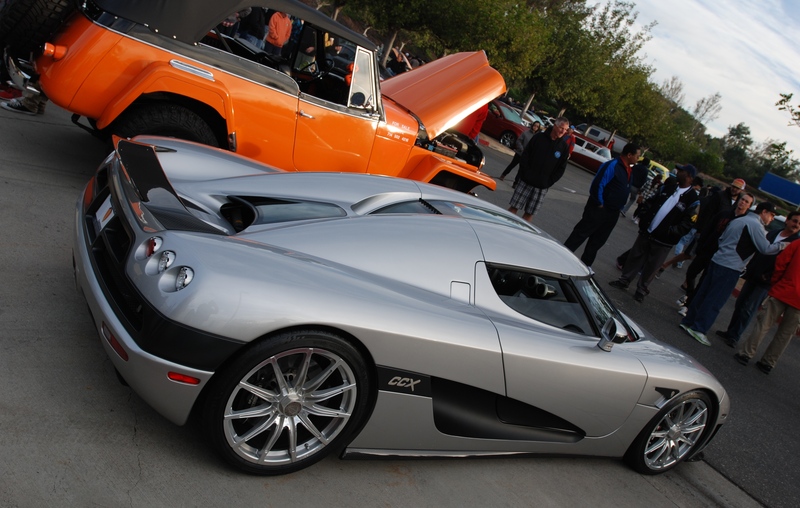 The CCX model was produced from 2006 through 2010, with only 14 CCX models delivered. 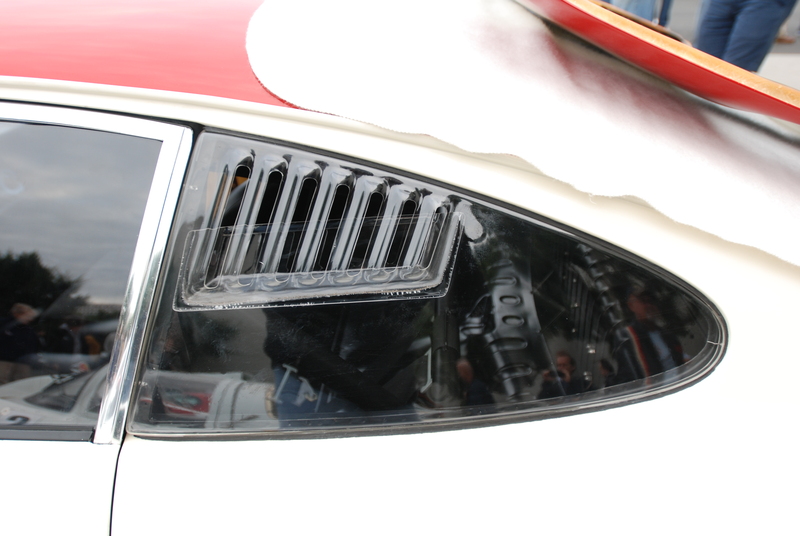 Located beneath the rear glass window, is the Koenigsegg’s aluminum, DOHC 4.7 liter, twin supercharged V8, producing 806 bhp. 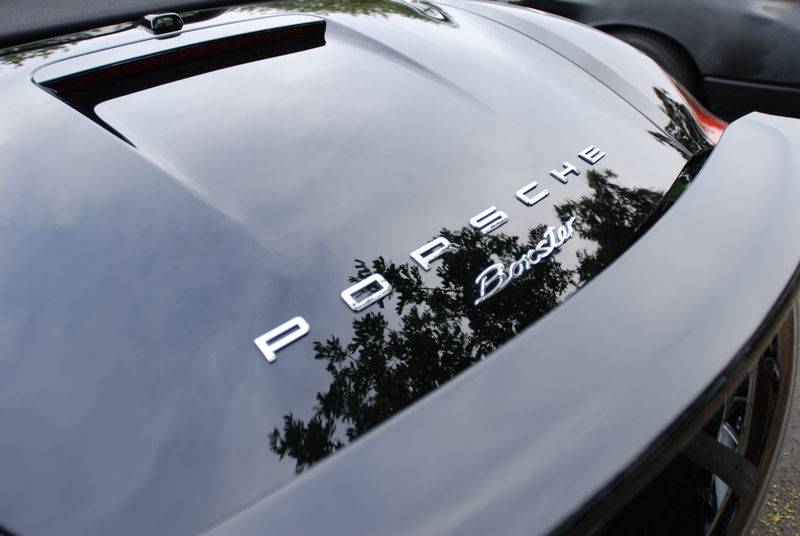 Power is transferred to the rear wheels by a 6- speed transmission, reported to be good for delivering a top speed of 245 mph. 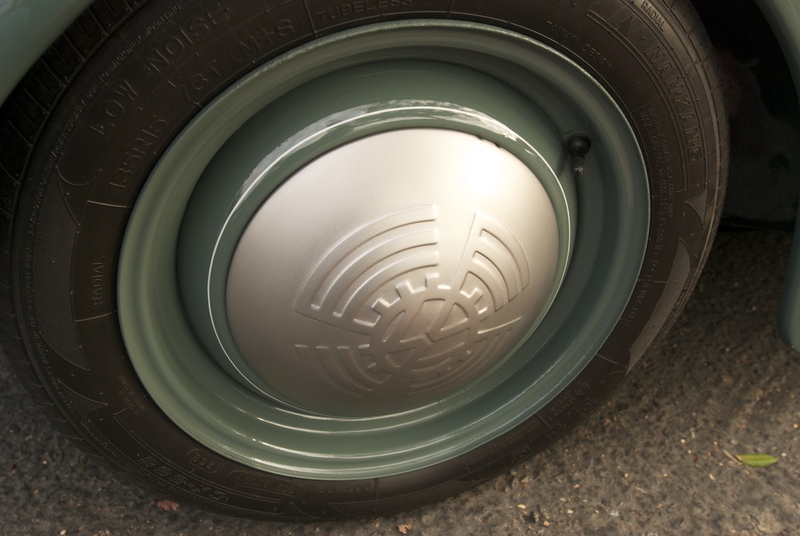 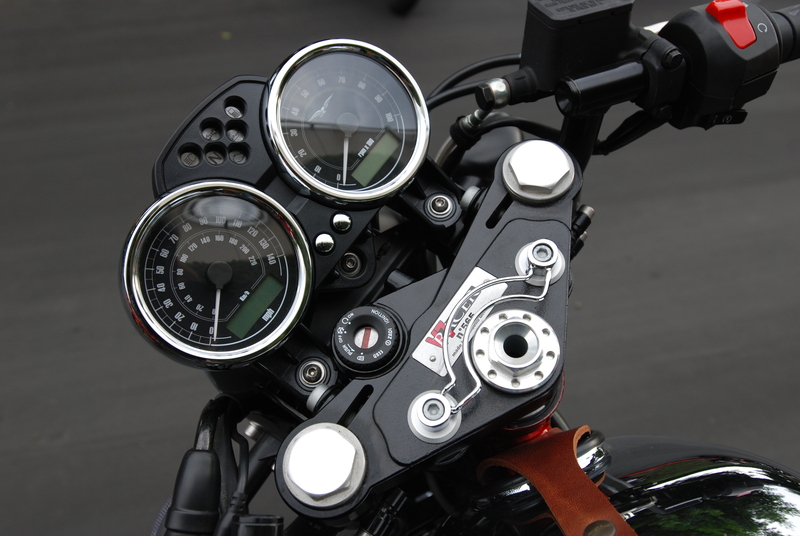 The 12 spoke wheels found on the CCX are a unique Konigsegg design, and sized 9.5″ X 19″ up front, 12.5″ X 20″ out back. 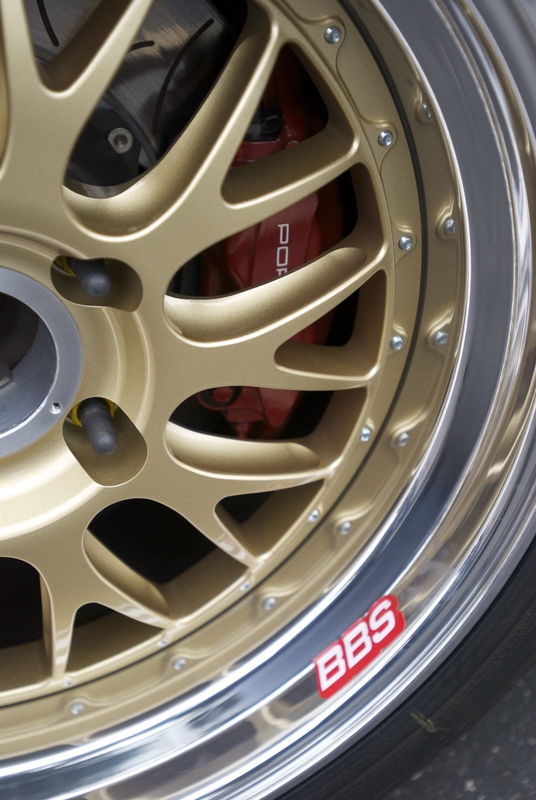 Grip is provided by a set of Michelin Pilot sport tires, with stopping power provided by a set of Brembo 8 piston calipers up front, and AP racing calipers out back. 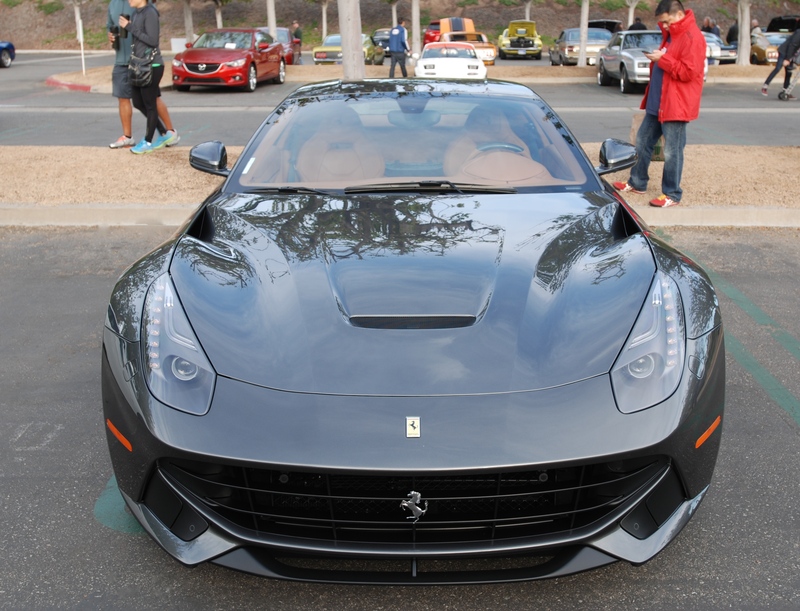 Another exotic parked only several rows away was the Ferrari F12Berlinetta seen below. 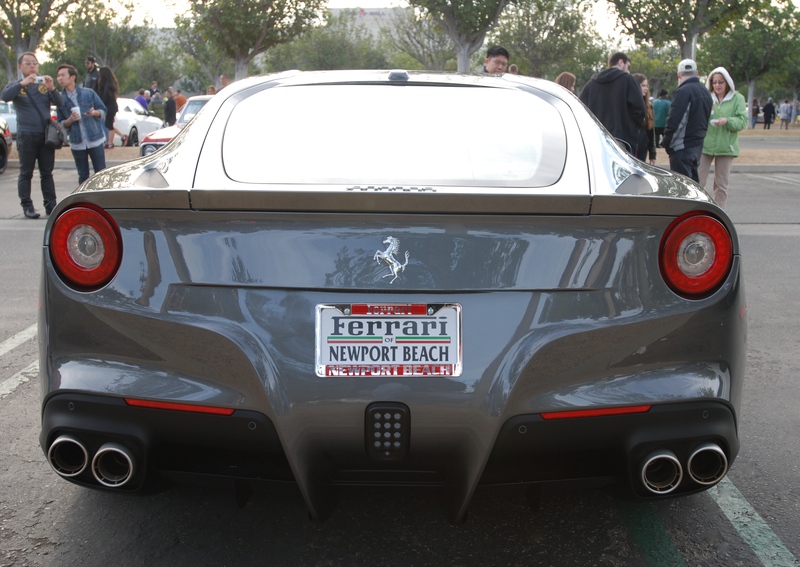 At first glance, I thought it to be a Ferrari 599, but as I got closer, I realized that it was in fact a brand new F12Berlinetta. 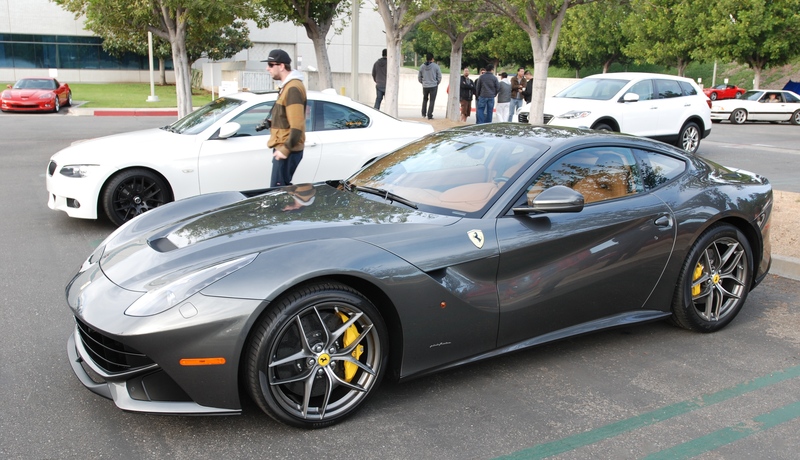 Ferrari designed the F12 as the replacement for their 599 model, with production initiated in 2012. 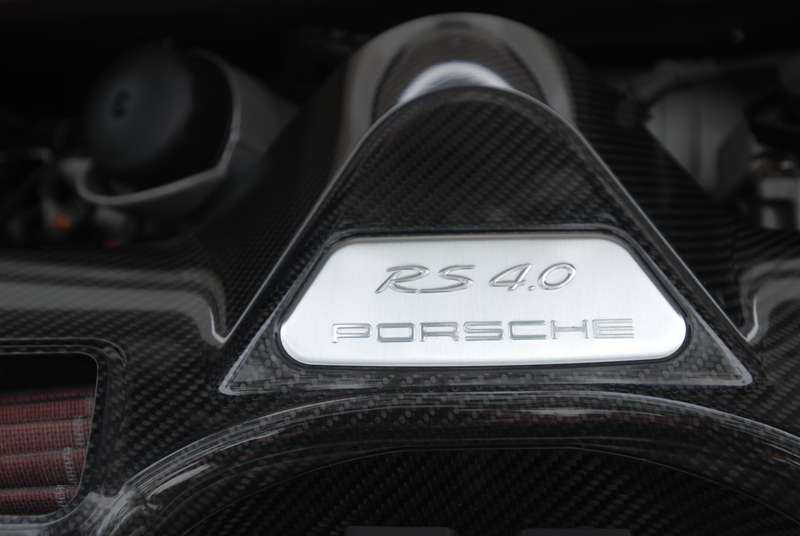 Propulsion for this model is provided by a 6.3 liter, V-12 motor, producing 730 horsepower, able to deliver a top speed of 210 + mph. 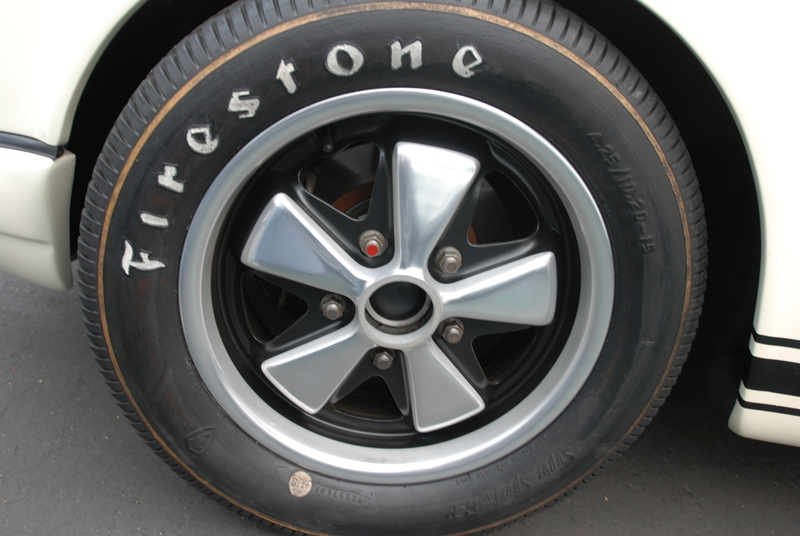 The wheel / tire combination for the F12Berlinetta is as follows: Front tires are 255/35ZR20, mounted to a 9.5J X 20 wheel. 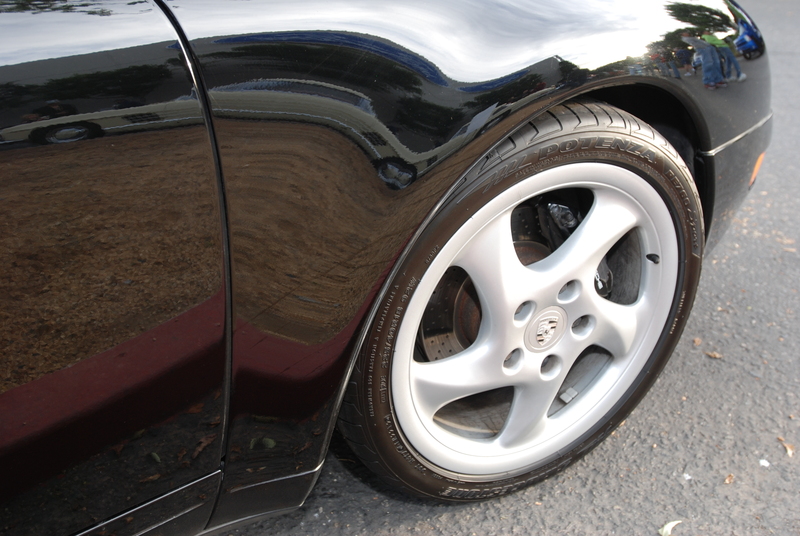 The rear tires are sized at 315/35ZR20, and mounted to rear wheels measuring 11.5J X 20. 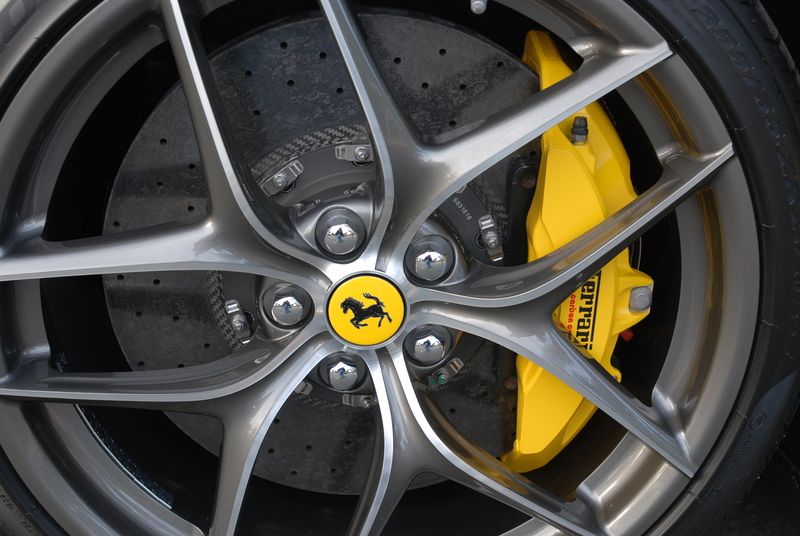 Stopping power is provided by Ferrari’s Carbon Ceramic brake system (CCM), and on this particular car equipped with brake calipers painted Giallo Modena (yellow). 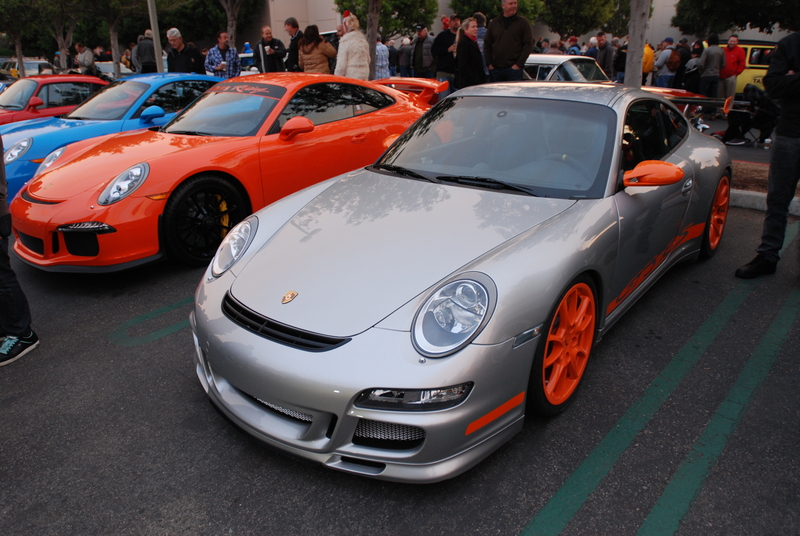 My last stop of the morning was to check out one of my personal favorites: the brilliant orange 2007 911 GT3RS seen below. 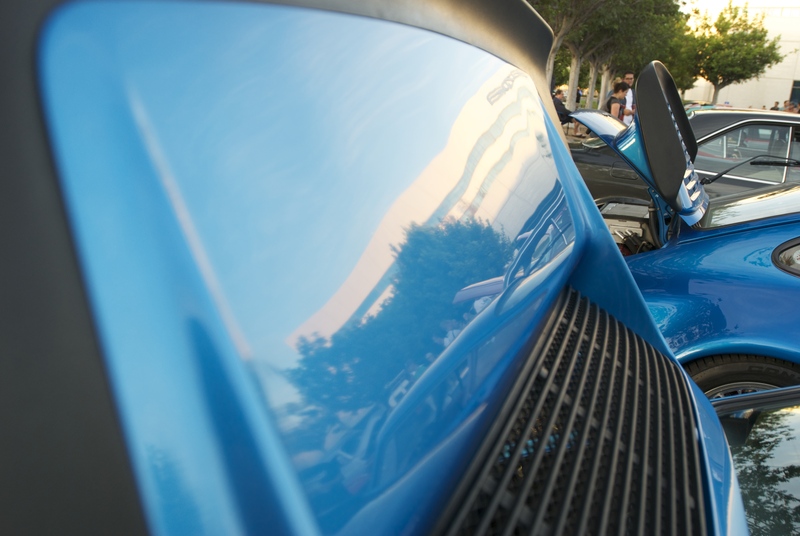 purpose built and exuding cool from every angle. 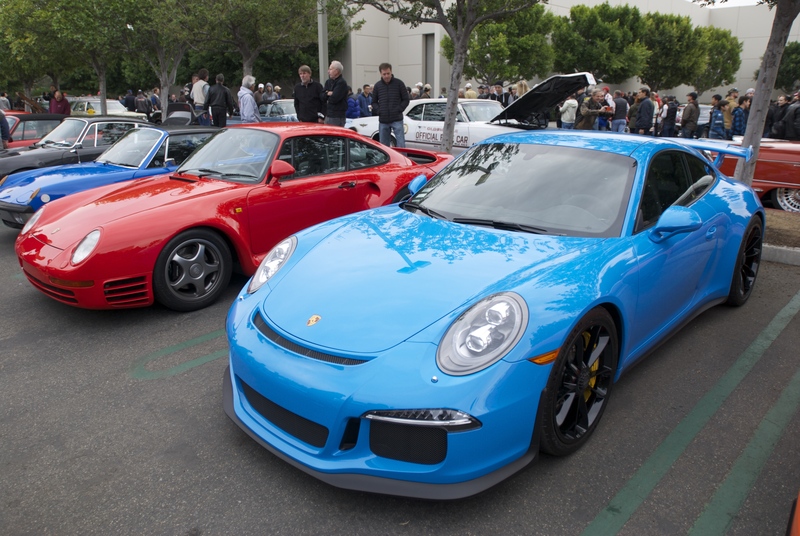 As southern California continues to enjoy its uncharacteristically warm winter, and with no rain in sight, the crowds at cars&coffee continue to grow each week. 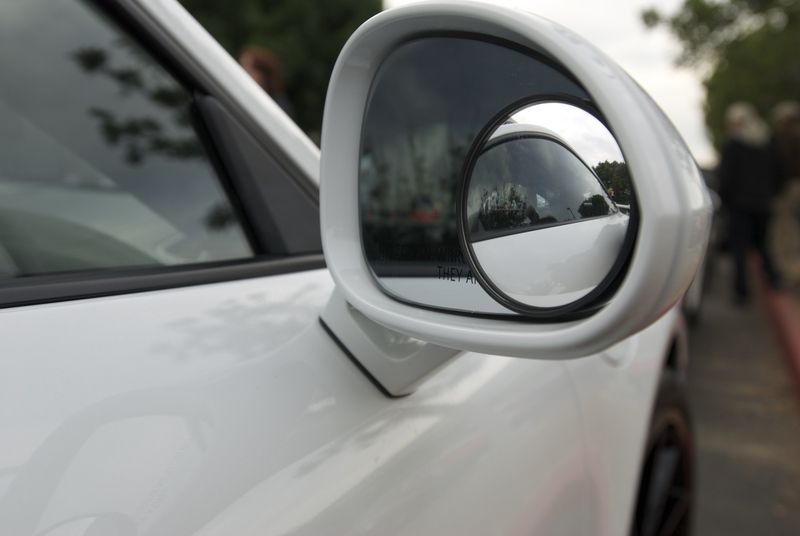 As a result, arrival time ( 6 AM or earlier) has become increasingly important. 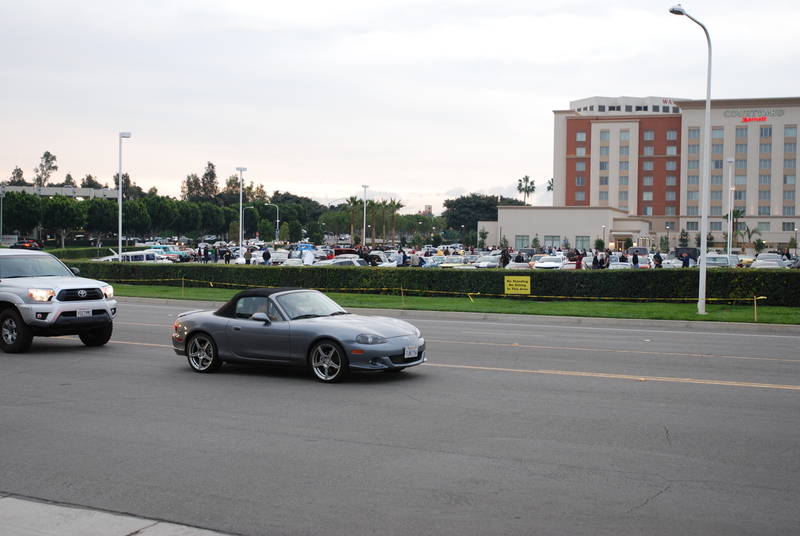 A late arrival will result in bing directed to the overflow lot. 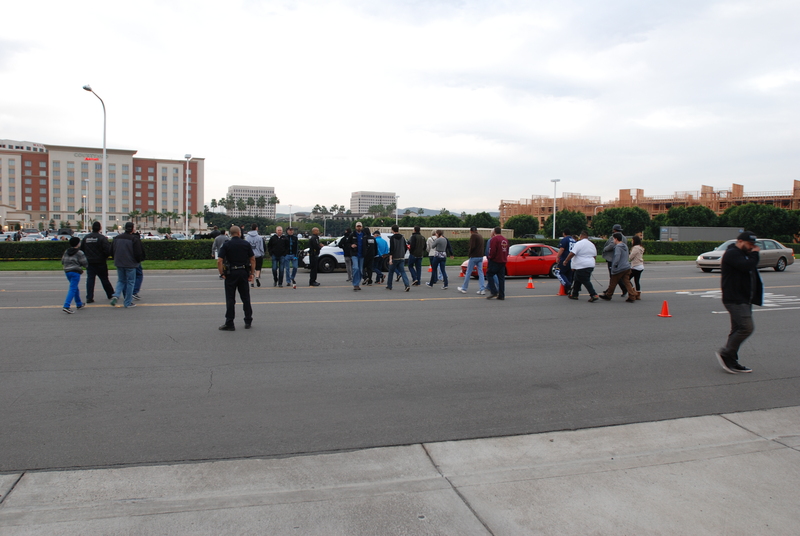 At least it’s better than being unable to enter the show at all because of overcrowding. 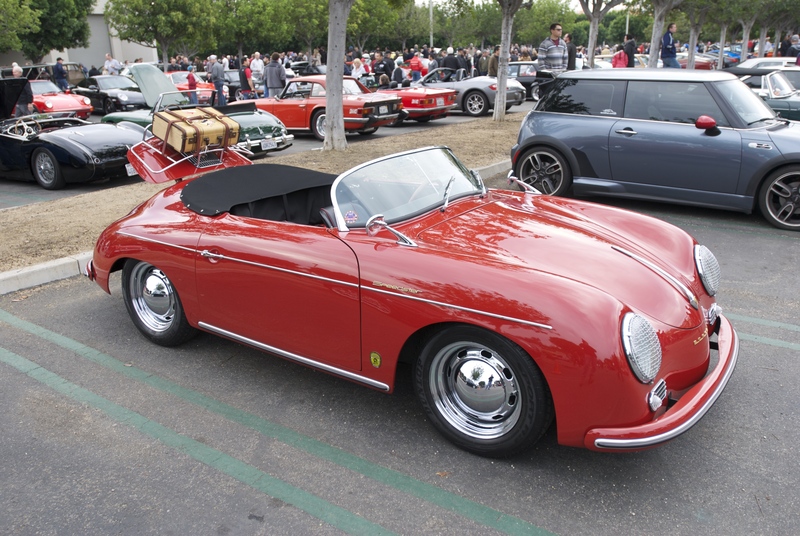 Given the forecast of another weekend of warm weather, this coming Saturday morning promises to be a repeat of the last; bursting at the seams with truly amazing cars.